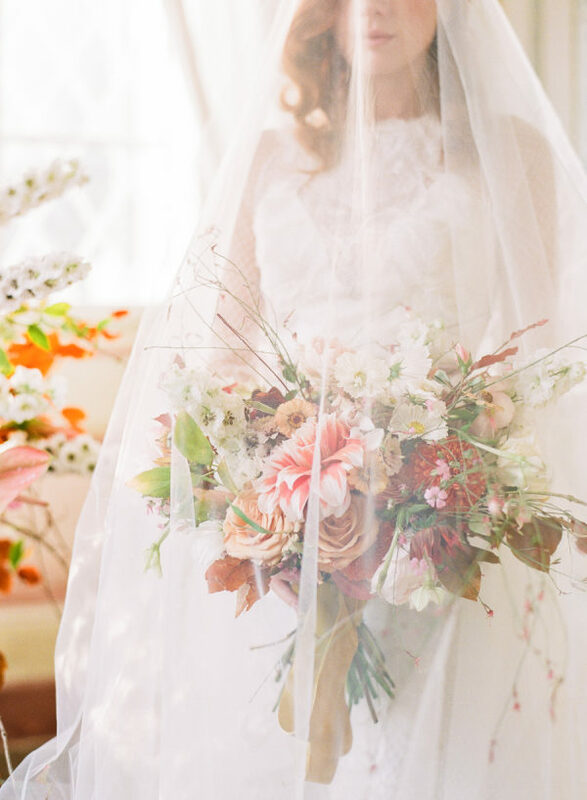 All at once, this wedding feels like it took place 100 years ago and 100 years from now. 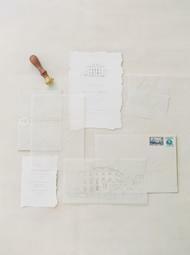 It truly is the loveliest blueprint for what a timeless celebration looks like. 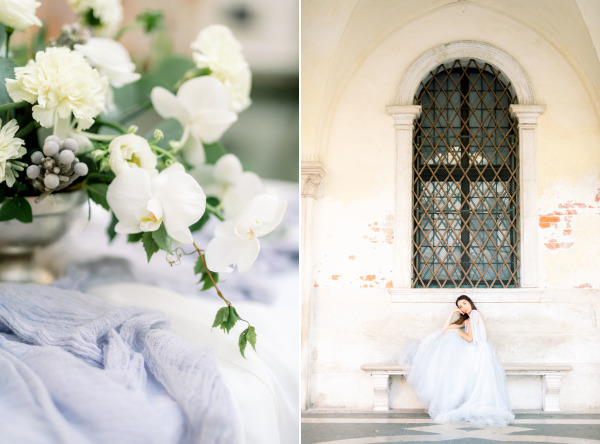 Oliver Fly‘s imagery seems to float off the screen with beauty, and contained in each moment are charming details planned by The Wedding Boutique Italy. I don’t doubt that you’ll get lost while perusing the full gallery. 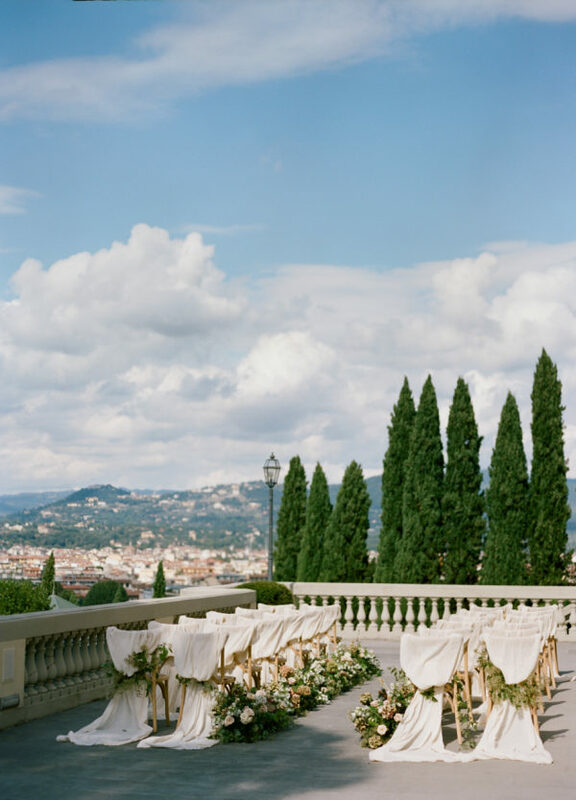 From the beginning, we wanted a romantic and timeless wedding, and we used dusty blue as our main wedding colour, which was inspired by the colour of the view from Terrazza dell’Infinito at Villa Cimbrone. 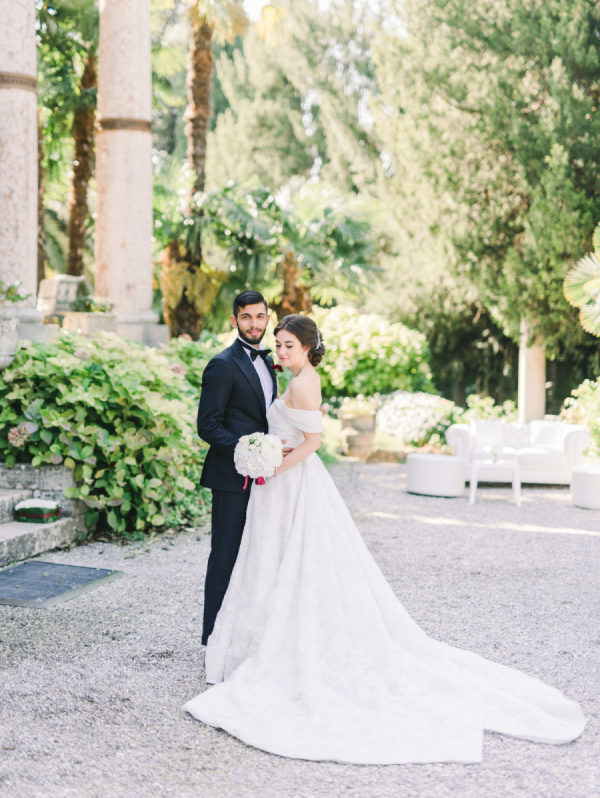 Why did you choose to do a Destination Wedding and why did you decide to choose Italy and Villa Cimbrone as your final choice? Usually weddings in Jakarta are very grand, around 1000-3000 guests. 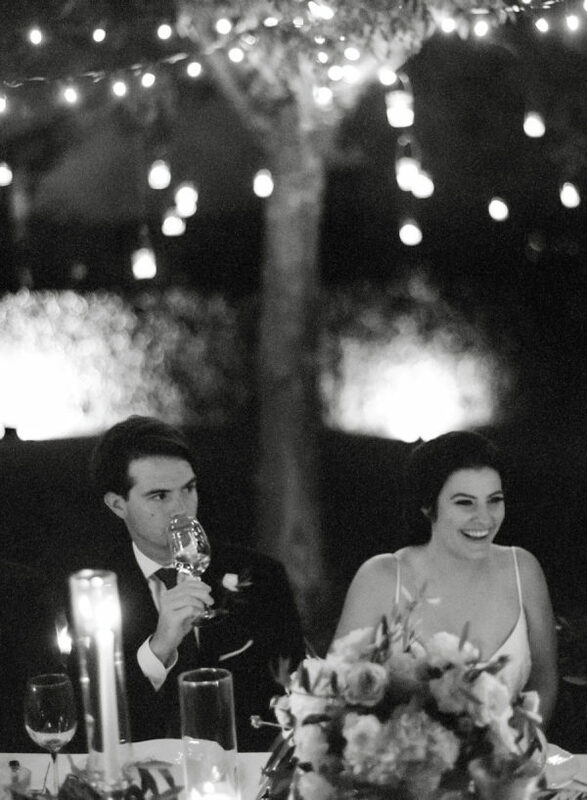 Aston and I were always fond of a small intimate wedding, where we can spend more time with our closest family and friends. 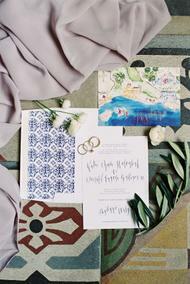 We could only have had a small wedding by doing a destination wedding. 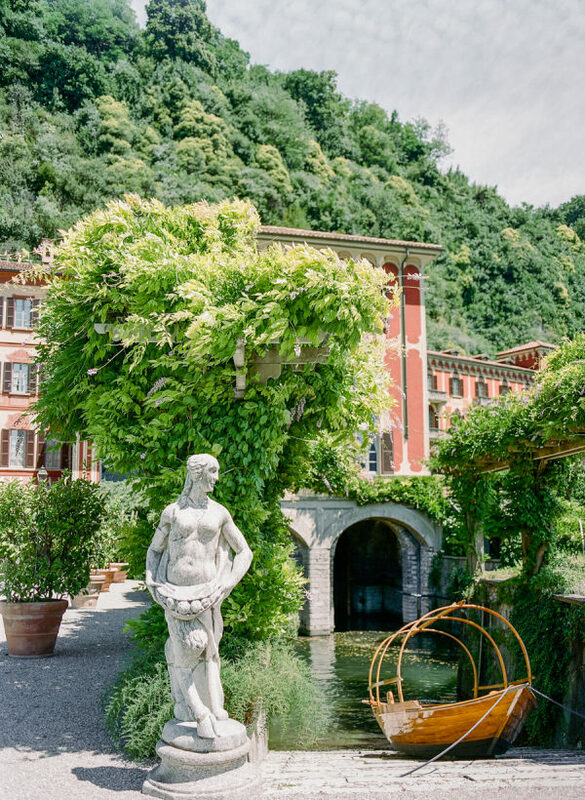 We visited Villa Cimbrone last year for a summer vacation and it was indeed the most beautiful place we had ever seen on our travels. 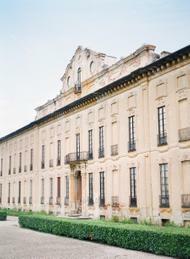 Villa Cimbrone came right into our minds when we were thinking about the place to hold our small and intimate wedding. 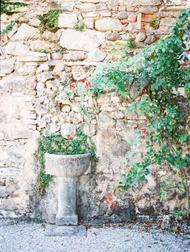 The Villa was grand and beautiful, it has so many different sections of garden, so many areas to be explored, as well as being based in the a wonderful Ravello on the Amalfi Coast. 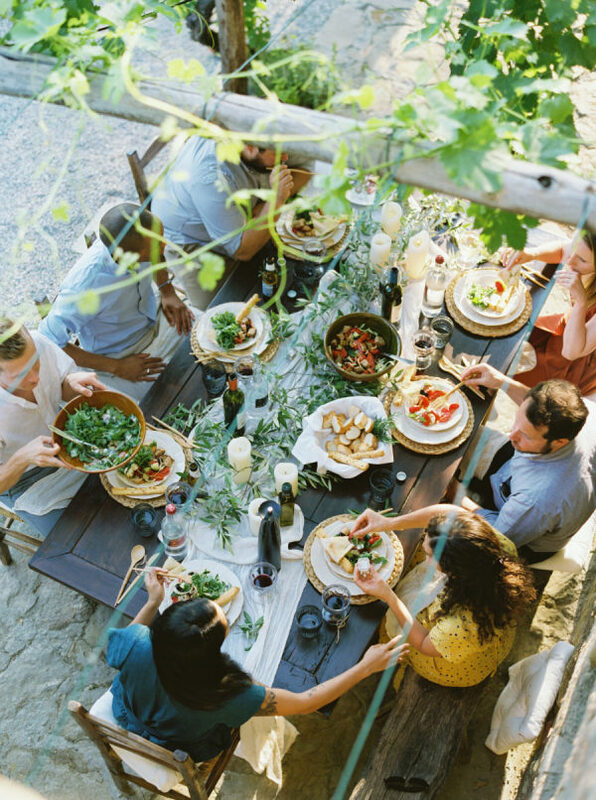 Because our family and friends were going to travel so far for us, we wanted to make sure our guests had an amazing and unforgettable experience. 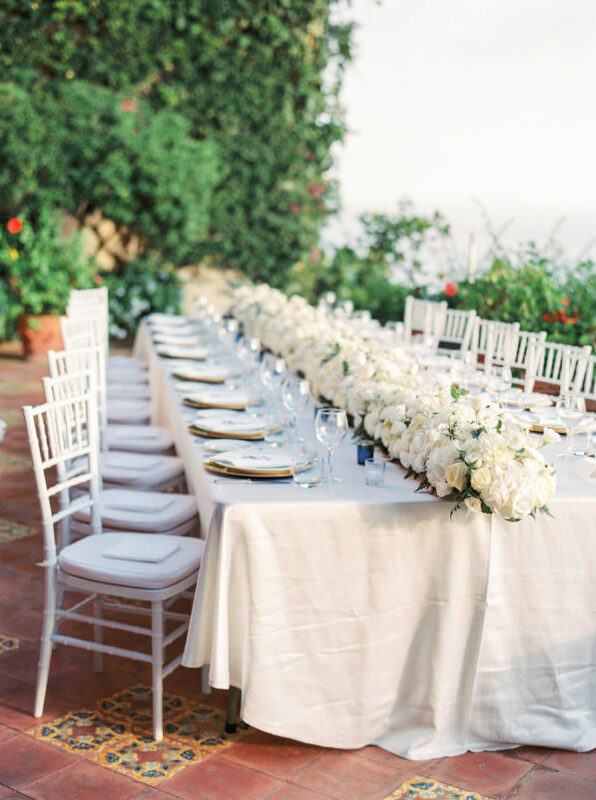 We therefore planned the best events we could offer for them, starting by welcoming our guests with sunset cocktails at Belmond Hotel Caruso, then choosing to hold our holy matrimony at The Cathedral of St. Andrew in Amalfi because it is magnificent. The church is dedicated to the Apostle Saint Andrew whose relics are kept there. 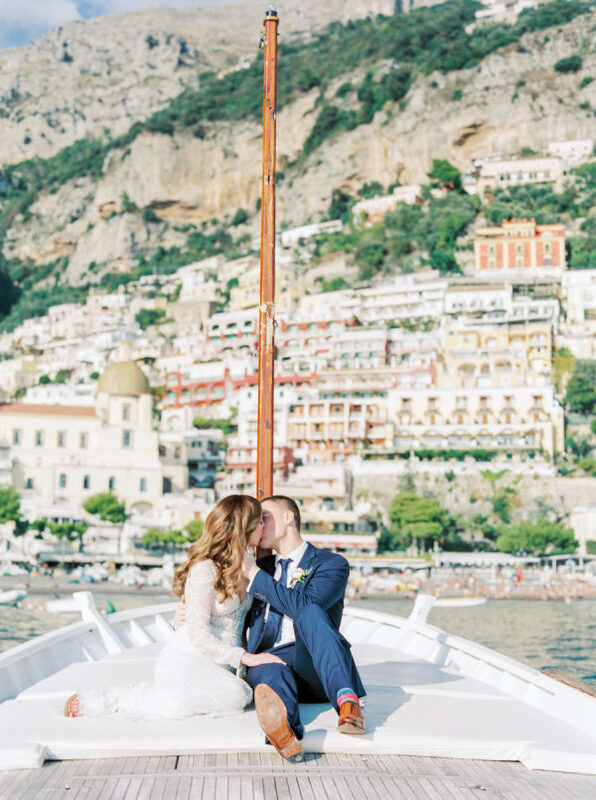 Then we had our wedding reception in Villa Cimbrone, and the next day we held a farewell boat party with the guests to show the beautiful Amalfi Coast from the sea, with stopover in Positano. 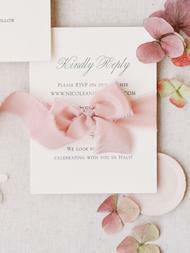 Dusty blue, blush pink, vintage gold, white ivory, with modern classic style. 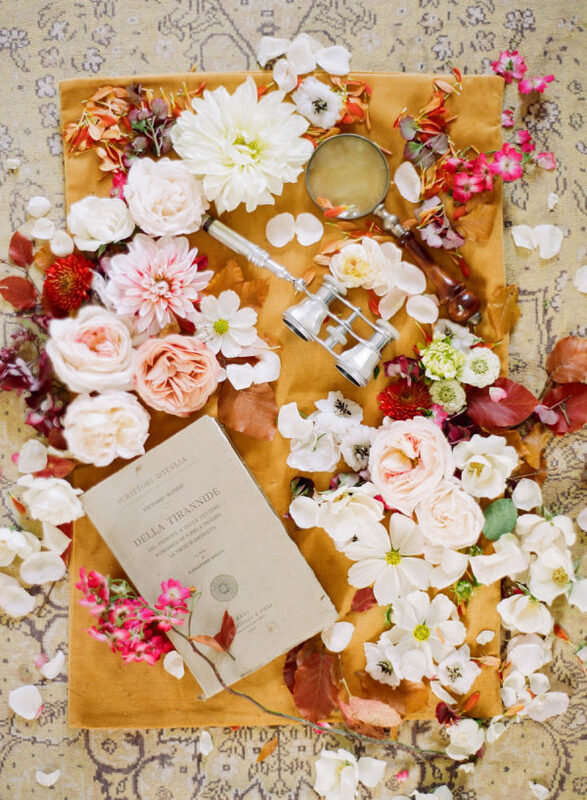 The things that we decided to DIY were paper cones for petal confetti, ribbons for menu decoration, seating plan poster, table runner and holy matrimony book. 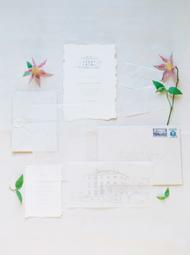 We were very hands on planning the wedding, so that our guests could also feel that the whole wedding was unique in Aston & Stella’s way. Our favourite moment of the wedding was the first time we looked at each other for the in the Cathedral for our Holy Matrimony. 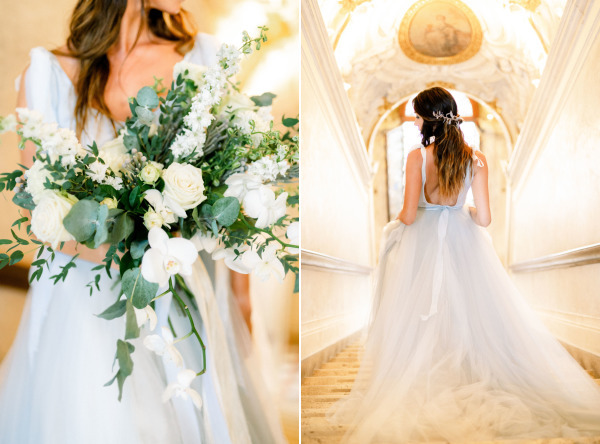 Aston had never seen me in my wedding gown until then, because he wanted to experience that feeling and ‘first look moment’ when he first saw me in the Cathedral. What were your favorite details of the day? 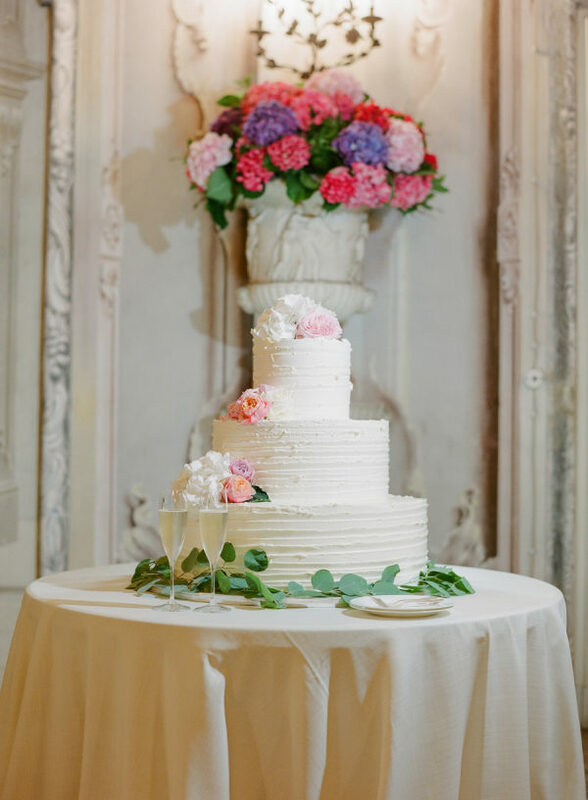 For our wedding cake, the wedding designer Made In Cake was from Provence. 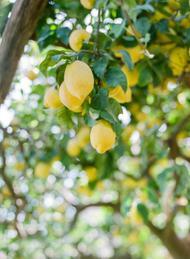 But we specifically asked her to use Amalfi Lemons for the flavour, to express the essence of our wedding venue. 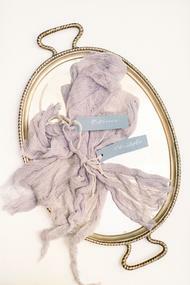 At last minute, the colour of handmade dyed ribbons for bouquets came out to be very different than what we ordered, so together with my Bridesmaids, we found a solution by making our own silk ribbon for the bouquet. My husband gave a personalized pin to each groomsman that says the character of that groomsman, the meaning of that was each of the groomsman represents that character of the groom. 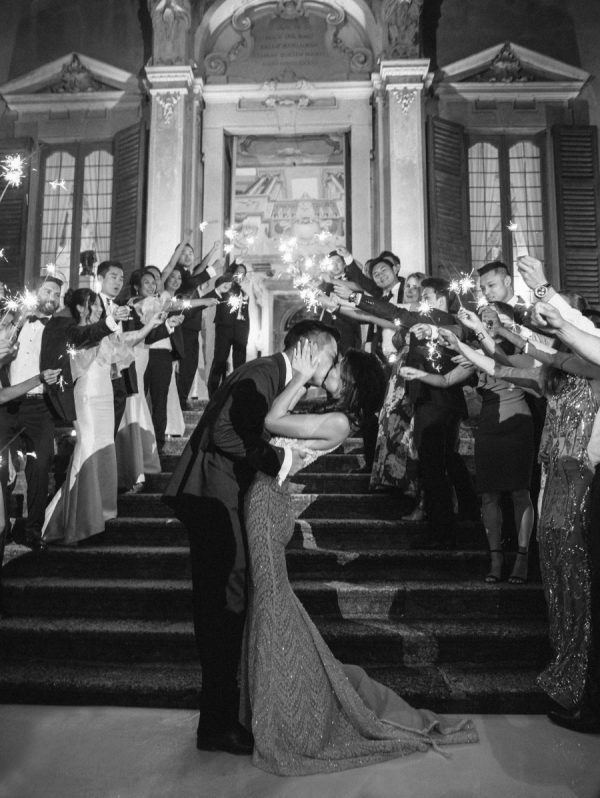 For my wedding gown, my bridal store was Truly Enamoured in Singapore. 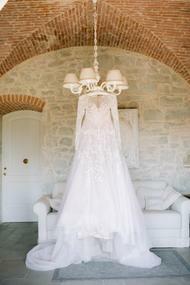 They curate international designer gowns for rent and purchase. 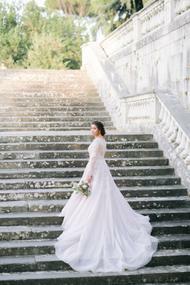 When I was looking for the perfect gown, I didn’t seem to find the one that I was looking for. 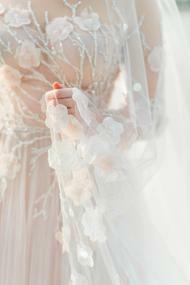 And then I saw this new gown from Berta’s newest collection online, and fell in love with it. A gown that I have never seen in real life, just from some pictures, but I suddenly felt that it was the one. My mom and dad also thought the same. So I, without doubt, ordered it, waited for almost 4 months to get it made and shipped from the U.S to Singapore. 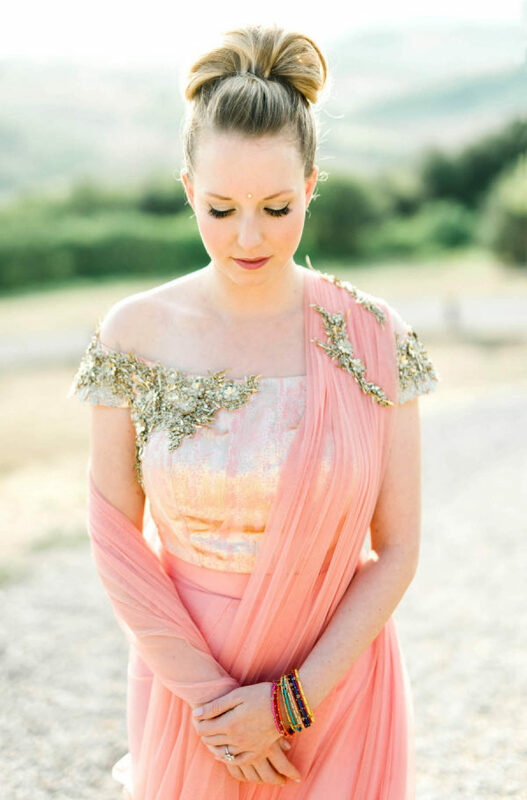 And my gut feeling didn’t lie, when I first tried it on, it was magical. 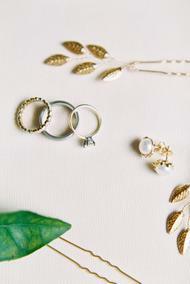 The earrings that I was wearing on my wedding day were really special because they were an engagement present from my parents. 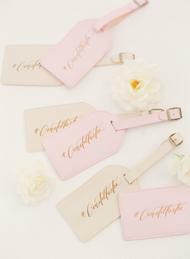 We did luggage tags as wedding favors, because it’s a destination wedding, so we wanted a personalized luggage tags as wedding favours for our family and friends who had to travel across the globe to our celebration. 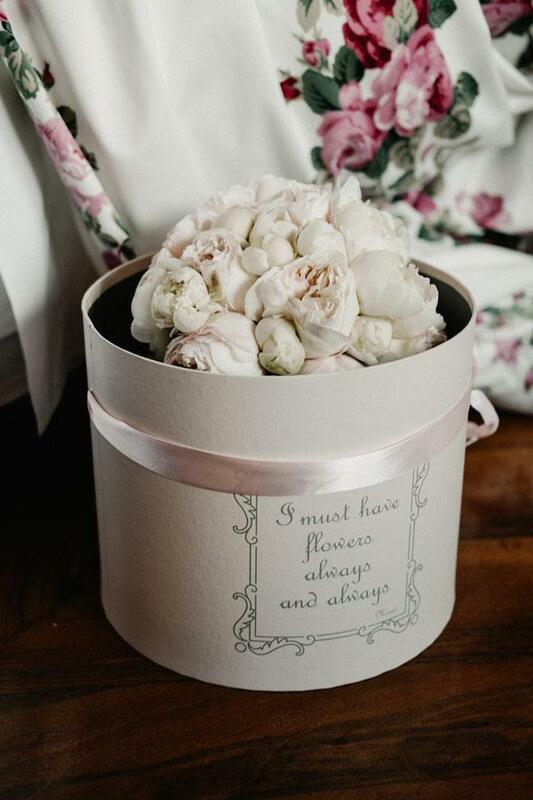 We got ours made with Saffiano Faux leather in our wedding’s colour palette for each guest, very detailed laser-cut with our wedding hashtag’s calligraphy on- it was a perfect choice. 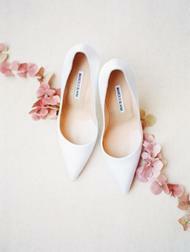 What is one piece of advice that you could give to brides-to-be? 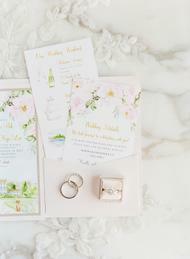 Choose your wedding organiser wisely and take care of your health, as you will need extra stamina because planning a wedding can be tiring, yet it’ll be worth it. 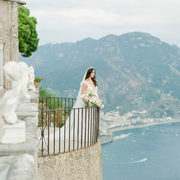 From the Wedding Planner Catherine Bradfield, Founder of The Wedding Boutique Italy… Stella and Aston’s wedding was, without doubt, a combination of some of the most beautiful locations that the Amalfi Coast has to offer, so that guests had a truly wonderful experience over the three day celebration. So we organised a really cute gelato cart with six different, delicious flavours and everyone loved it! 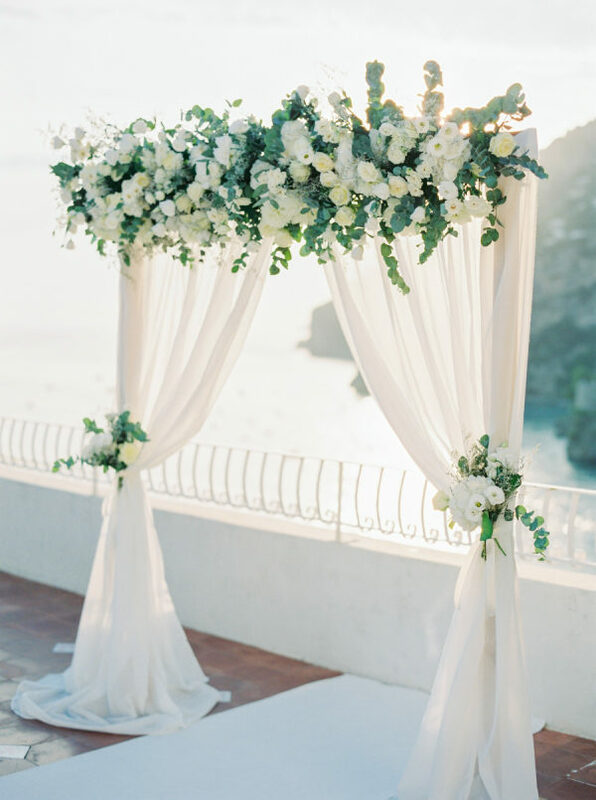 Decor wise we opted for a more casual styling, just a few pretty touches to evoke a vibe of Amalfi Coast chic. 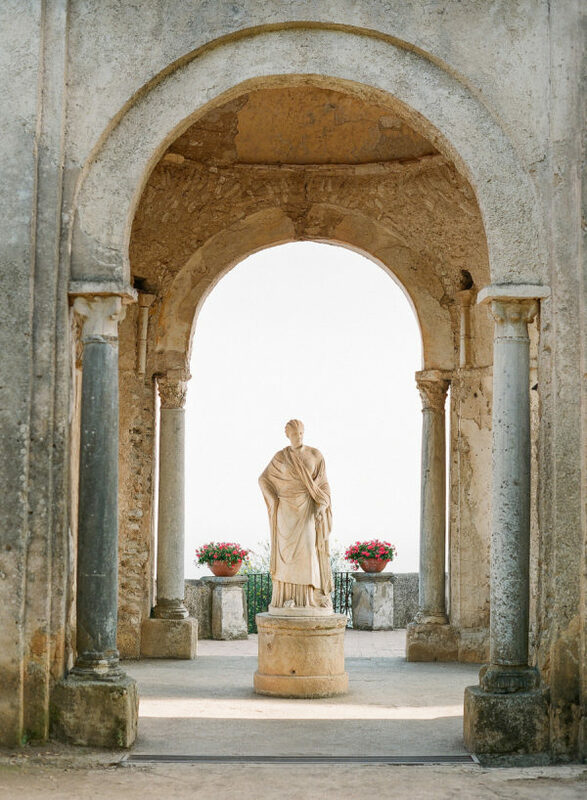 For the wedding day itself, although Ravello has really pretty Churches, the Amalfi Cathedral is in a league of it’s own- beautifully ornate within, set high up above the Amalfi Square with many steps to reach it. Stella was very brave in her heels and dress, as climbing the stairs was the only way to reach the doors ready for her grand entrance. 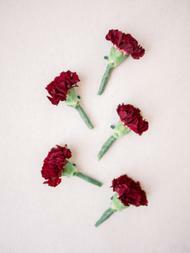 After the Catholic ceremony, we arranged for the guests to line the stairs with pretty petal cones for a fantastic exit as newlyweds- a fascinated crowd had gathered in the square and there was lots of cheers. It was a lovely moment! 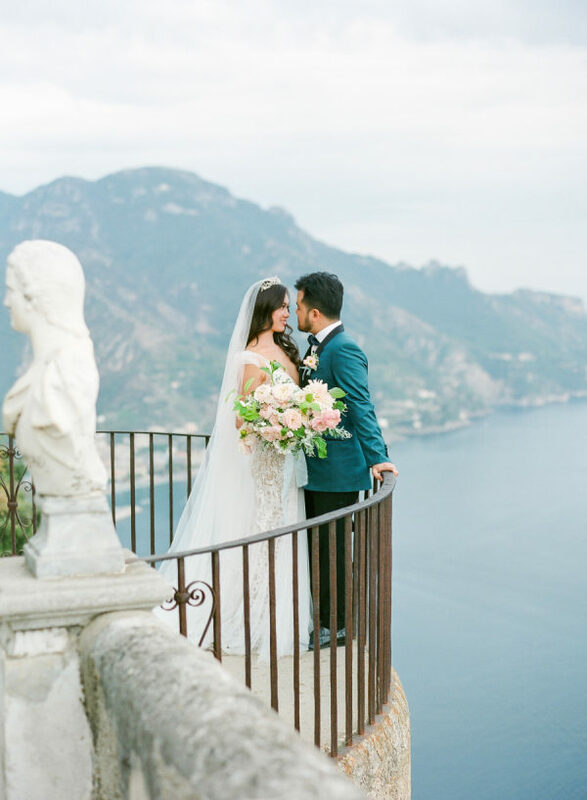 Stella and Aston were swept away in their gorgeous classic wedding car, leaving guests to enjoy a spot of lunch in Amalfi, before heading back to Ravello for the evening celebrations. 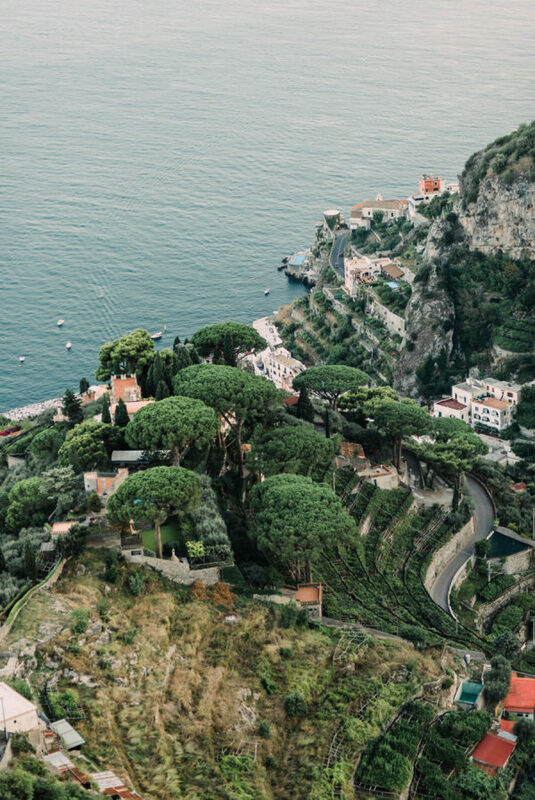 Anyone who has visited the Amalfi Coast will have heard of Villa Cimbrone, arguably the most beautiful place on the whole of the Amalfi Coast (or maybe even in Italy) and by far one of our most popular venues. 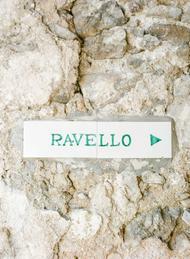 We are so lucky that our Senior Planner, Roberta, is local to Ravello and knows the venue inside out. 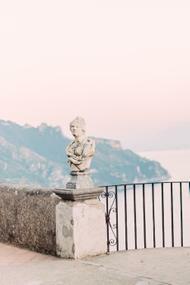 What better place to hold the wedding reception itself, in a historic castle with the most incredible fairytale gardens and infamous Belvedere Terrace (also know as the Terrace of Infinity)- somewhere that Gore Vidal himself said was the most beautiful place he had seen in all his travels, where the sky and the sea were each so vividly blue it was impossible to tell one from the other. 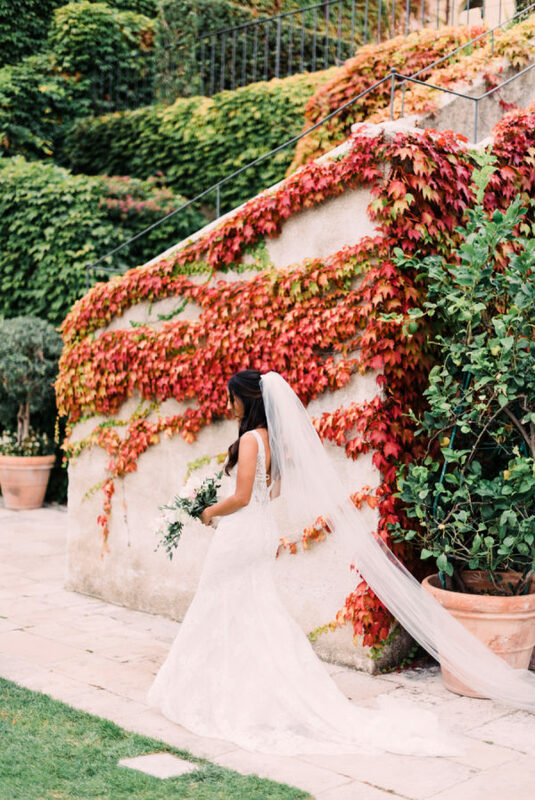 Oliver Fly (Photographer) and Giorgio Guerrieri (Videographer) were so happy with the location and there are so many amazing photo opportunities within the venue that they didn’t know where to start! 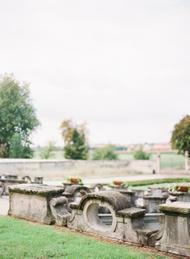 Guests were welcomed with a wonderful Aperitif in the gardens, and were able to wander round the rest of the property to explore and take photos on the Belvedere Terrace. 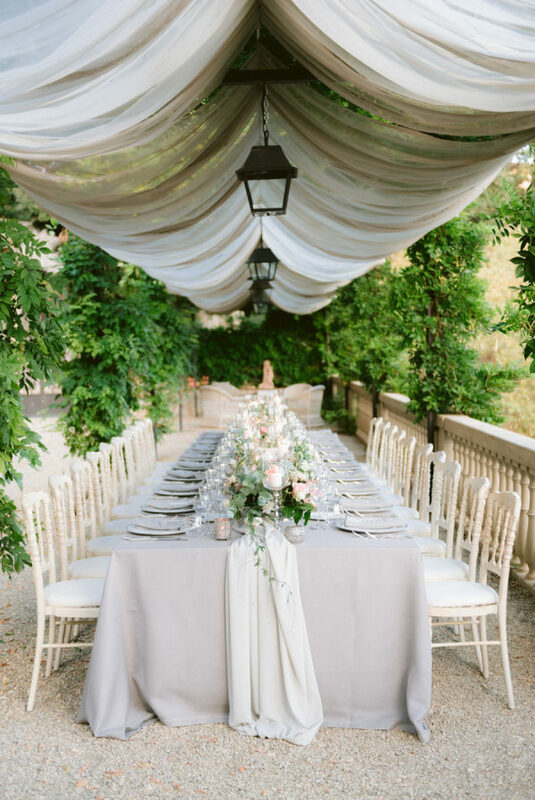 As the light fell, we put the finishing touches to the dinner tables in the crypt with the wonderful vaulted stone ceiling that Villa Cimbrone is so well know for. 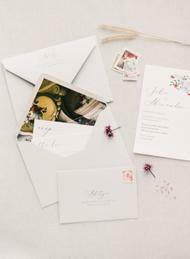 The colour palette was delicate and romantic, with gorgeous open blooms complemented by taper candles and wonderful calligraphy and stationary design by Veronica Halim. 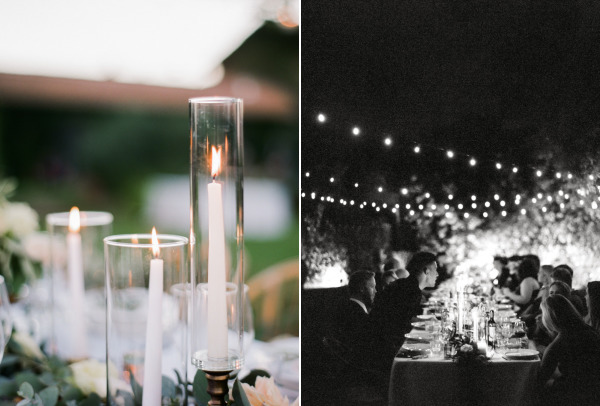 As soon as the candles were lit, we invited guests to be seated- it’s always the most magical moment to watch the guests come down the stairs and see the dinner setting for the first time, the look on their faces means we know our work has been worthwhile. 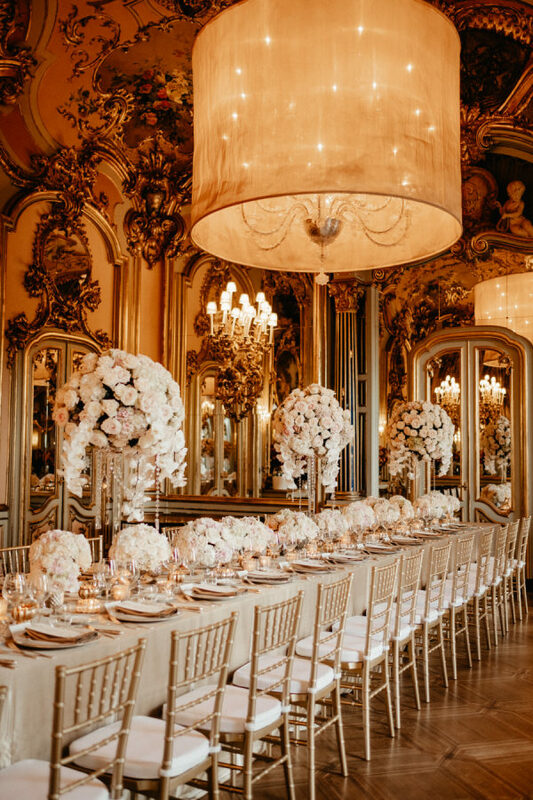 Then we prepared the Bride & Groom’s grand entrance into dinner and a magical evening ensued, surrounded by flickering candlelight, and the incredible voice of Enrico singing and playing the grand piano, the room filled with laughter and delicious dining. Catherine from Made in Cake designed a gorgeous and delicate cake for Stella and Aston, which was followed by their lovely first dance. After the reception, we had organised a fantastic after party at a great bar down in the square of Ravello so that guests could dance the night away until the early hours of the morning. 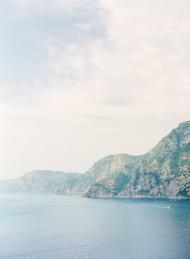 The next day, as a farewell, we organised a relaxing cruise along the Coast to Positano for Aston, Stella and their guests and the weather was just lovely. 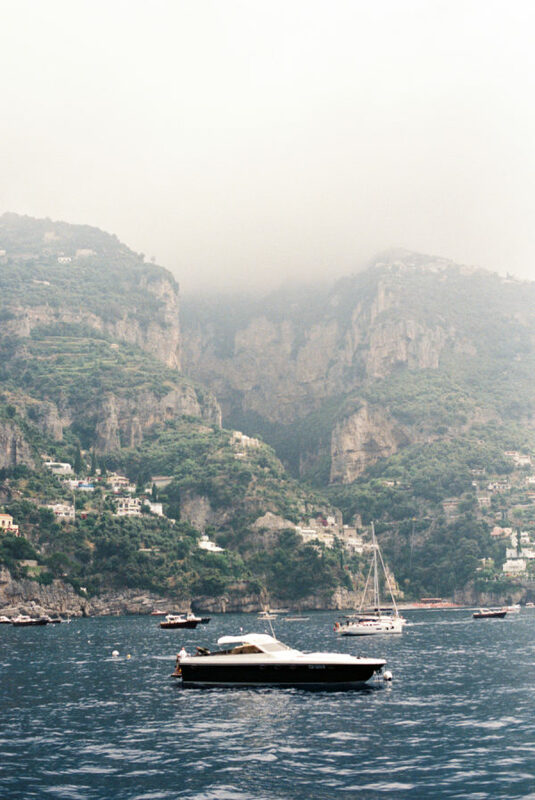 The Amalfi Coast is stunning whilst you are on land, but even more impressive seen from the water so we always highly recommend a boat trip during your stay. 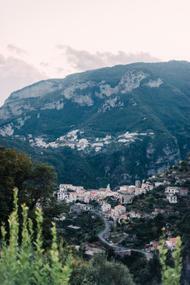 Overall it was a wonderful few days, showcasing the very best that the Amalfi Coast has to offer. 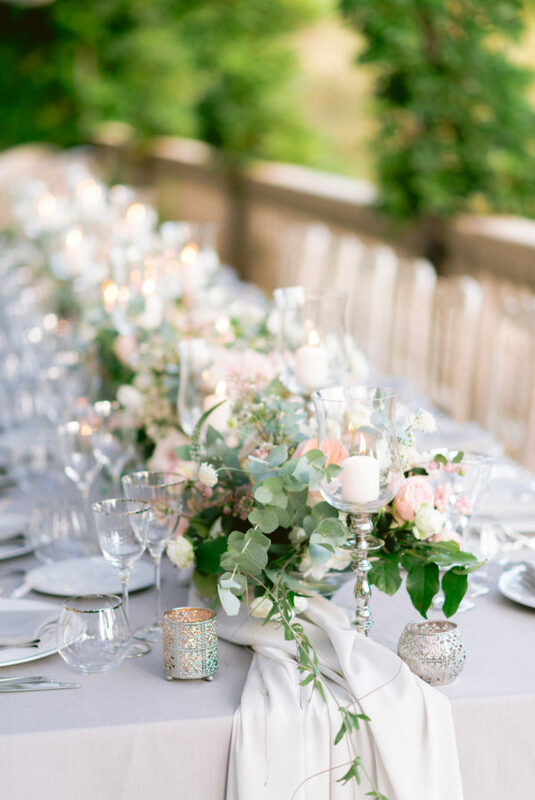 There is no doubt that it is the most magical place for a destination wedding of any size, and we love bringing our clients’ visions to life to create memorable and stylish celebrations. 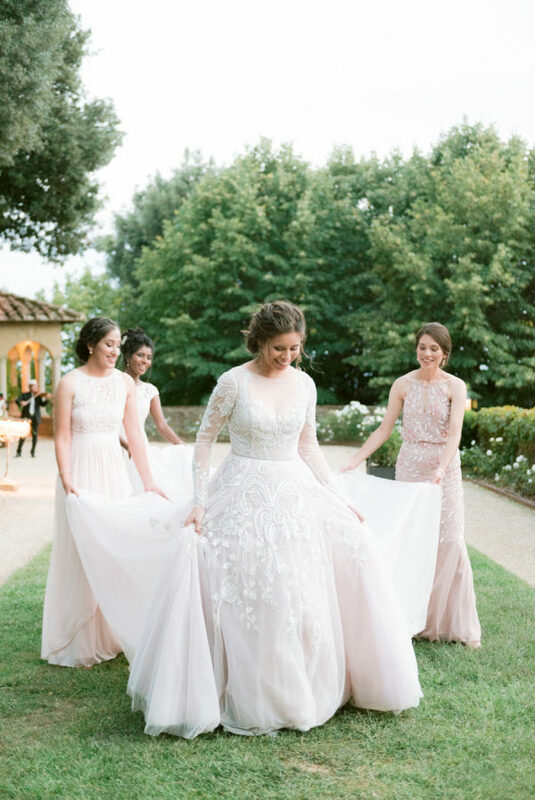 Since the bride is from California and the groom from England, they knew they wanted an intimate destination wedding where all their closest friends and family could experience a fun, relaxing, once-in-a-lifetime weekend together. 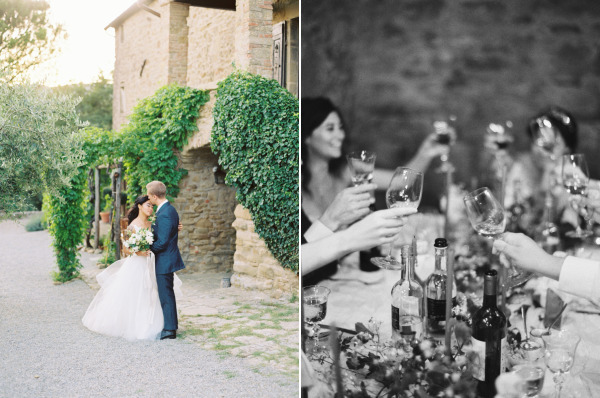 Tuscany was the winning locale (for obvious reasons…!) 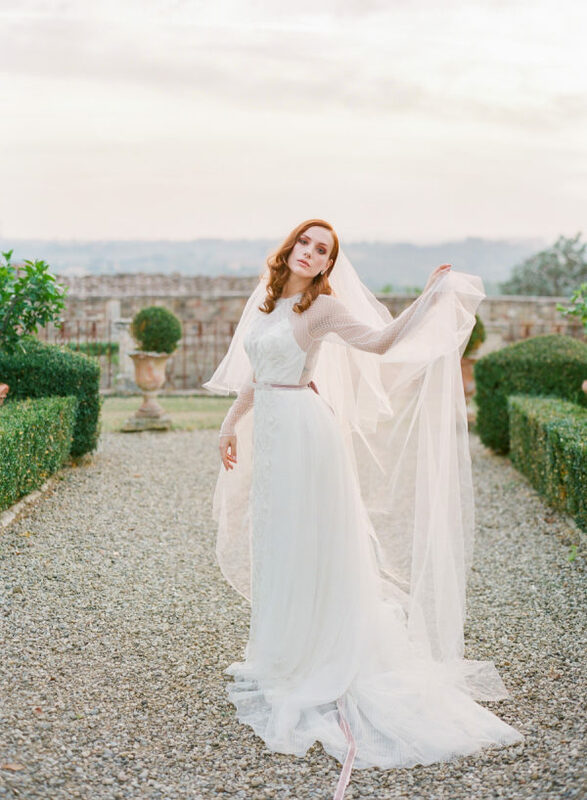 From the bride’s fairytale Hayley Paige gown to the adorable donkey adorned with flowers by Viola Malva – there’s so much to love about this stunning Tuscan affair! 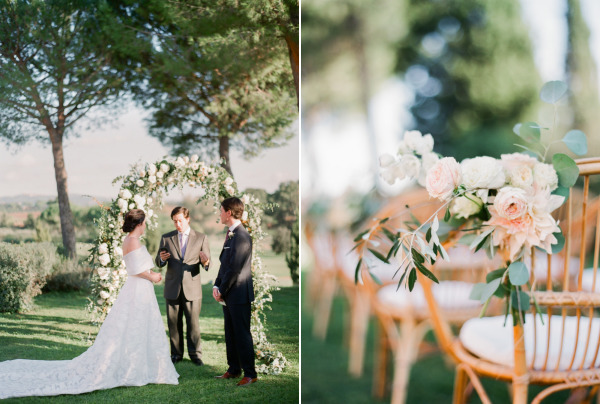 See all the details planned by Original Tuscan Wedding in these gorgeous photos captured by Rossini Photography. 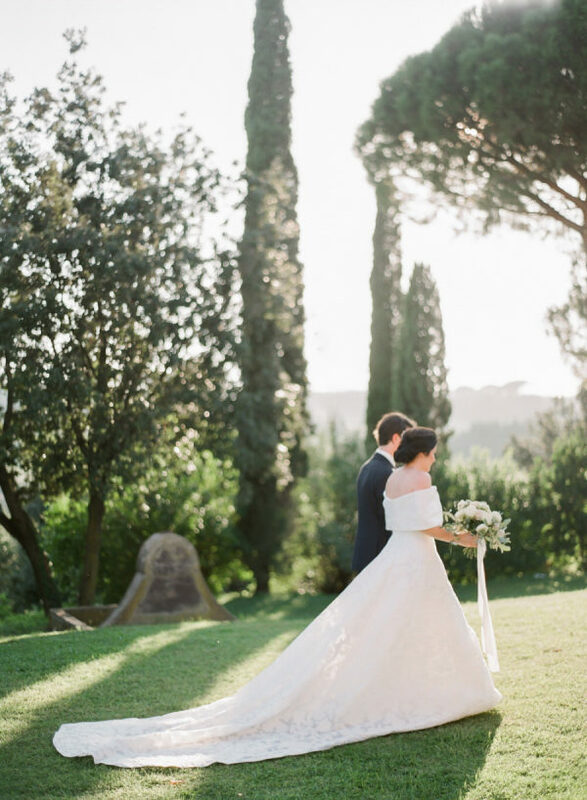 From Rossini Photography… Tuscany is being every year more and more requested from couples who want to have their destination wedding in Italy. 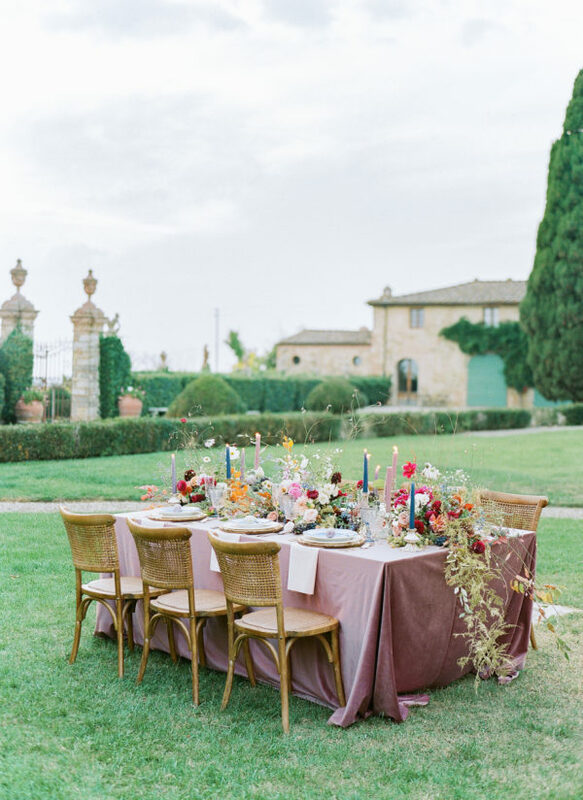 And it’s easy to understand why… A rich culture, rustic and romantic scenery perfectly mixed with the marvelous Renaissance art, and the taste of its world-renowned food and wine… All this things are basically the reasons why Tuscany checks all the boxes when planning a wedding! 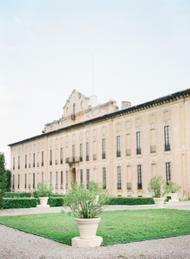 The whole day took place at Villa Le Fontanelle, originally a simple peasant farm, became in the XV century one of the properties of the Medici family. 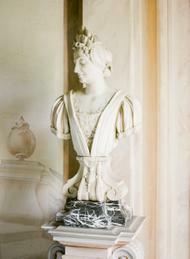 During the centuries the villa was home to several families, who changed its aspect many times. Every day since then has been dedicated to the planning and maniacal research of every single color, furniture and fabric in order to create a unique location, where nothing is left to chance. 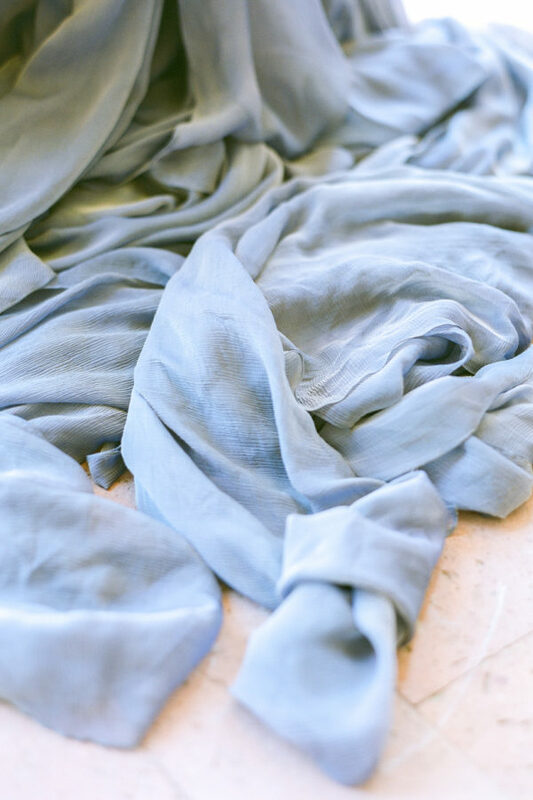 Every day since then has been dedicated to the planning and maniacal research of every single color, furniture and fabric in order to create a unique location, where nothing is left to chance. 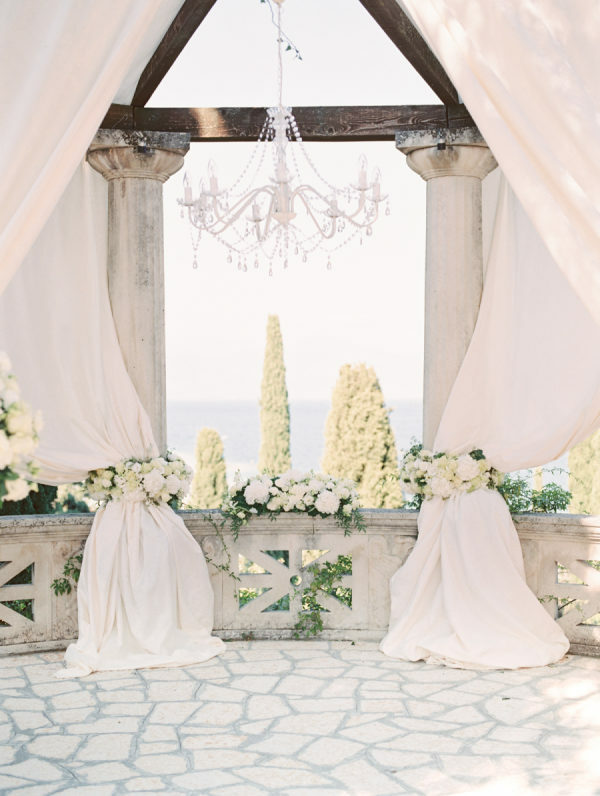 A dreamy environment where beauty is manifested everywhere, a feast for the eyes and a shelter for the soul. 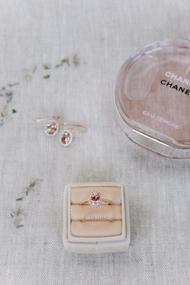 Aware of the bride’s love for all things pink, her husband proposed with a pink sapphire engagement ring. 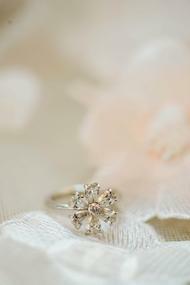 It was the ring’s peachy pink color that set the colours of the wedding. 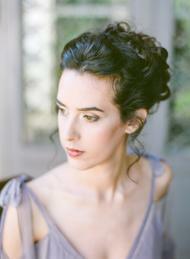 The Hayley Paige dress was a beautiful amethyst shade, covered in intricate beading and floral designs throughout. 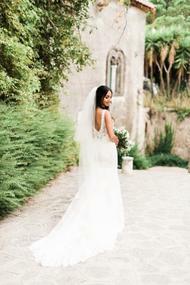 With its cathedral length train and veil, it was fit for a princess! 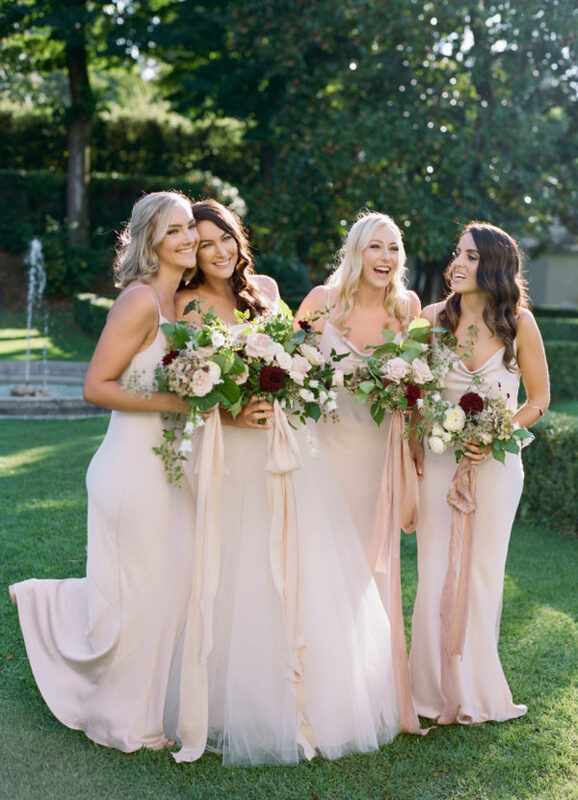 With light hues of pink and purple in mind, the bride together with the wedding planners, added peach, gray, white and silver to the wedding color story. 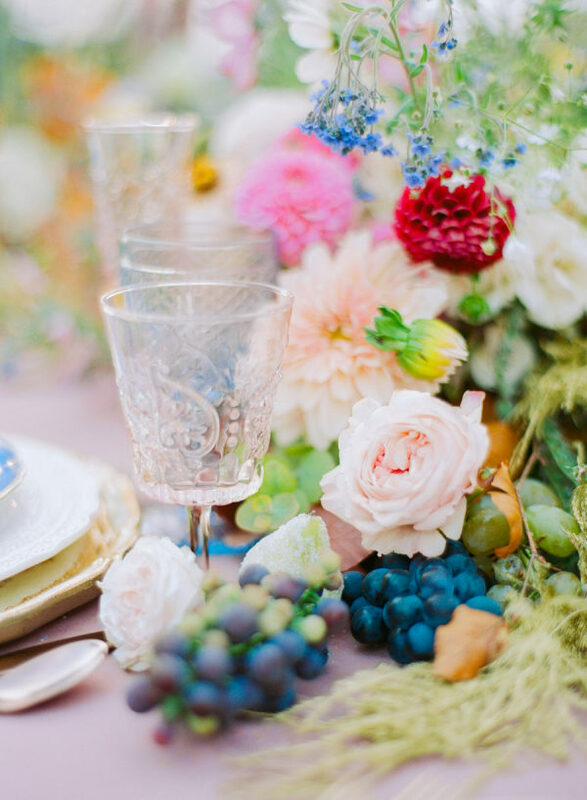 These colors are reflected in the bridal and bridesmaid bouquets, flower arrangements and tablescape. The end result was romantic and elegant with a Tuscan flair. From the bride… With Alec being from England and I from California, we always knew we would have a destination wedding; the question became, “Where?” We envisioned a beautiful and relaxing location, one that would offer new experiences and allow us to spend quality time with our closest family and friends. 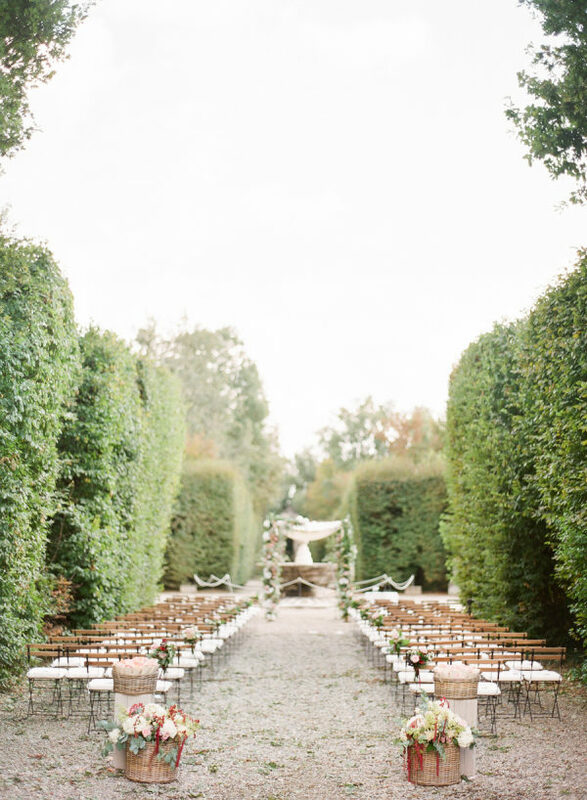 Wedding days can go by fast, so a place where time moves slower was ideal. 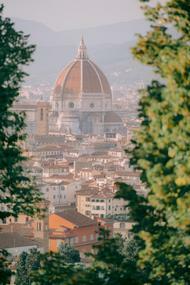 Tuscany, with its rich culture and rustic scenery checked all the boxes. 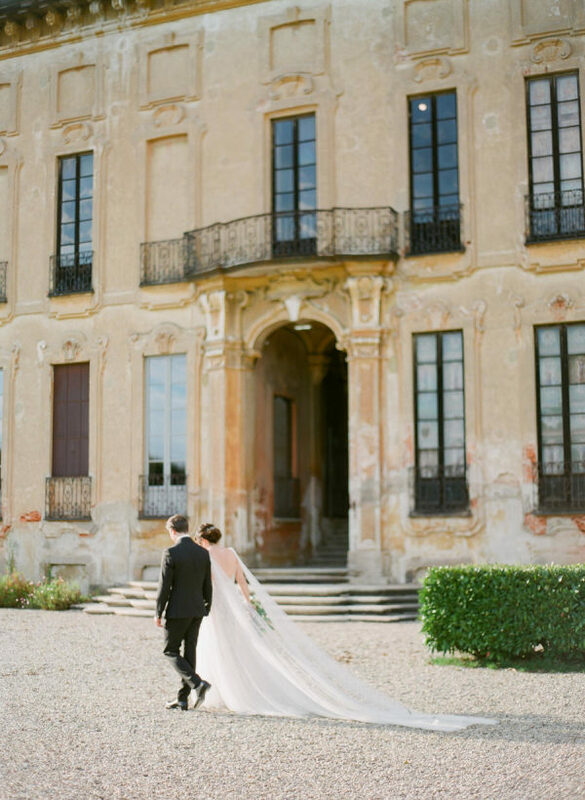 A wedding here would provide the romantic backdrop we sought, an opportunity to marvel at its Renaissance art, and a taste of its world-renowned food and wine. 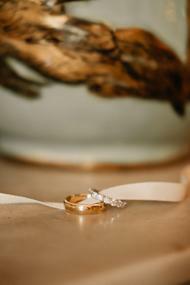 When deciding on a photographer, we were seeking someone who used light as a method of producing romantic style photos. 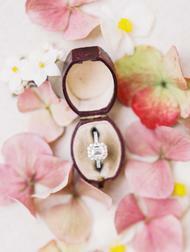 Aware of my love for all things pink, Alec proposed with a pink sapphire engagement ring. 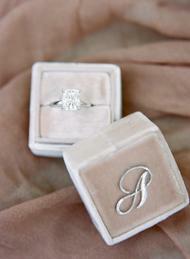 It was the ring’s peachy pink color that set the colors of the wedding. 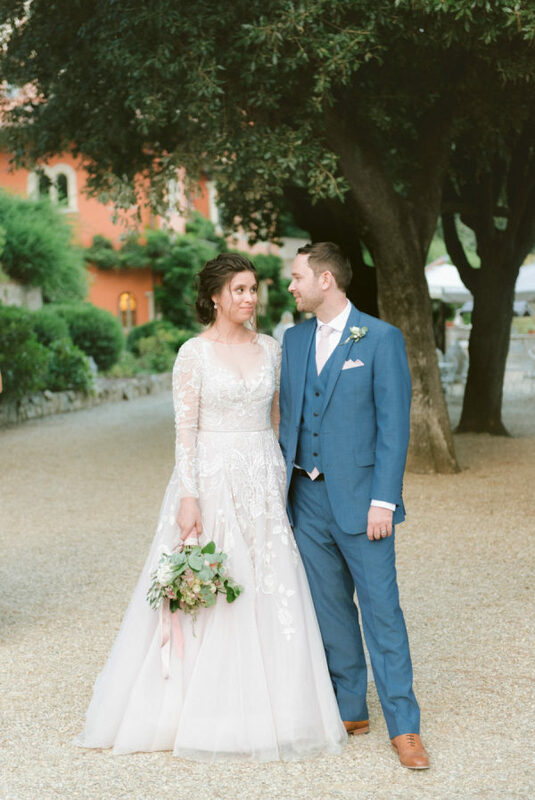 My Hayley Paige dress was a beautiful amethyst shade, covered in intricate beading and floral designs throughout. 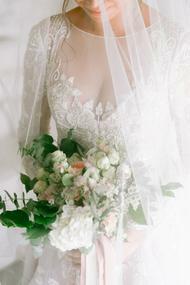 With its cathedral length train and veil, it was fit for a princess! 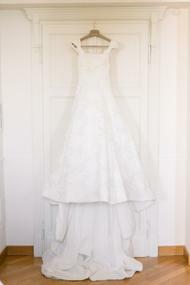 We purchased the dress during one of her trunk shows at JLM Couture’s flagship store located in West Hollywood. Having Hayley Paige herself ask if I was saying yes to the dress while my mom, brother and others cheered is a memory I will cherish always! 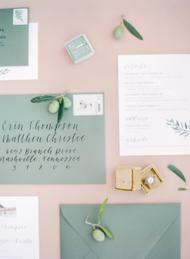 With light hues of pink and purple in mind, we added peach, gray, white and silver to our color story. 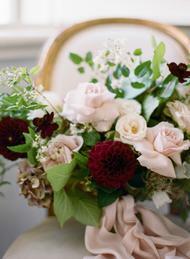 These colors are reflected in the bridal and bridesmaid bouquets, flower arrangements and tablescape. 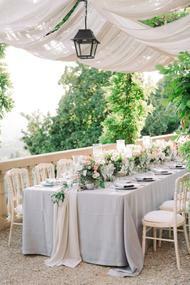 The end result was romantic and elegant with a Tuscan flair. A cute local donkey adorned with flowers greeted guests and made for a fun photo opportunity. 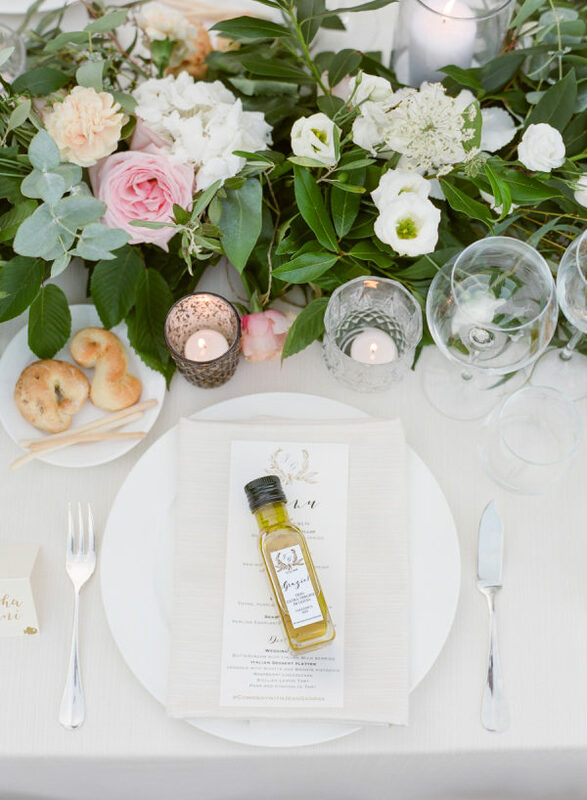 Mini olive oil bottles served as favors and traditional Italian food and beverages were served at dinner and made available throughout the evening. 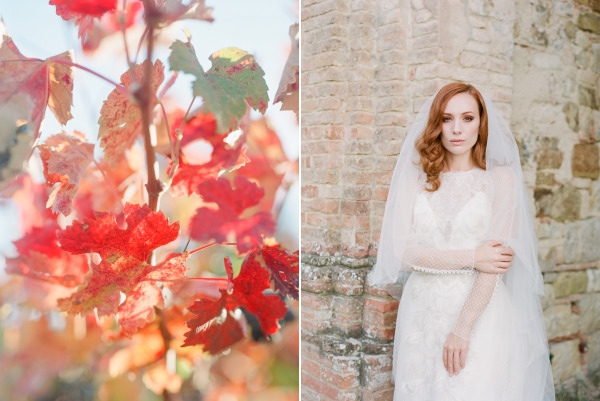 Luca and Claudia from Rossini Photography are a wonderful married couple, which I think helps as they worked seamlessly together. They were always smiling, very friendly, and quite funny. 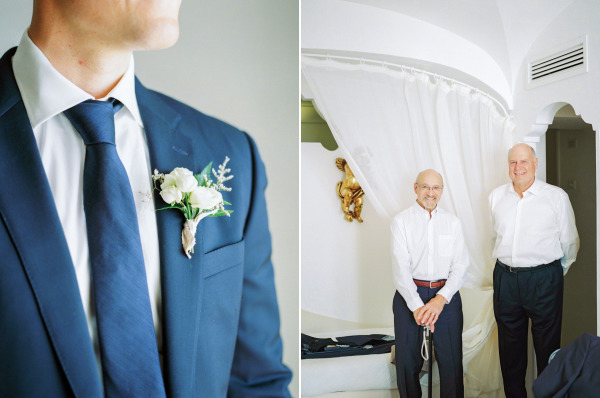 With such an intimate wedding, we worried they would be noticeable. On the contrary, they were very discreet and natural, but also approachable (my dad still shares how much he loved speaking with Luca!). 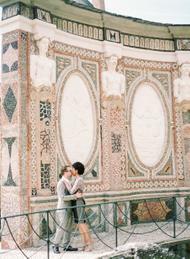 Prior to the wedding, we had shared a list of places we wanted to take couple photos at. 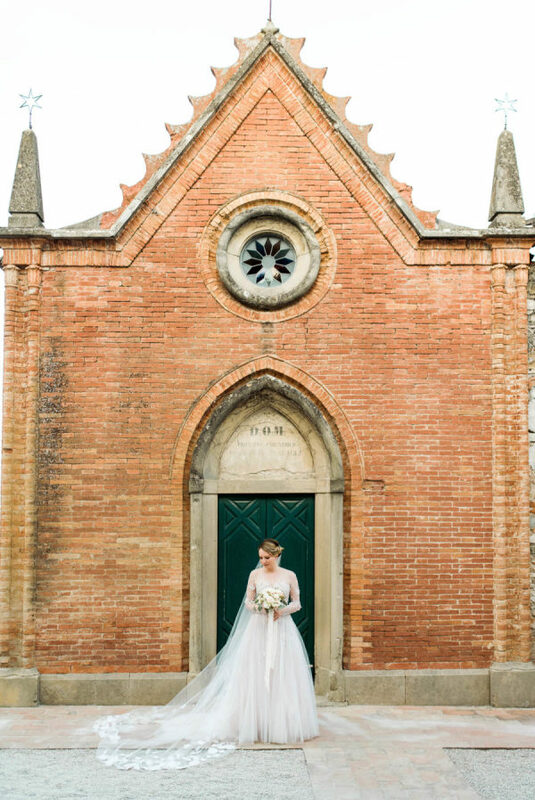 At the top of our list, and where we ended up going, was San Miniato Church. 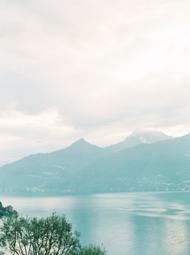 The view this location offers is what dreams are made of! Seeing the end result, we can honestly say Rossini far exceeded our expectations. 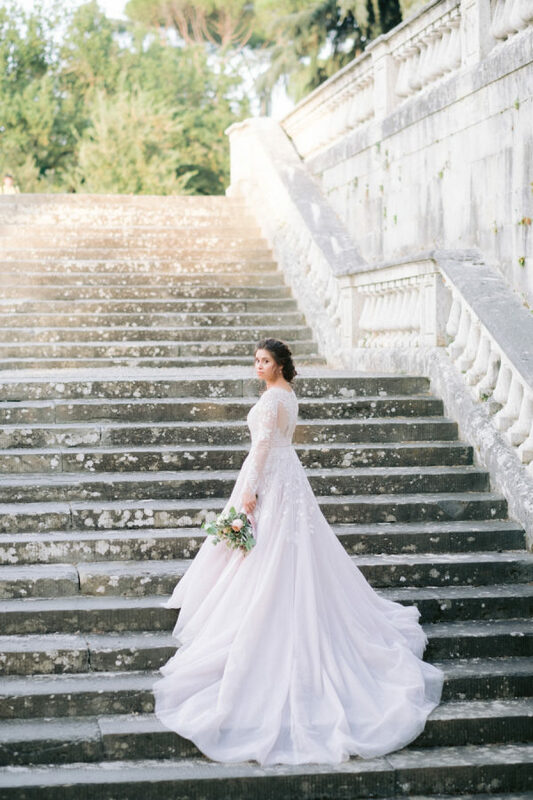 Looking back, our wedding does feel like a dream! 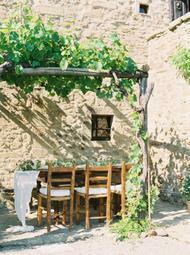 When planning a wedding from abroad, it is easy to stress and worry about the end result. In our case, everything was based strictly on photos, ideas and conversations we had exchanged with our wedding planners. 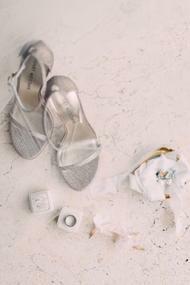 Come the wedding day, everything was as much a surprise for us as it was for our wedding guests. 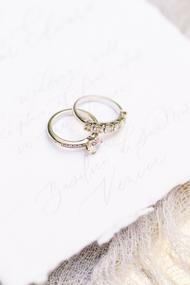 Our advice for couples planning a destination wedding would be to stay organized, do your research, and hire an experienced wedding planner with whom you mesh. 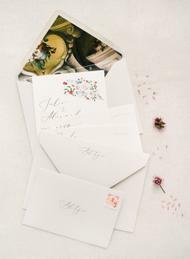 Communication is key with successfully planning a wedding long-distance. Stay calm and remember to enjoy the process! 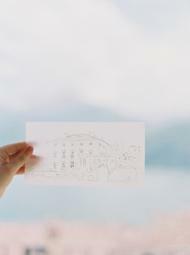 The to-do lists may seem never-ending, but the end result is so worth it! 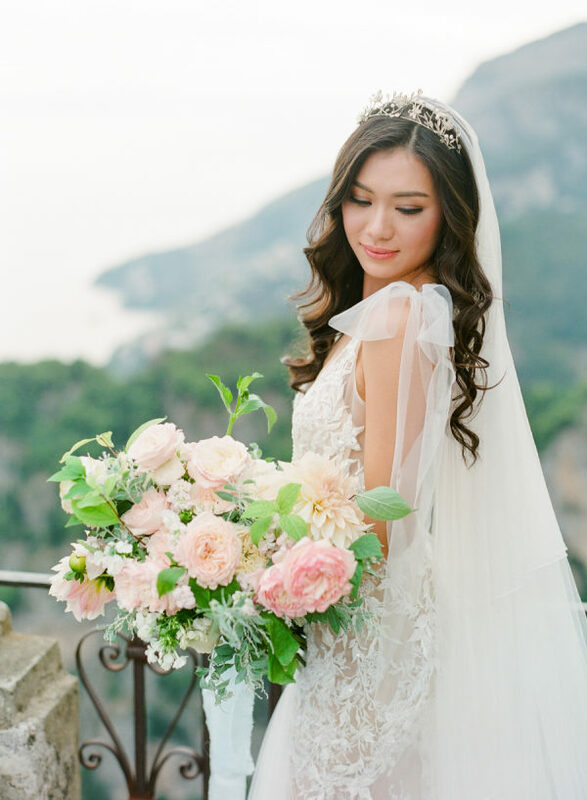 From Trynh Photography… This editorial took place in the Italian paradise of Lake Como at the elegant Villa Balbiano. 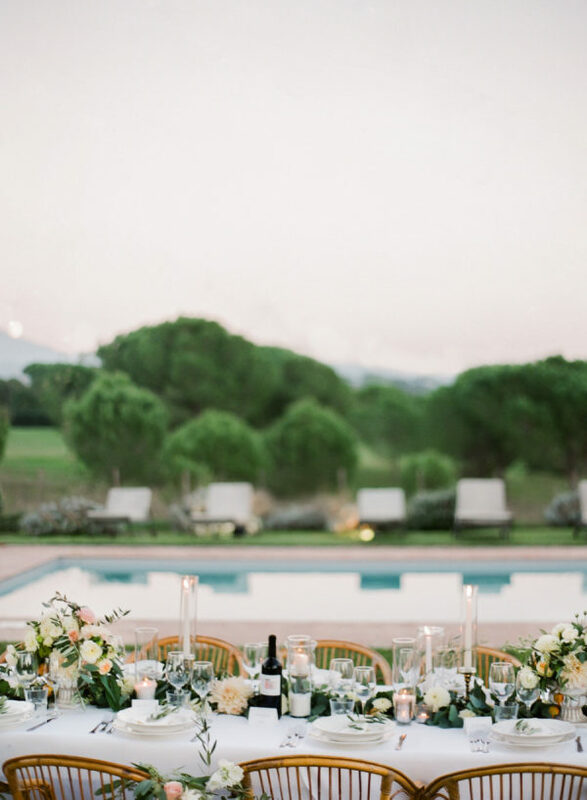 The villa made for the most picture-perfect setting for this romantic day. 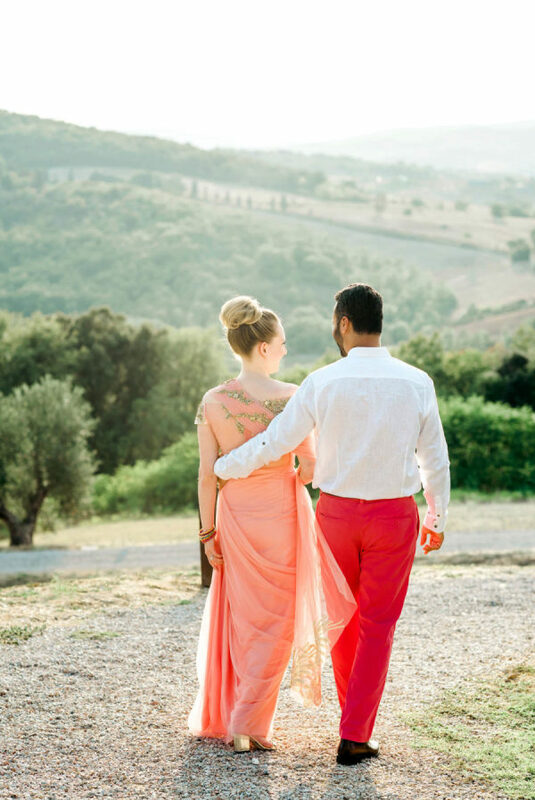 Our real couple, Bianca and Francesca are deeply in love, adore Italy, traveling, and classic fashion. 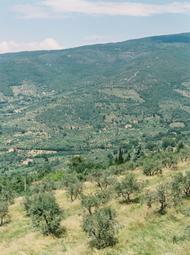 The extravagant natural setting offered a perfect mix of scenery without needing to bring much else in. 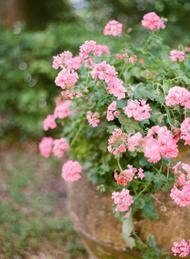 The clear blue water, the sloping hills of the mountains, and the blooming flowers and plants were pure perfection. 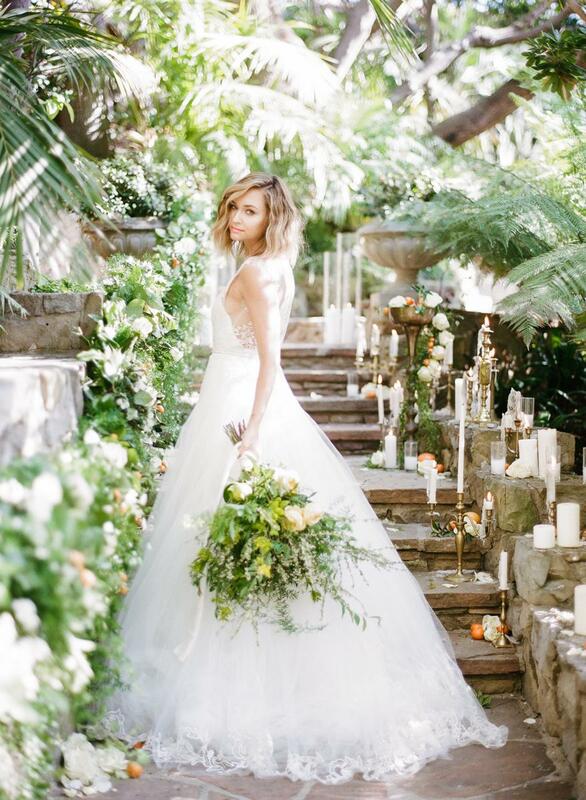 The scene was straight out of a fairytale. 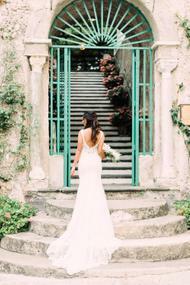 We kept the styling and directions classic and elegant to go along with the grand villa. Then all we had to do was capture the chemistry of the couple. It was a truly magical day! 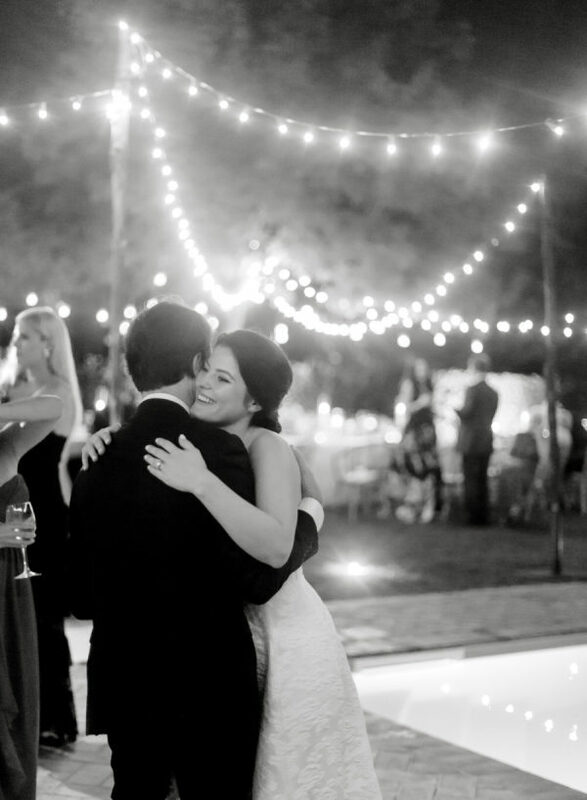 From Bride and Groom… We met at the University of Alabama nearly 6.5 years ago, the connection was immediate. After school, we landed in New York City pursuing our dreams. 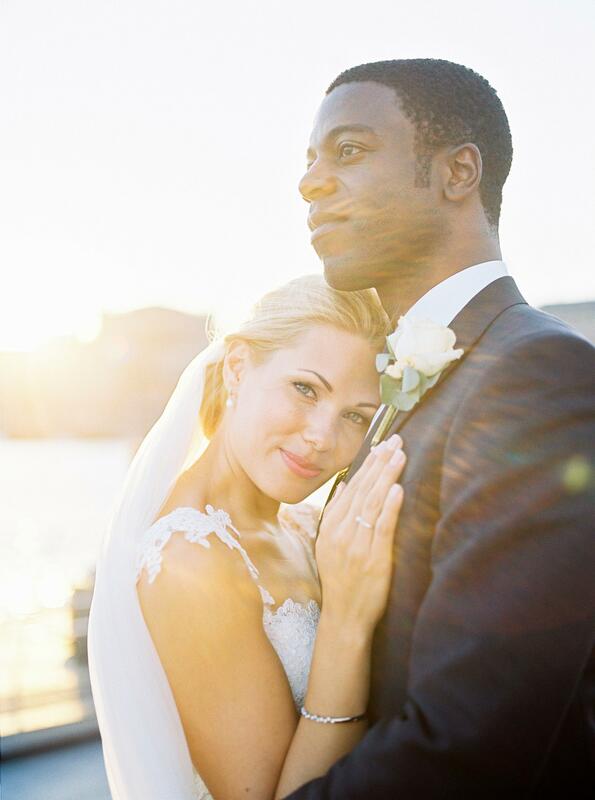 When deciding to settle down, we then moved back to Erin’s hometown of Nashville, TN. After the engagement, we toured all of the usual venues in and around Nashville but nothing felt quite right. 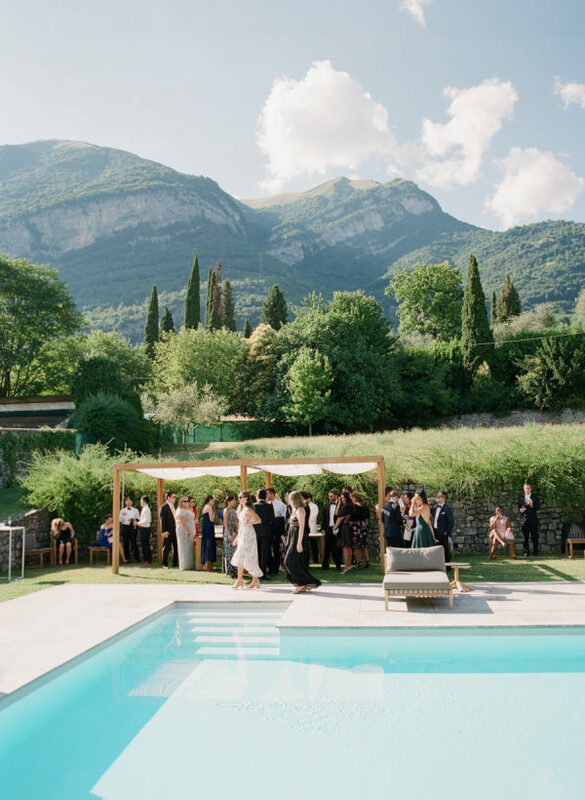 At the time, Erin was sourcing leather for her handbag line, ELT Collective, and an idea started brewing – We threw out a curveball: a destination wedding in the countryside outside of Rome. 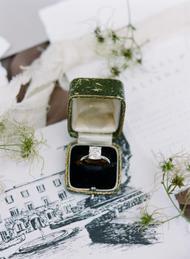 We wanted a memorable experience to remember for us and our guests. 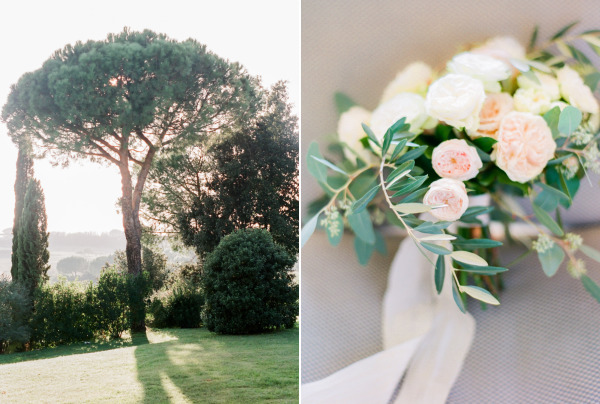 Nestled along the Apian Way, we contacted Guilio at Casale Del Gallo—a fourth-generation Roman countryside estate as our destination wedding venue. After carefully weighing the pros and cons, our decision was made and we were off to the races! 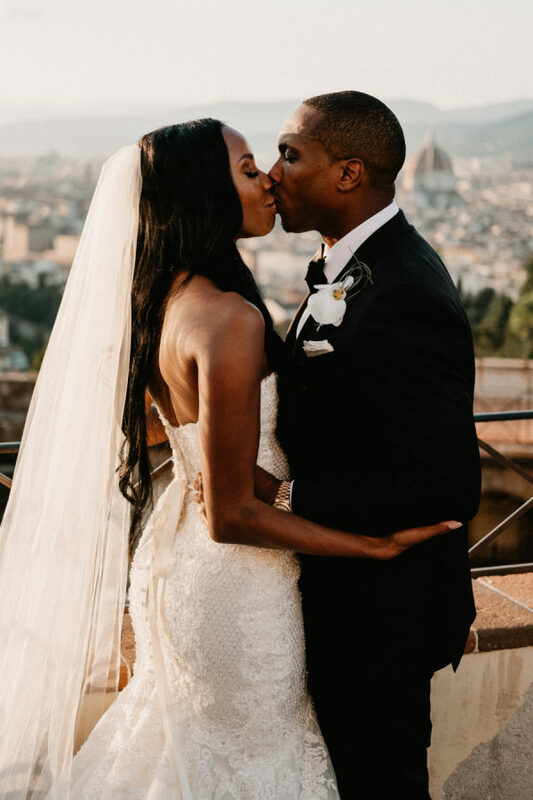 Joined by our closest friends and family, the Christie-Thompson wedding party of merely 31 guests made the trek to Rome for four nights of traditional Italian culture. 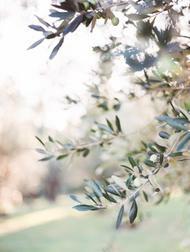 We spent time exploring the natural beauty of the richly historical family property – complete with olive tree groves, swimming pools, pizza ovens, local vineyards and a public golf course. Other days were spent in the heart of this historic city, navigating the Pantheon, Trevi Fountain, Spanish Steps, Vatican City. 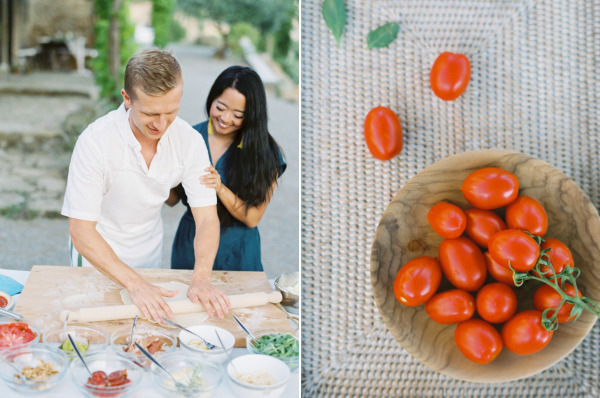 The wedding day was spent cooking and enjoying an Italian brunch and lounging by the pool with friends. 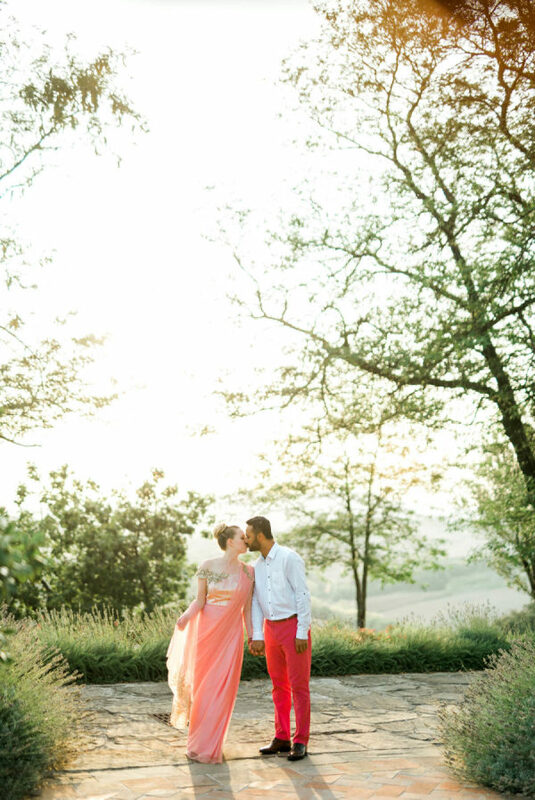 In the golden hour, we moved to the front of the house for the ceremony. 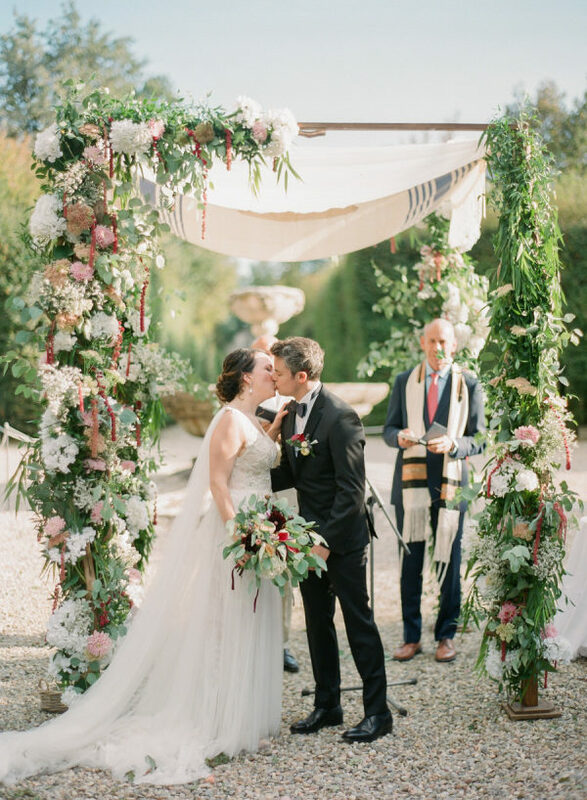 Under a gorgeous floral and greenery arch, we said “I do” with one of my closest childhood friends as Officiant. 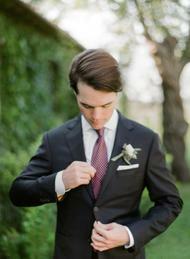 I wore a custom-made, hand-tailored Italian Wool suit by Hickey Freeman. 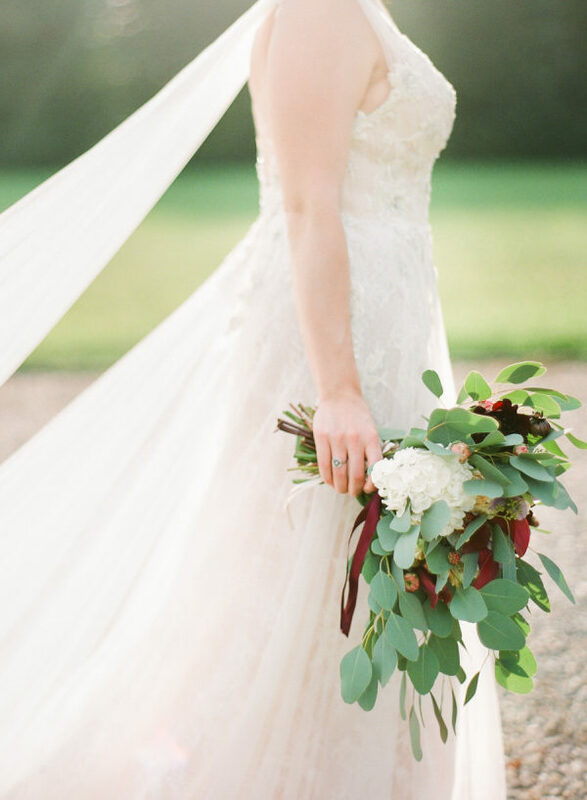 Erin combined two dresses from Lela Rose; she wore the “Desert Gown” for the cocktail hour and added the cape from her “Cape Gown” for the ceremony. 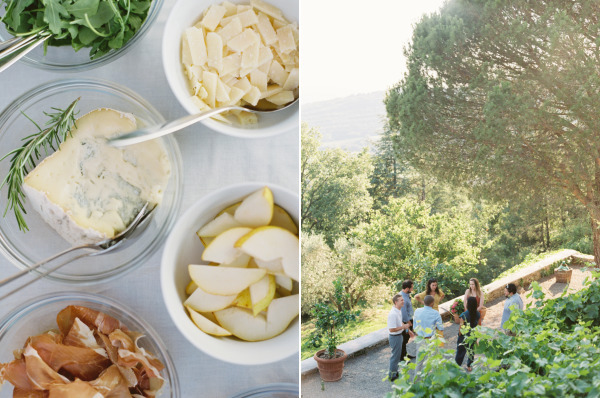 As the sun set on the country hills, we gathered in the gardens for an antipasti cocktail hour featuring an array of local meats, cheeses and wines. The music began to play as we moved to the gardens for dinner. The harvest moon rose high as we shared our first dance to Neil Young’s “Harvest Moon,” with the band’s Italian twist. 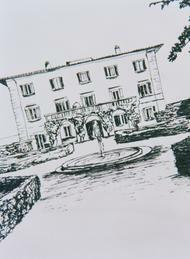 We enjoyed a traditional Italian five-course meal, all cooked in the kitchens on site, including two homemade pastas. 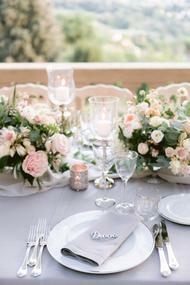 The table was dressed with whimsical olive branches, candles and white and pink garden roses. As the night wore on, we floated between the dance floor and the table, enjoying great company and great wine… all we could ask for! 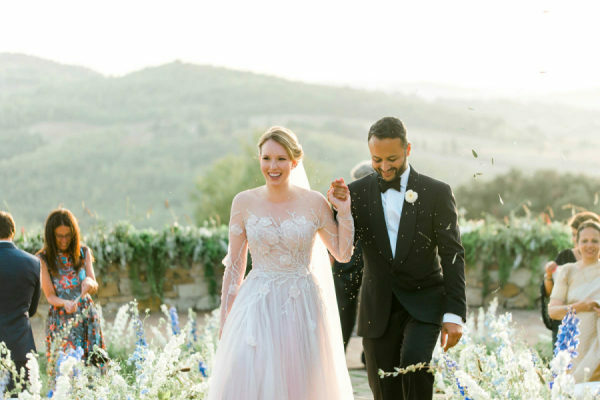 These dreamy nuptials from The Tuscan Wedding are giving Kimye’s wedding day a run for its money. 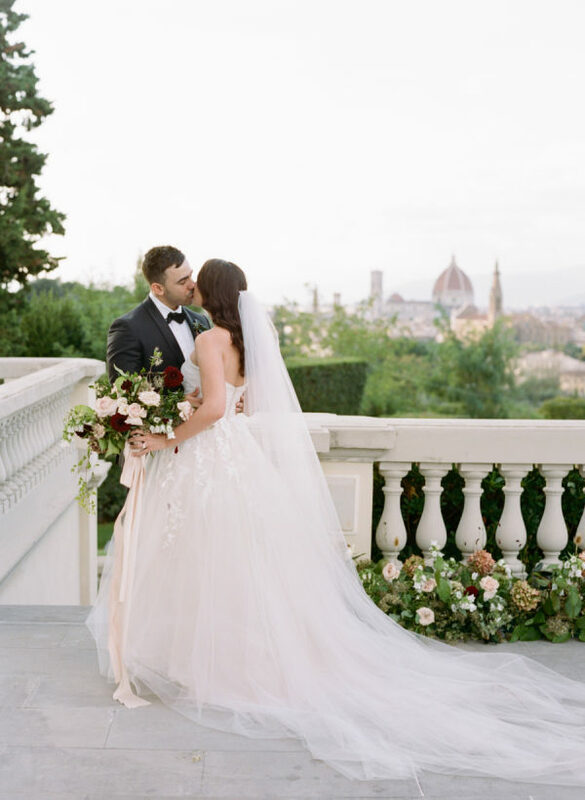 Mary & Maurizio – Quattro Studio captured every heart-stopping moment of the gorgeous bride and groom complete with an awe-worthy backdrop of the city of Florence. 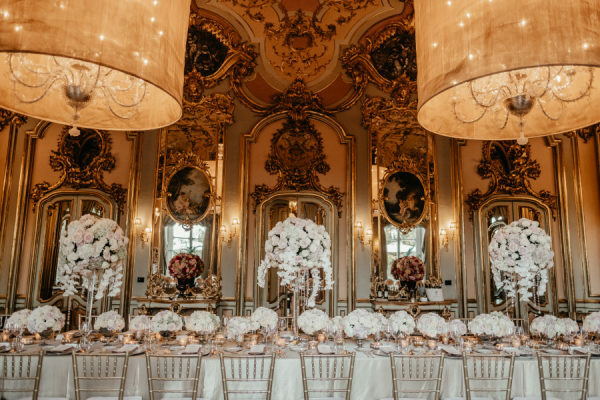 The regal reception inside Villa Cora was dripping in elegant floral arrangements created by Il Giardino delle Fate. 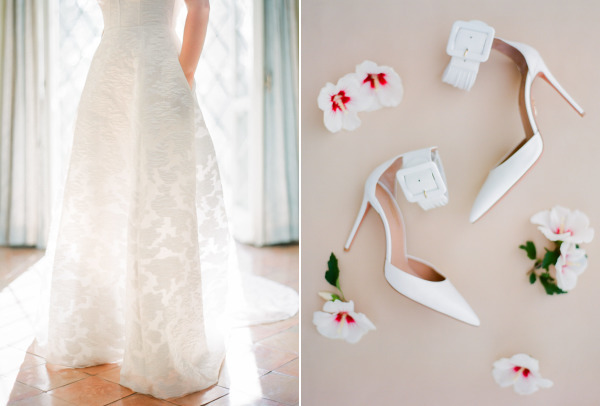 See all the must-see details at the full gallery! We’ve watched this breathtaking video by Waterfall Visuals about a hundred times today… click play to see why! 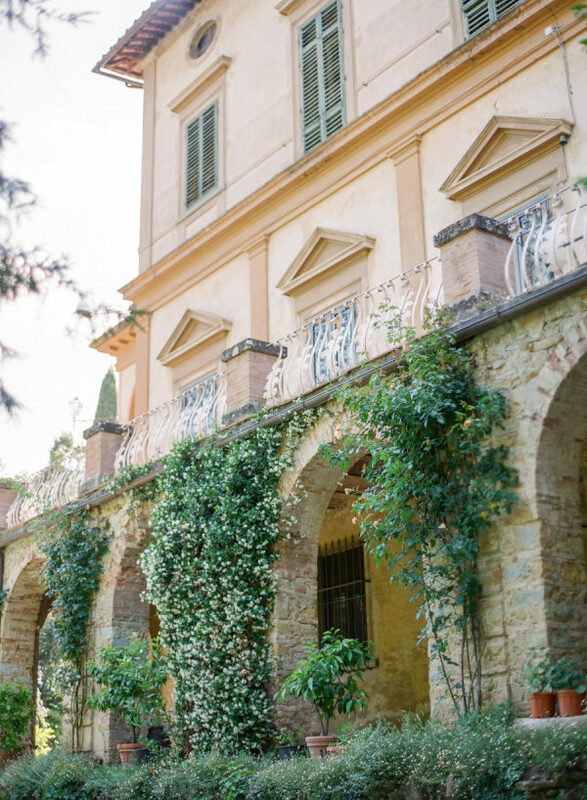 From Mary & Maurizio – Quattro Studio… A wedding in Tuscany at the lovely Villa Cora in Florence was a must for these travel enthusiasts, Brooke and Damien. 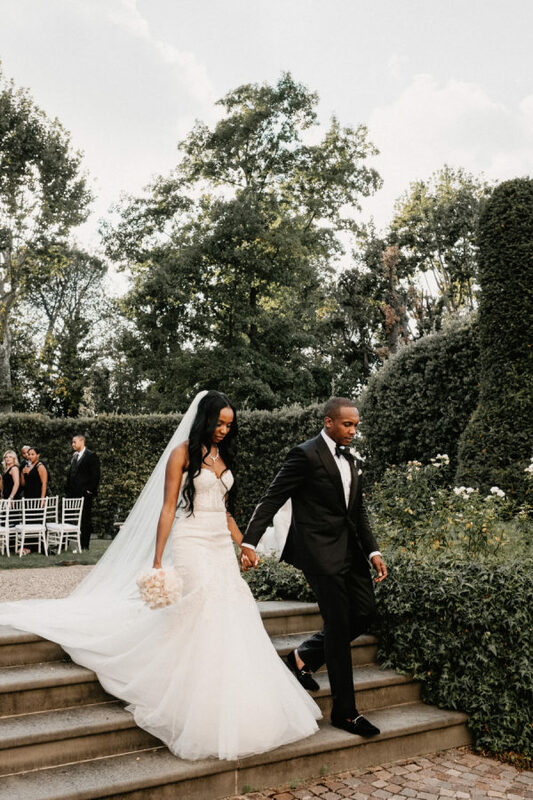 Their dream wedding destination was an intimate destination in a city with an abundance of romantic energy, beautiful art history and lots of delicious food and wine! 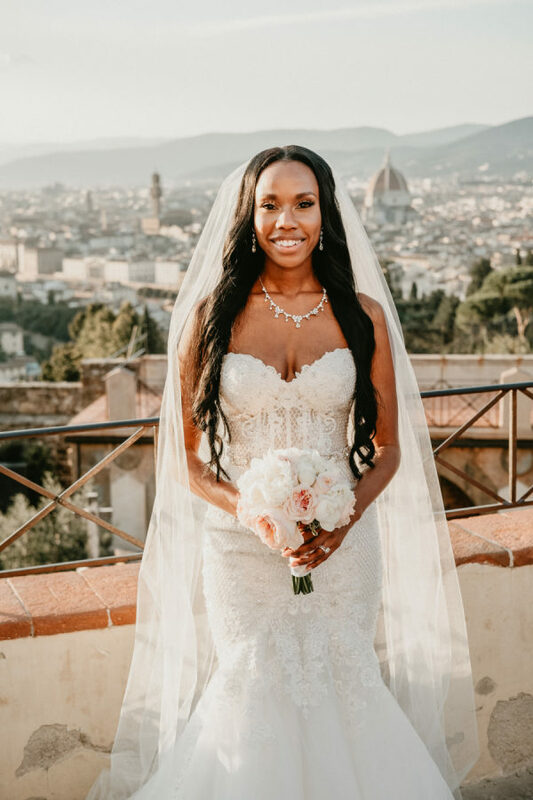 The couple met on LinkedIn back in 2013 and dated for four years before Damien finally popped that question – the question every girl waits her whole life to be asked! 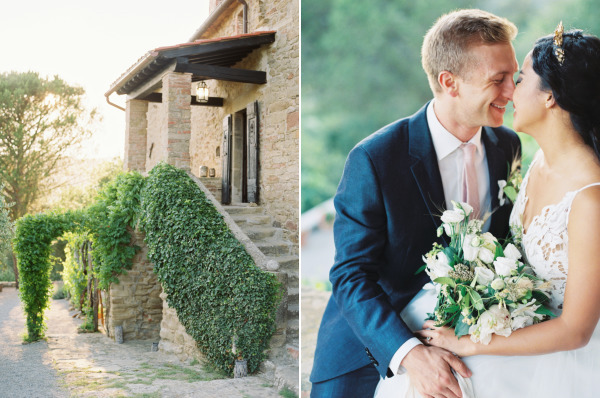 The couple teamed with The Tuscan Wedding to create the romantic wedding of their dreams. 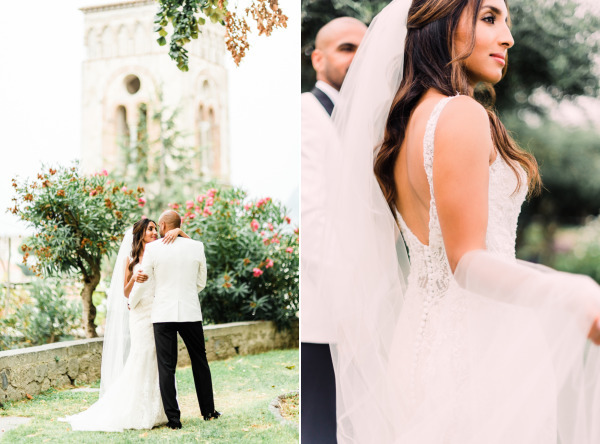 The photographers, Mary & Maurizio – Quattro Studio, and videographer, Waterfalls Visual, had an amazing landscape to capture the most precious moments of this beautiful wedding. 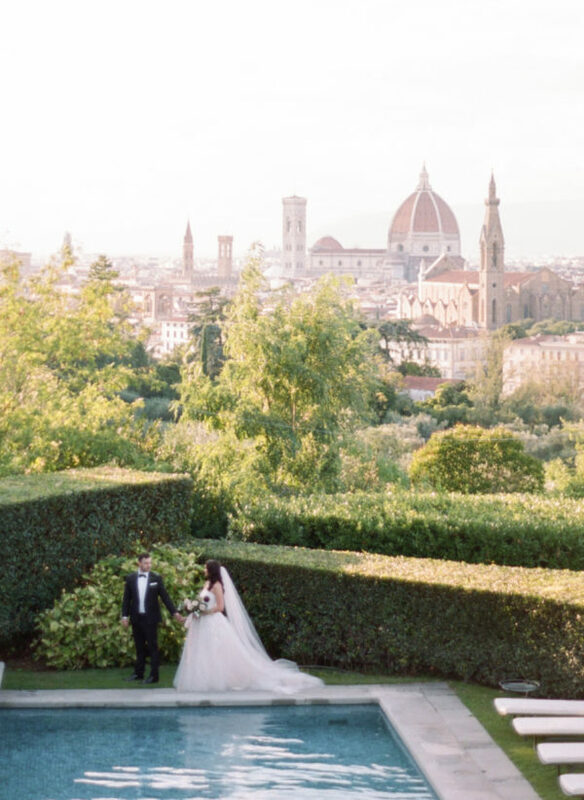 The couple wanted their guests to experience Tuscany and enjoy the famous Italian wine as much as they do, so with the help of The Tuscan Wedding, a luxurious wine tasting was the perfect preview to the beautiful ceremony to begin later that evening. 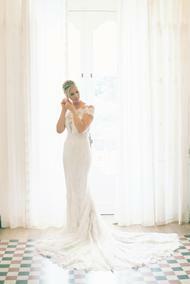 Brooke was stunning in a strapless white mermaid dress with fabulous crystal embellishments by Lori Allen. 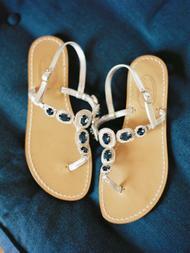 This look was topped off with drop diamond earrings and a diamond necklace that could not go unnoticed! 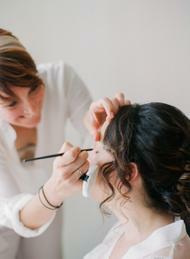 Her exquisite makeup look was done by the lovely Cherie Spisso which complemented her beachy wave hair style so perfectly. 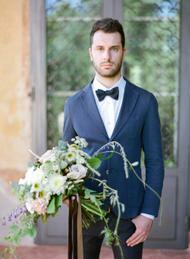 We cannot forget about the groom who looked so dashing in his jet black Ermenegildo Zegna suit. 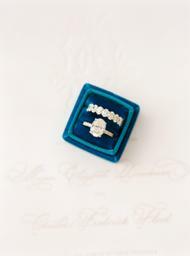 An extra sentimental touch was the cufflinks Damien wore – they belonged to Brooke’s grandfather who could not be in attendance. 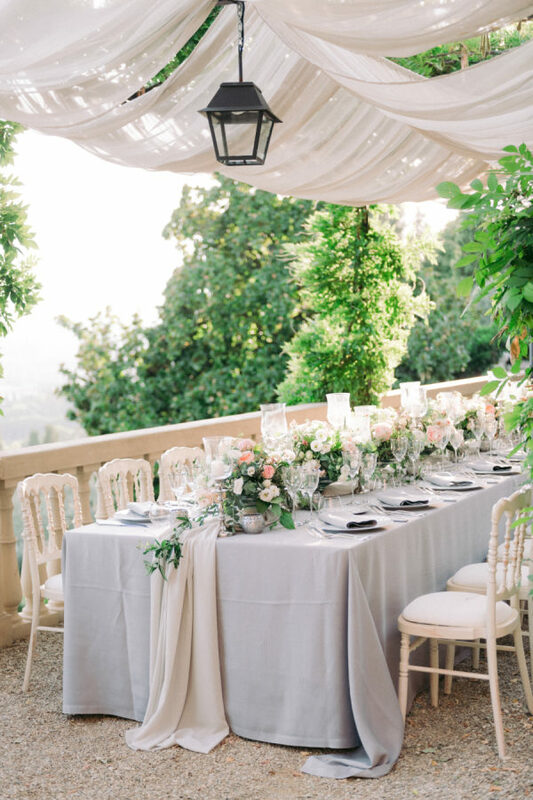 The timeless and ever so elegant wedding décor designed by The Tuscan Wedding was filled with beautiful ivory and blush florals everywhere. 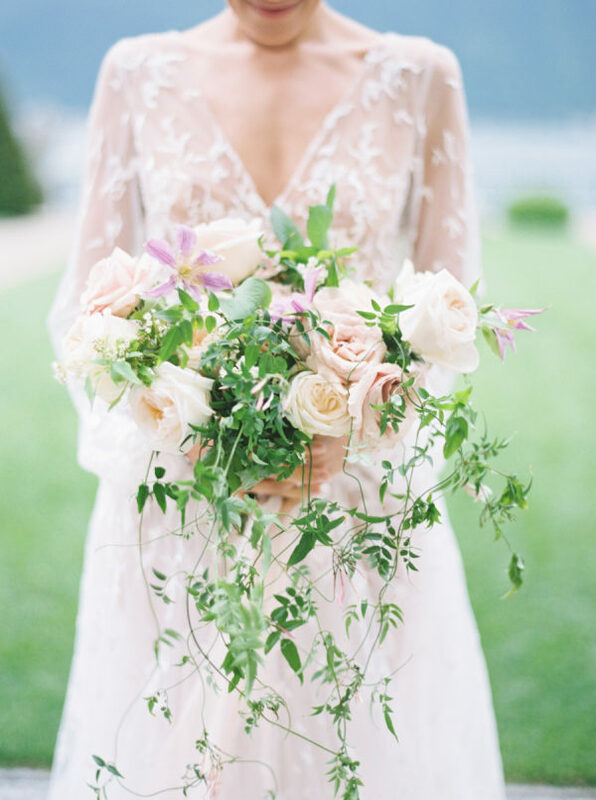 Il Giardino delle Fate truly worked their flower magic on this romantic day. 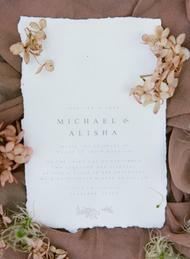 The floral centerpiece was the most mesmerizing wedding arch… an over-abundance of lovely ivory and blush flowers topped with soft ivory drapery. 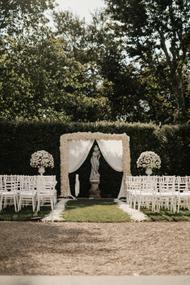 White roses cascaded down both sides of the aisle to set the stage perfectly for Brooke’s unforgettable entrance. 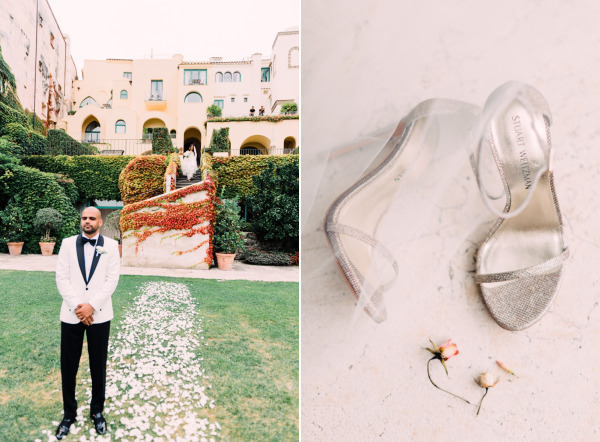 Brooke and Damien’s lavish intimate wedding ceremony, included 40 guests and was nothing short of an extravaganza with a combination of many traditional and unconventional experiences. 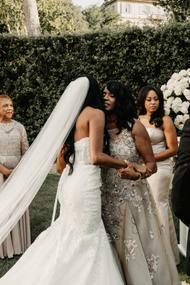 The first tradition was the lighting of a unity candle which both the bride and groom’s mothers joined in for to symbolize the union of the couple as one. This was followed by hand fasting where the love birds hold hands and promise to love each other today, tomorrow and for all of eternity! Wait…did someone say [love] birds? 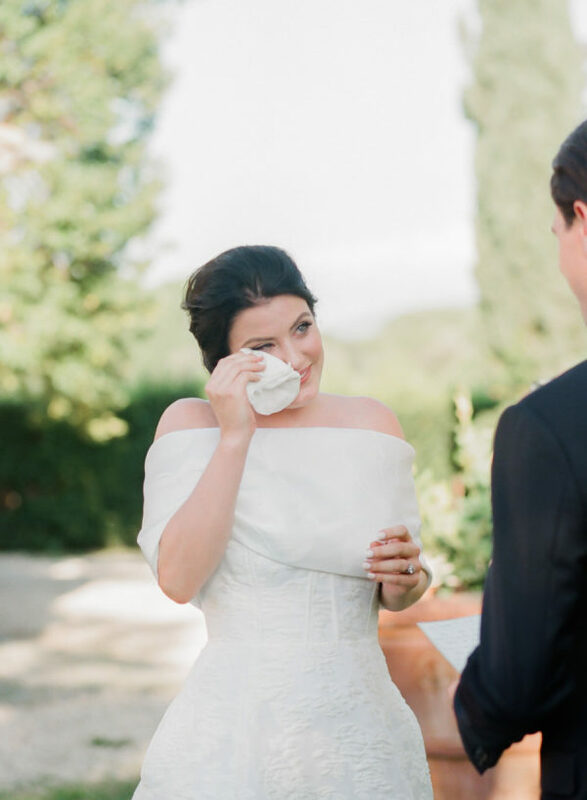 After the two shared their first kiss as a married couple, magical white doves appeared. 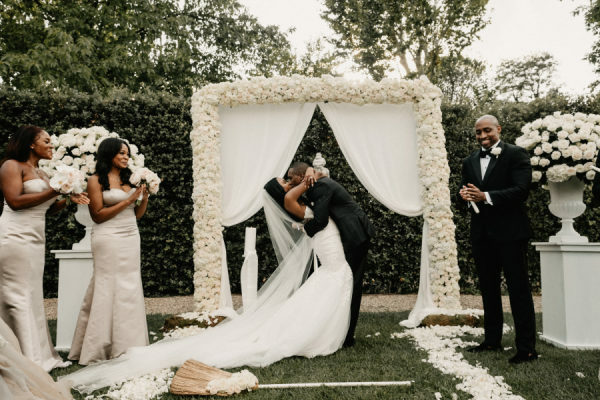 The couple truly celebrated an old tradition as they jumped over the broom to signify their entrance into a new life (or the sweeping away of their past single life), what a memorable finish! 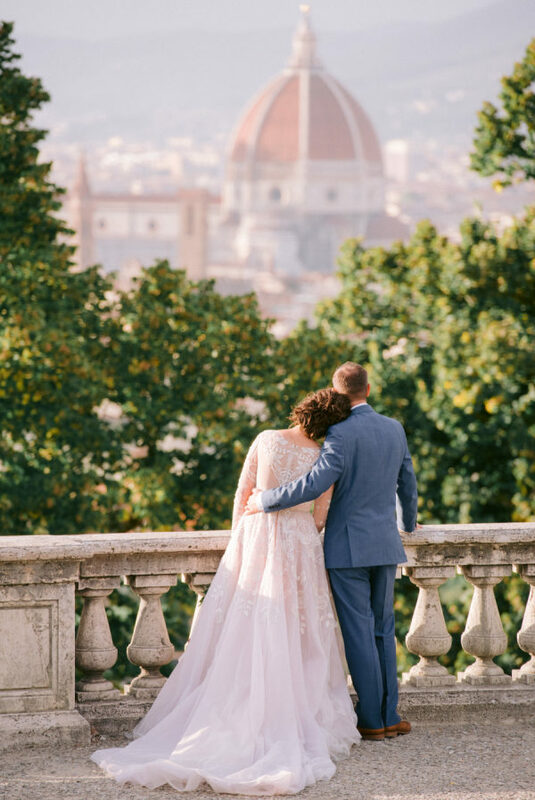 After the ceremony came to an end, this lovely couple has had a walk together with the photographers, Mary & Maurizio – Quattro Studio, and the videographer, Waterfalls Visual, among the beautiful hills and monuments of Florence to catch some amazing shoots. 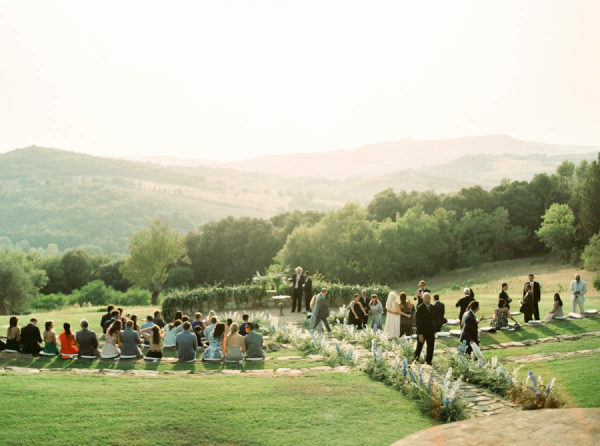 Then The Tuscan Wedding guided all guests to join the newlyweds outside for a cocktails and aperitif. 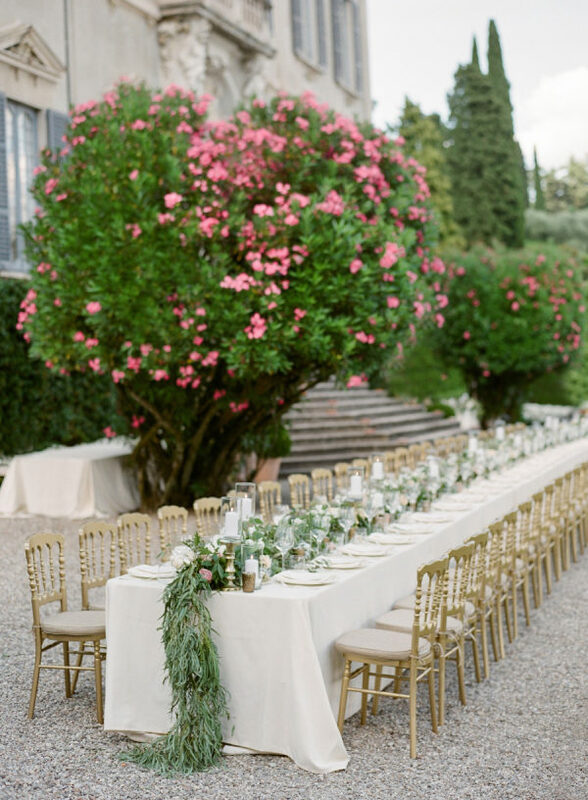 A selection of delectable catering was provided by Villa Cora. There were three courses – Italian style! Tomato and bread crochet with burrata cheese, ravioli filled with ricotta cheese and spinach topped with tomato and lastly beef fillet with potatoes, zucchini and tomatoes. 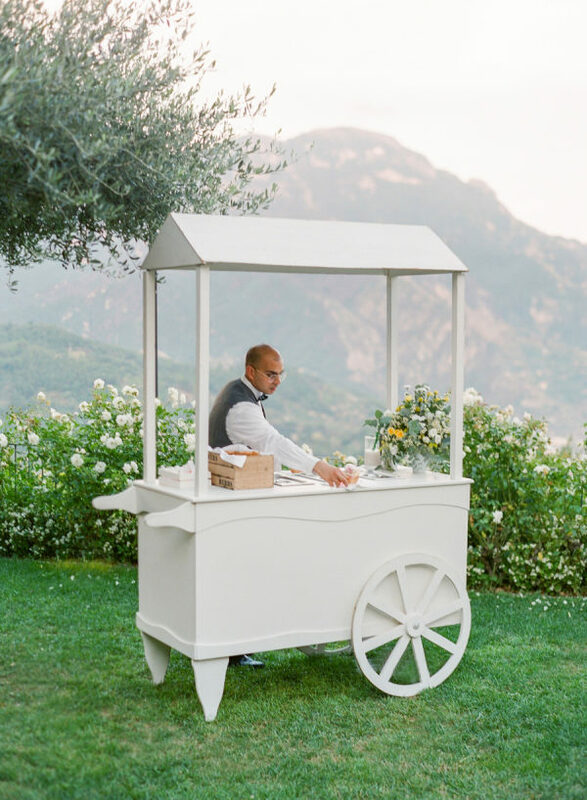 We cannot forget about dessert – an ice cream truck arrived to satisfy everyone’s sweet tooth and then the final masterpiece, wedding cake. 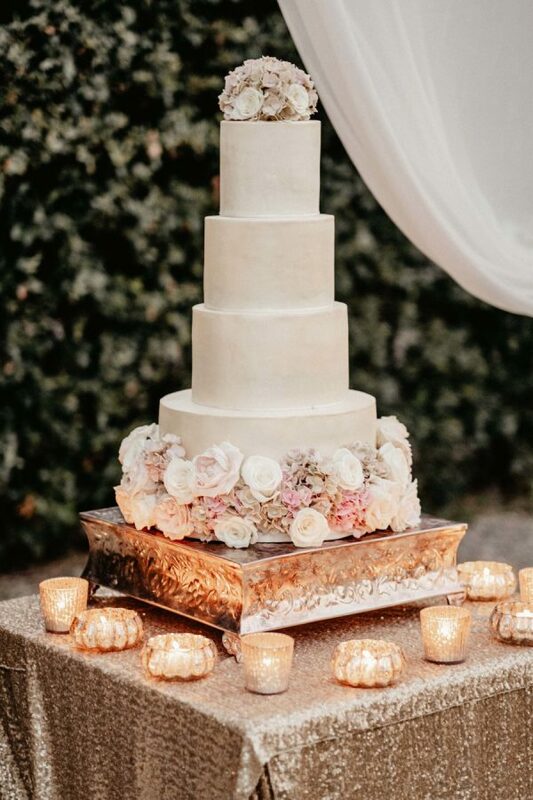 This four-tier classic beauty created by Sugar Cups, was finished with ravishing light blush and ivory flowers. 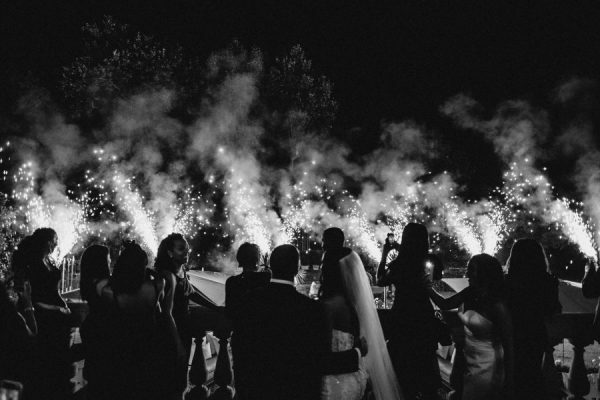 As the reception came to an end, Brooke and Damien wanted to leave their guests with one last bit of entertainment… And what better way to do this than a dazzling fireworks show?! What an electric way to end the perfect evening. 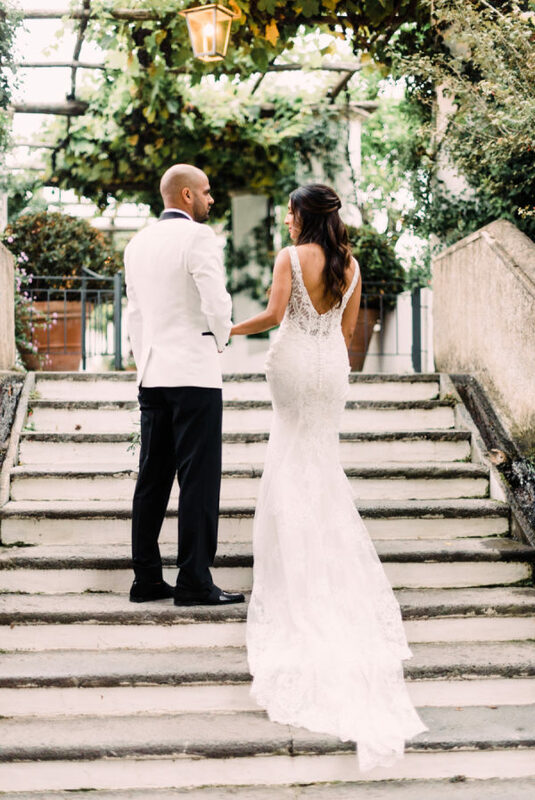 Brooke and Damien are truly soulmates and made for each other, this day really represented the intimate bond they share. Our team was so appreciative to have met this lovely couple and we wish them a life full of happiness and love together. 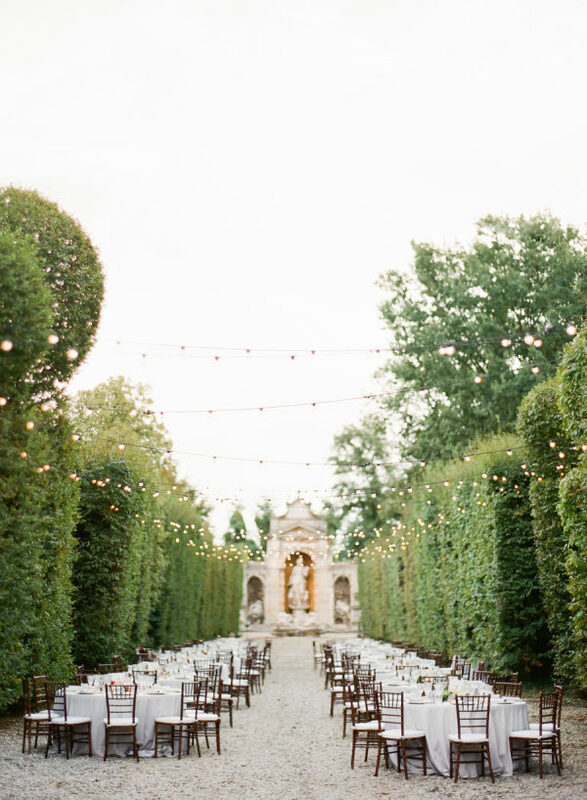 Three things: Italy, Oscar de la Renta and this perfect light. 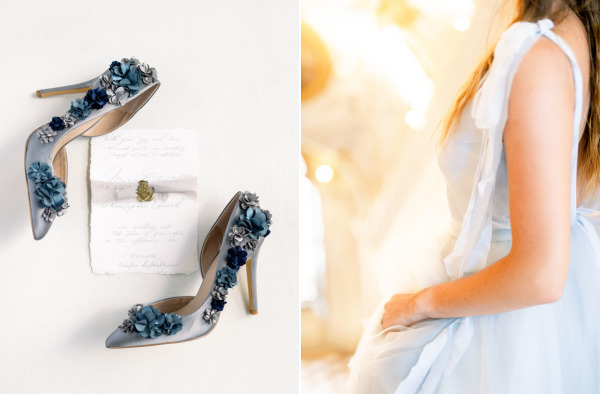 This day is filled with jaw-dropping moments, details and a kind of love that is sure to get the butterflies going for your very own Big Day. 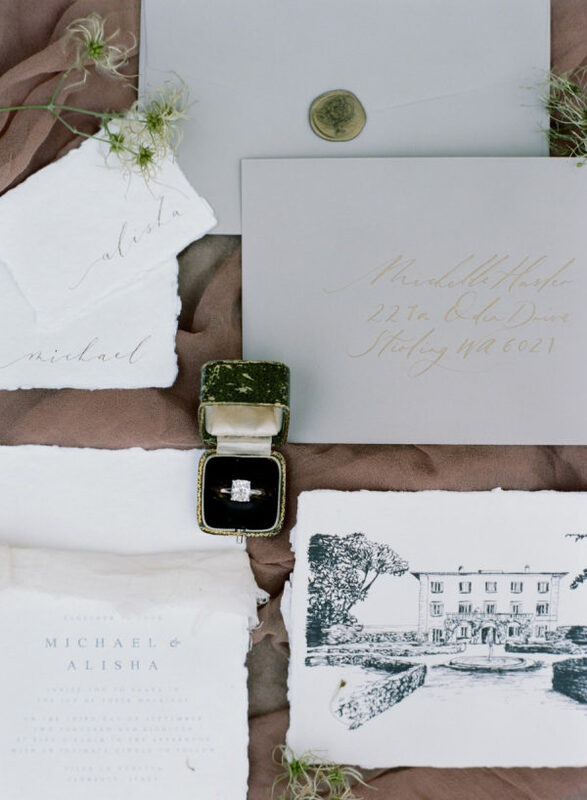 At the planning and design help, The White Rose set a scene for Nicole & Mitchell that was classic, timeless and sophisticated, yet completely unfussy. 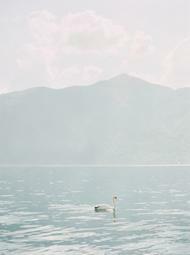 Let Anya Kernes‘ stunning imagery carry you away. 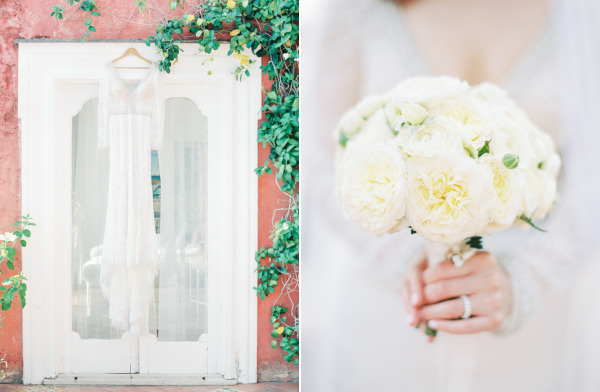 Our color palette was pure white and hints of Bordeaux. 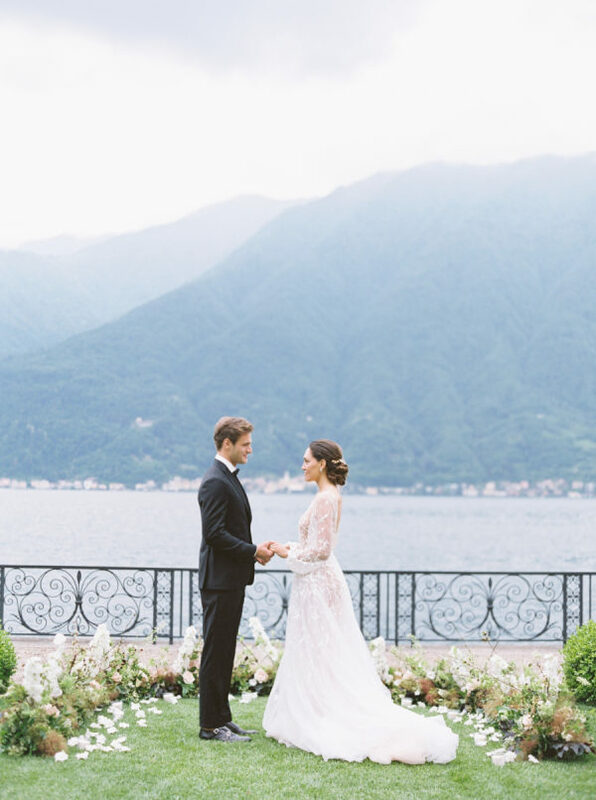 The style vision was classic, timeless and elegant — just like Italy. 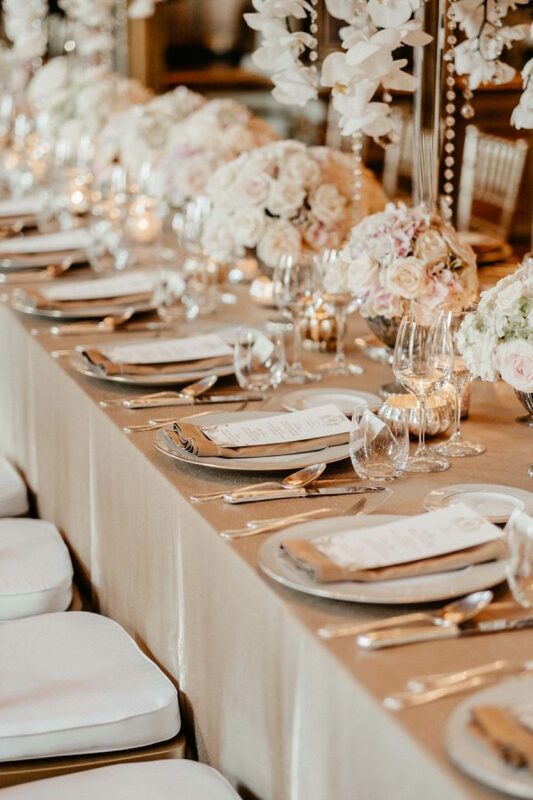 Bordeaux was always my favorite color and since it was a fall wedding we thought it was a beautiful color to add little hints of throughout the decor to contrast the white. 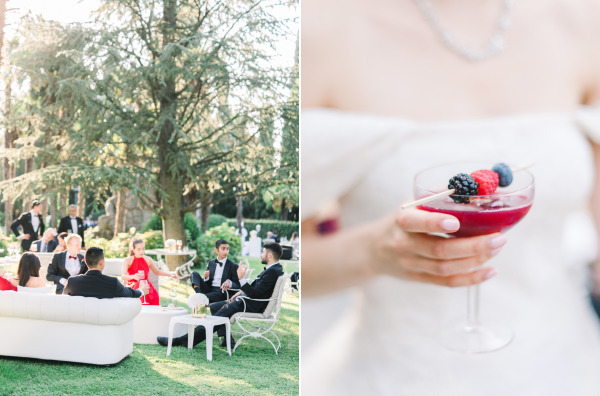 We had a couple details that we made unique but my most memorable were the custom drink they made for us out of freshly muddled berries, a little bit of lemon juice and vodka — the drink was made to match our tones of “Bordeaux” as the drink was this color. Vittorio e Big Band, an Italian orchestra of about 10 people with a lead singer, because my dad is a lifelong fan of Frank Sinatra who the band emulates and The Godfather movies, and a big band at his daughters wedding also emulated this. Another was at our after party on the pier at around 1 am the chef was taking pasta requests of all kind and cooking it in front of the guests in the outdoor kitchen to satisfy late night cravings and ensure the party carries on. What was your favorite moment? Your favorite detail? My favorite moments were the Russian singer at the welcome dinner on Friday and the Israeli cover band at the reception on Saturday. Both managed to create an atmosphere of total unity, excitement and fun. We had people from India, Brazil, Russia, Armenia, America, Serbia and France so to have one performer(s) bring all these nations together on one dance floor at the same time was extremely rewarding to see and be a part of. 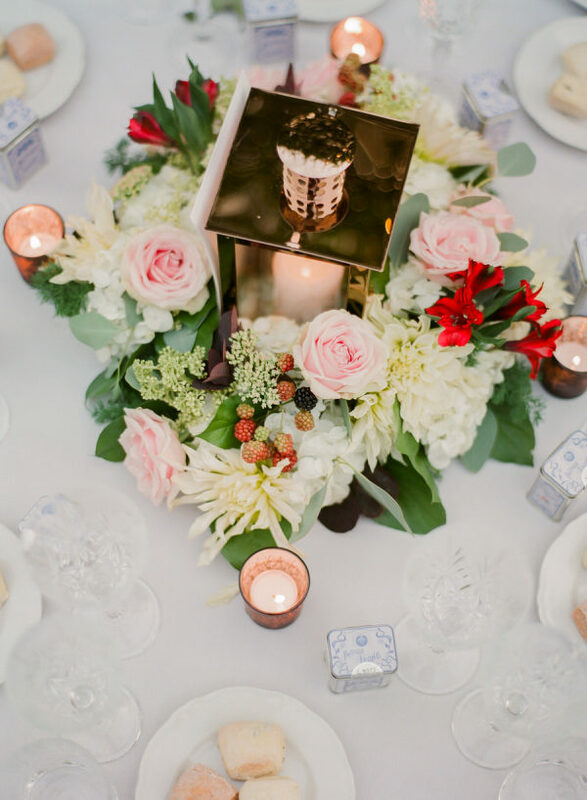 My favorite detail was the combination of the floating candles in glass vases and flowers on each table at the reception – it was absolutely magical and felt like a fairytale. Also the cake cutting was done at the end of the pier right on the lake, surrounded by candles and flowers in the floor to illuminate us as it was dark already, but the favorite part was the surprise 20 minute fireworks my dad arranged for us. 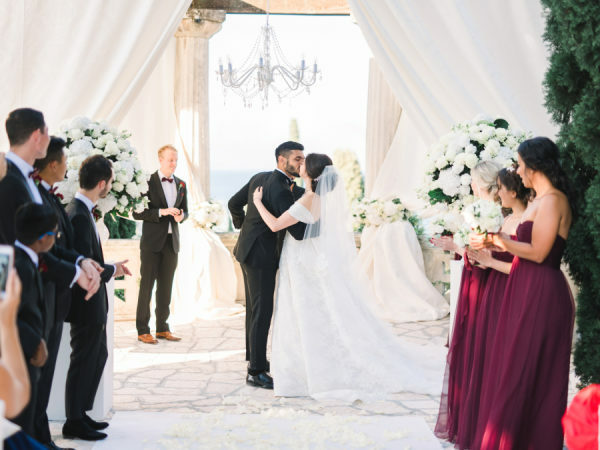 It was incredibly beautiful, romantic and memorable, and I think it was a moment everyone at the wedding will forever remember and cherish. 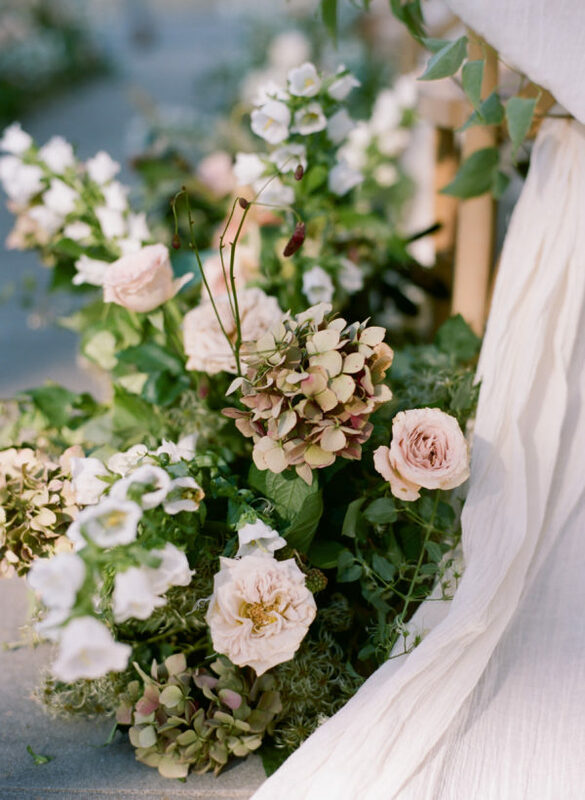 My flowers were all white to keep in theme with “classic, timeless and elegant” — so naturally all the flowers were classics too; roses, peonies, ranunculus and hydrangeas with a touch of baby’s breath. 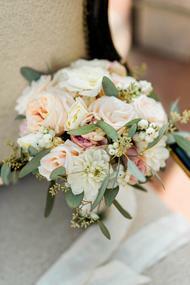 This combination created fullness and elegance, it really made the flowers stand out throughout the ceremony. 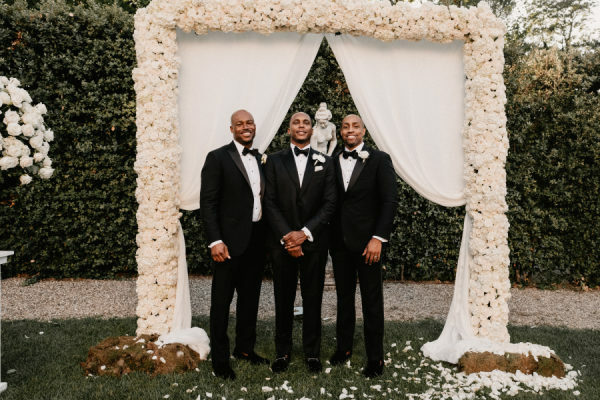 We also put a lot of emphasis on the flowers – we head then cascading off the gazebo in which we go married under, in huge (bigger than the people) vases positioned throughout the apéritive, reception and after party. 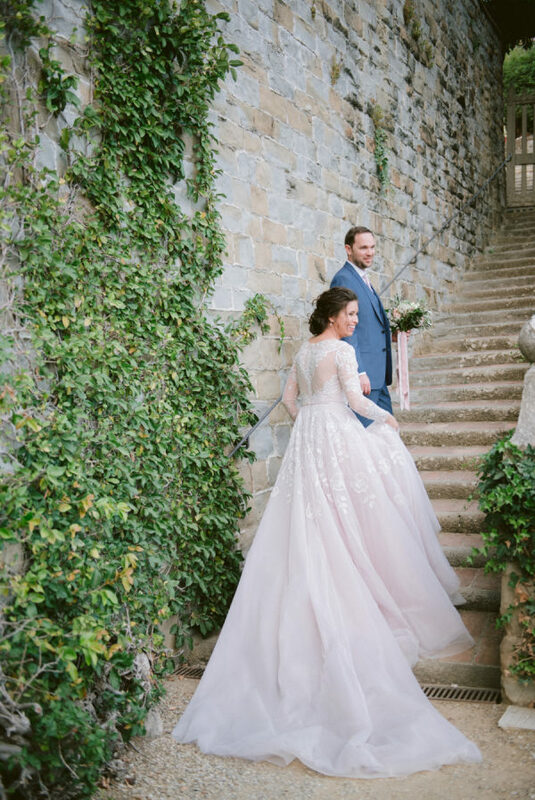 My gown was Oscar de la Renta from the runway but I customized it a little — I added off the shoulder sleeves and added three layers under the skirt to make the dress a lot more pouffy because I had a fairytale ball gown vision for my wedding. 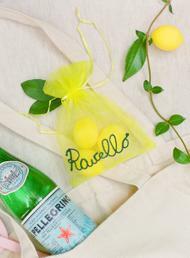 My favors reflected on Italy as it was our neutral ground for our ‘UN wedding’ as we jokingly refer to it. 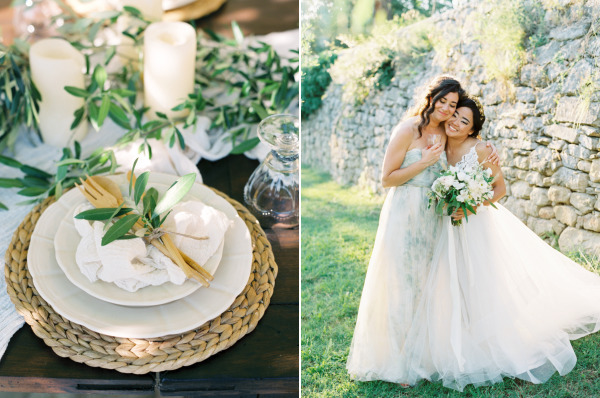 It was olive oil from the region of Garda and a small pouch of Bon Bons, which are candied almonds and are a beloved Italian wedding tradition. Our cake was 3 tier, all white with little white frosting flowers to keep with the theme. The cake itself was a sponge cake with real fruit throughout it. It was light and sweet, we didn’t want anything heavy so people could keep dancing and it reminded me of the cake I had for every birthday growing up till I was 18. It was nice nostalgia. 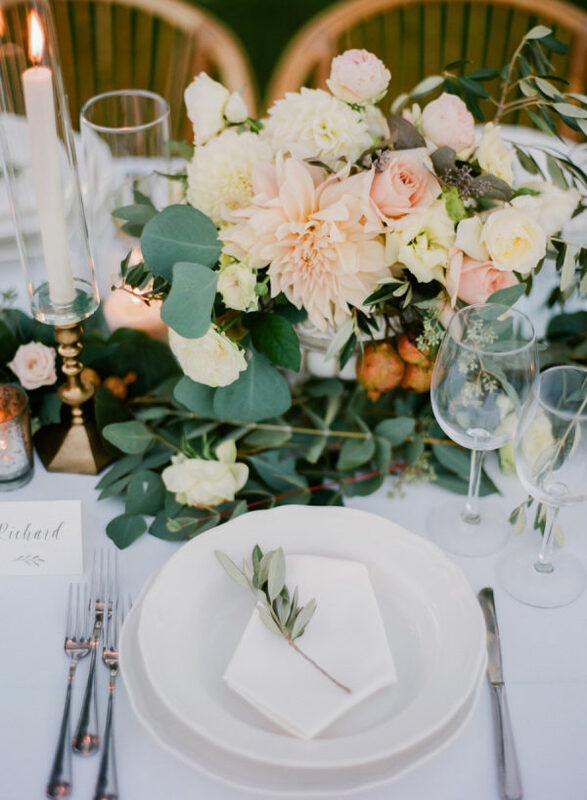 My first advice is that no detail is too small, from the shape of the tables to the font used for the menus but some things are ok to let go of like flower positioning and silverware (even though it seems impossible). My dad helped with a lot of the planning and I have no regrets in loosening my grip a little. 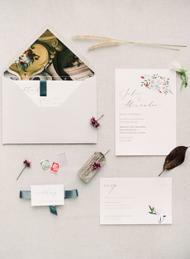 Also, pick the best wedding planner (if you’re using one) that can really meet your needs and understands your vision completely. The White Rose Weddings really brought our 3 day wedding extravaganza together and made it everything we could have dreamed of and more. From Anya Kernes Photography… Nicole and Mitchell’s wedding was a beautiful multi-cultural celebration. 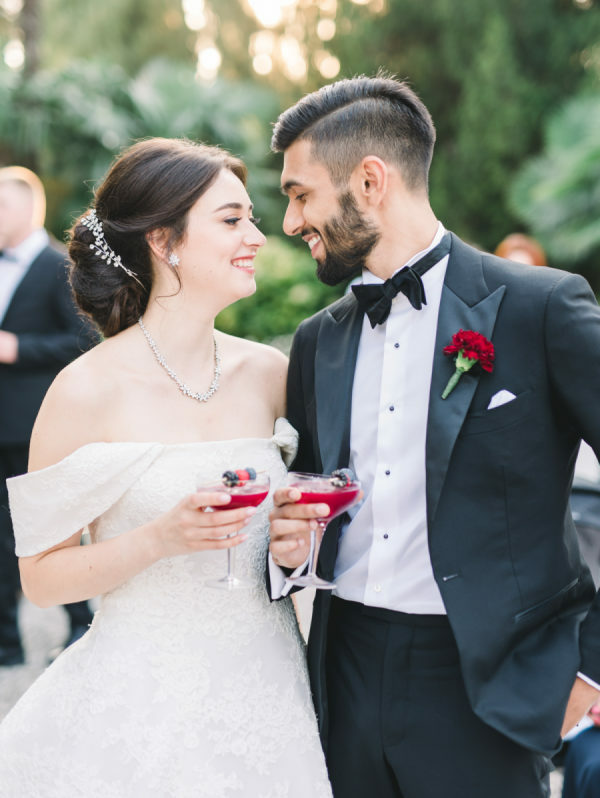 Sweetest couple, gorgeous gowns, delicious food, amazing music and surprise fireworks during the cake cutting – this was a true wedding fairytale! 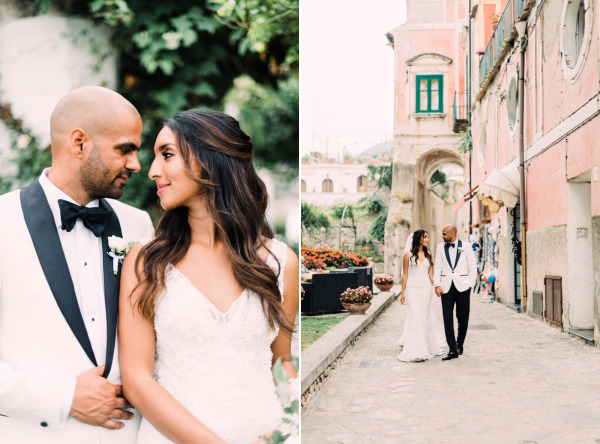 It’s easy to understand why Nicole and Mitchell decided to settle on this location for their Italian destination wedding. 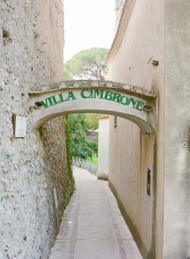 Villa Cortine Palace Hotel is tucked away in the beautiful town of Sirmione, in Lake Garda in Northern Italy. 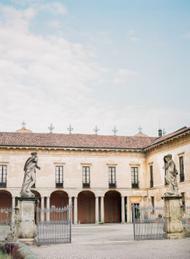 Dating from the 19th century, the grounds of this neoclassical luxury hotel are truly breathtaking and the hospitality here is one of a kind. Nicole wore a dress from Oscar de la Renta, which was quite a showstopper, and Mitchell looked absolutely dashing in his black tux. 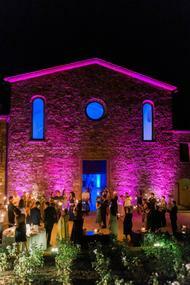 The couple and their families created an unforgettable experience for the guests. 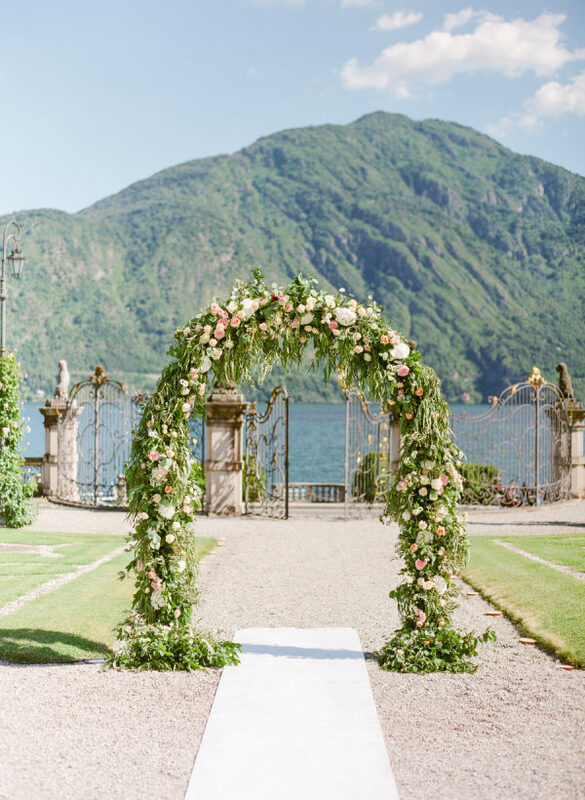 The ceremony took place in a beautiful gardens lined up with cypress trees surrounded with fountains and statues and overlooking the incredible views of Lake Garda. 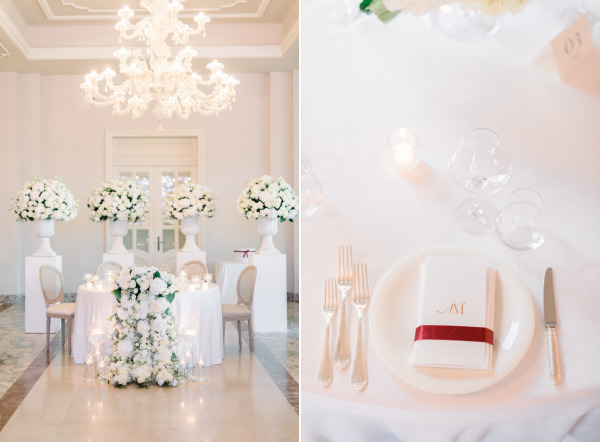 The elegant reception designed by The White Rose was a perfect fit for its surroundings with elements of marble and touches of burgundy. 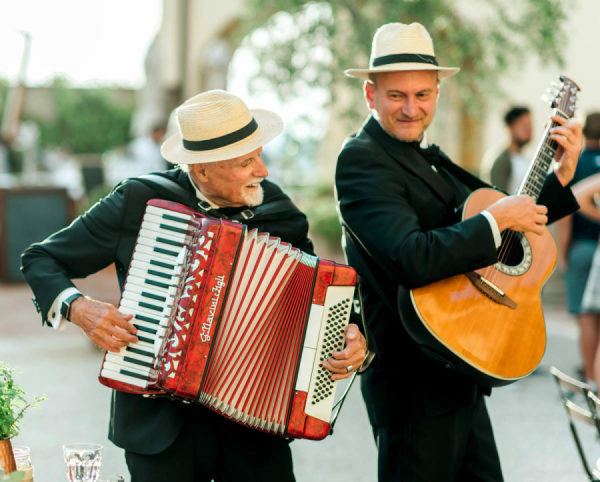 For entertainment, there was non stop live music, including four amazing bands – Vittorio e Big Band, Ricchi e Poveri, Eiffel 65, and the Legend Band. 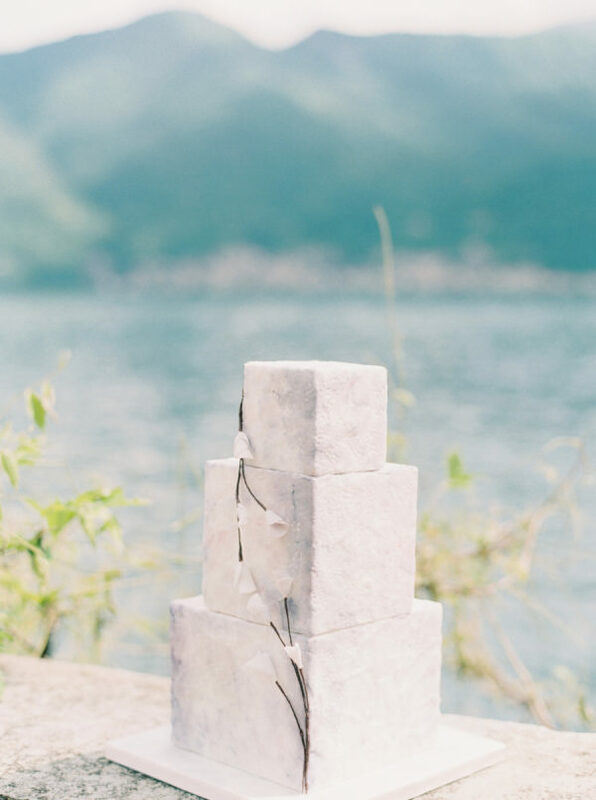 After the formal reception, the guests were invited to come down to the lake for the cake cutting with surprise fireworks followed by an amazing after party. A night to remember? You bet. 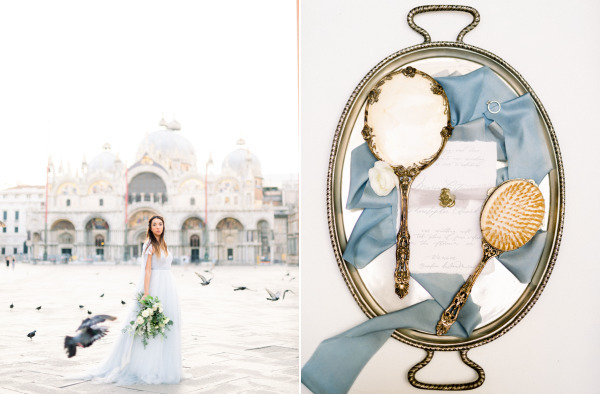 This stunning elopement inspiration is inspired by the soft blue hues and gilded details of Saint Marks Basilica in San Marco Piazza. 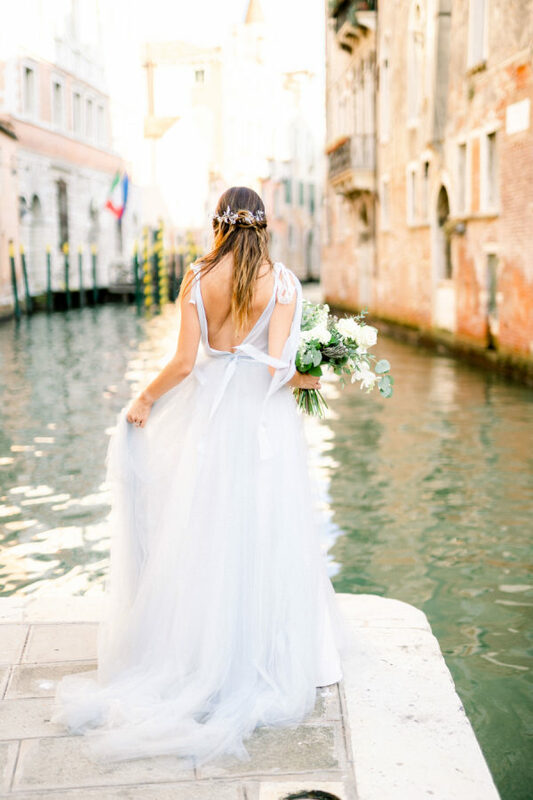 Since Venice is known for its deep jewel tones of reds, emeralds and blues – Ema Giangreco Weddings wanted to present a softer take on the famous floating city. 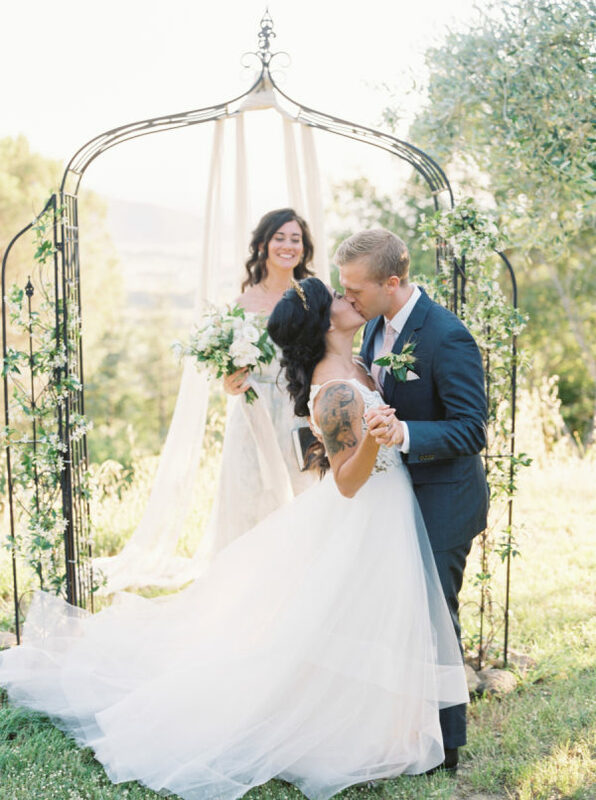 Hunter Ryan Photo was there to capture every perfect moment. 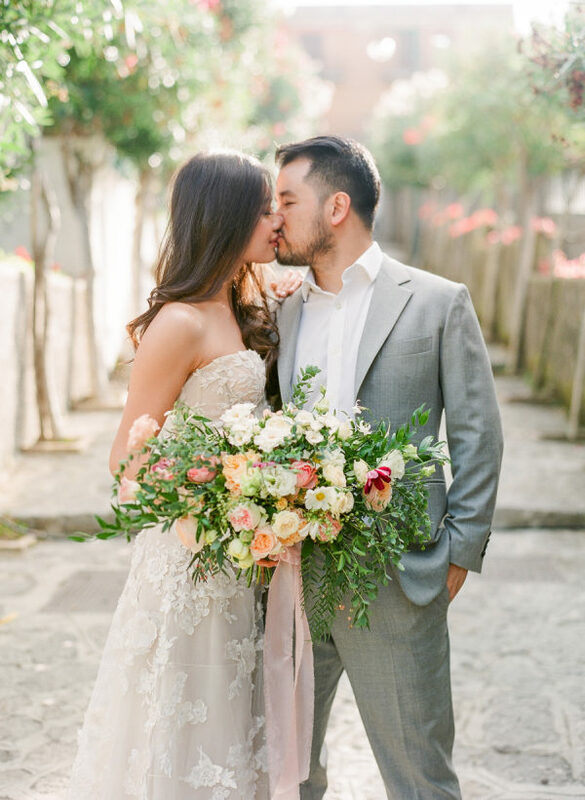 Keep on reading to find out more about this romantic Italian affair. 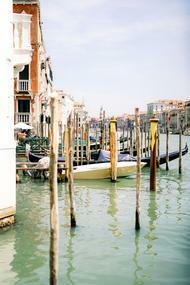 From Hunter Ryan Photo… Venice. 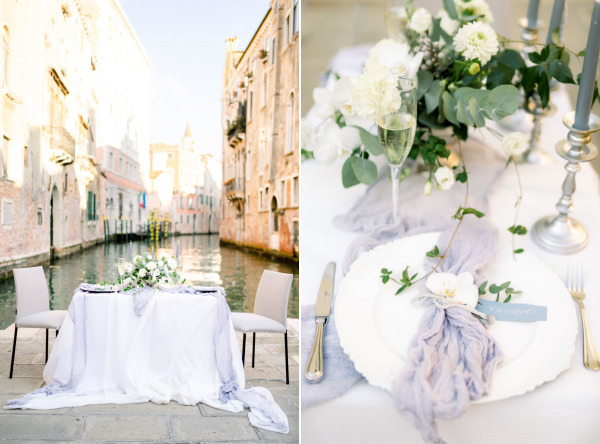 Known for it’s regal grandeur & in rich jewel tones – Italian-American planner Ema Giangreco wanted to showcase a softer side of Venice. 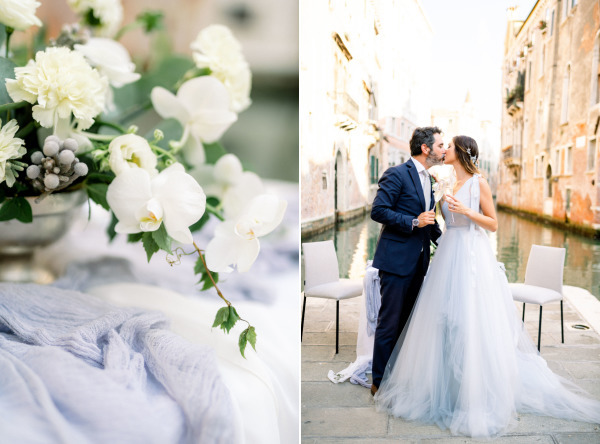 Living and planning weddings in Venice for years -she’s seen many deep reds, golds, emeralds and blues in Venetian wedding design – so we opted for a completely different vibe for our couple. 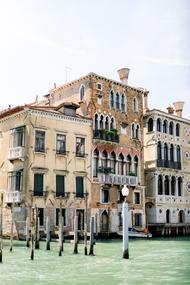 The color palette was derived from the famous Saint Marks Basilica in San Marco Piazza. 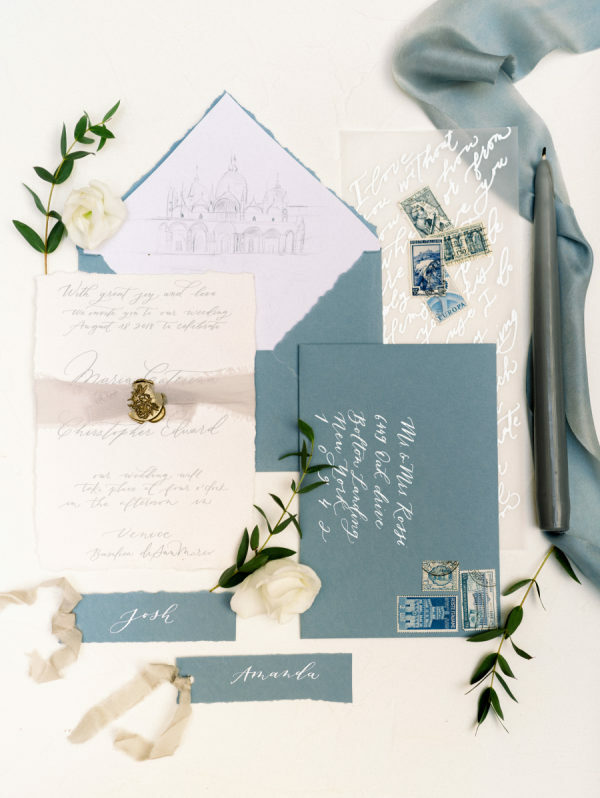 The domes of soft blue hues with gold gilding, the building walls – soft greys and creams. The florals were clean and simple whites and greenery – with an unexpected modern touch of white orchids. 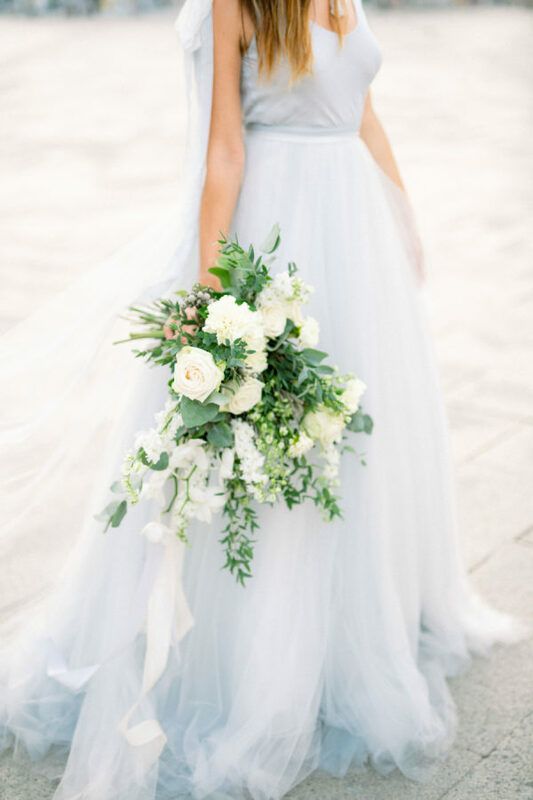 Custom gown designer Silvia Valli created a one of a kind gown for the bride with hints of dove grey and muted blue tones in a soft ethereal vibe. 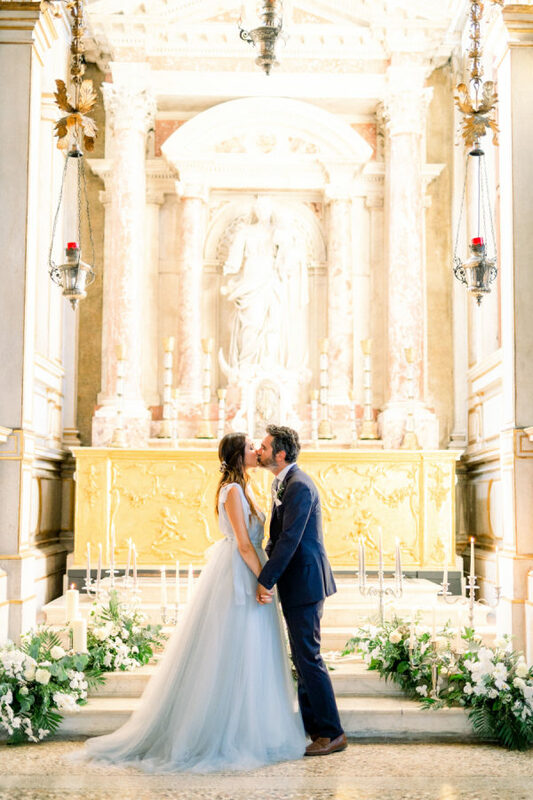 A perfect juxtaposition of the grand church where the heavily candle-laden ceremony took place. 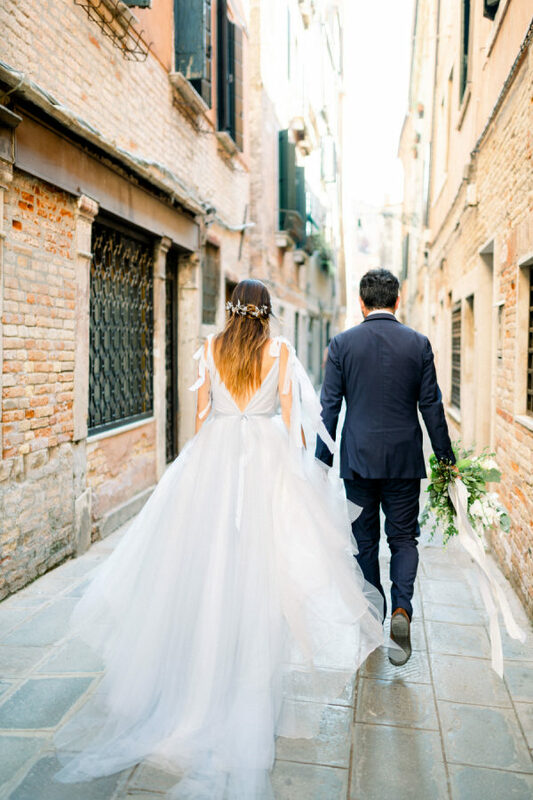 Just a short distance from the church the couple walked the back canals of Venice to their reception location – an intimate space set for two at the Palazzo Morosini – canal front. 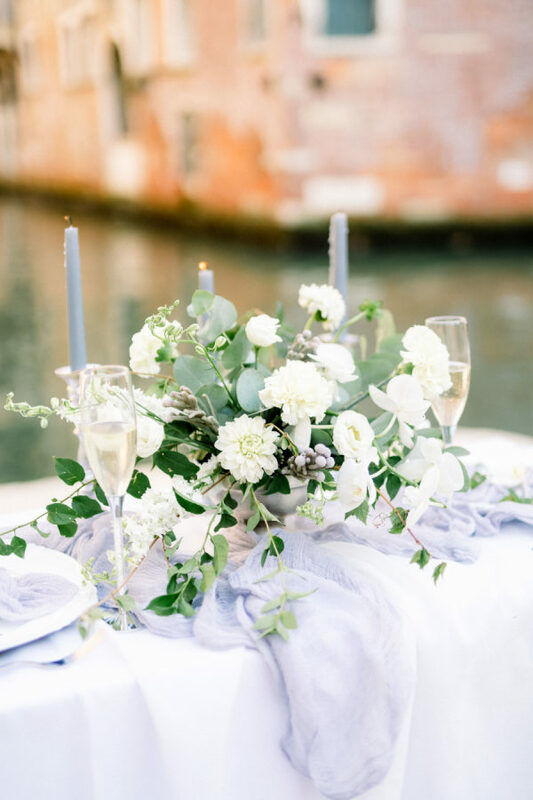 The soft design carried through to the table – again boasting soft greys & blues – punctuated with simple white florals and greenery. 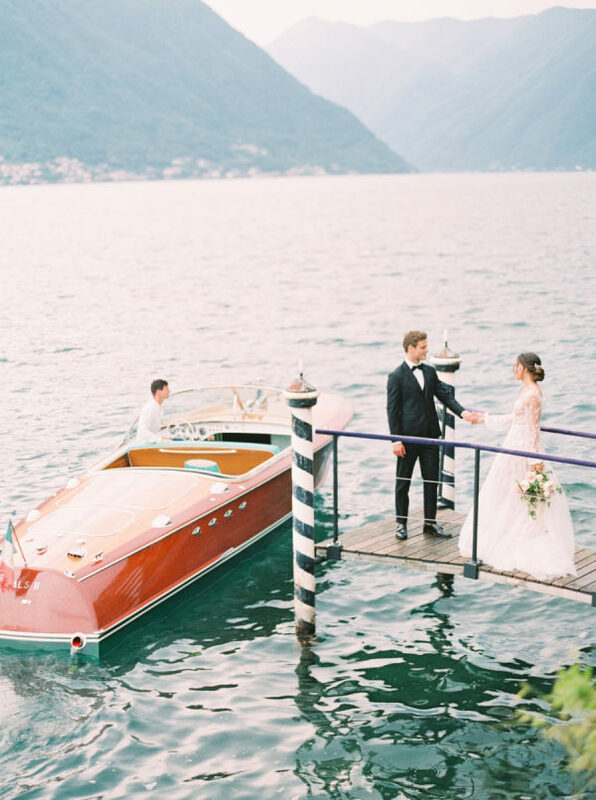 The couple departed their reception in a quintessential Venetian gondola for two. 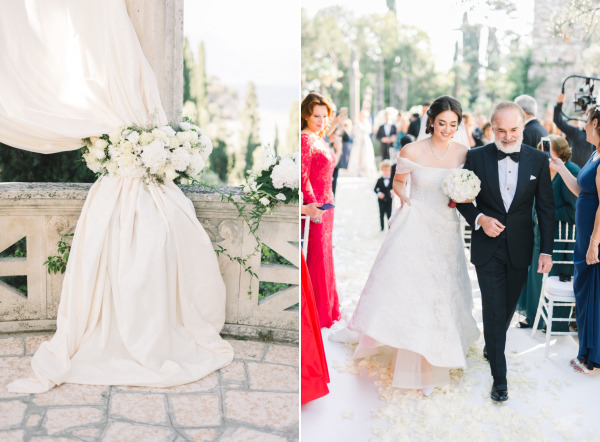 A fairytale villa in Lake Como, a romantic post-ceremony boat ride and a stunning Galia Lahav dress… um can you say yes, yes, YES?! 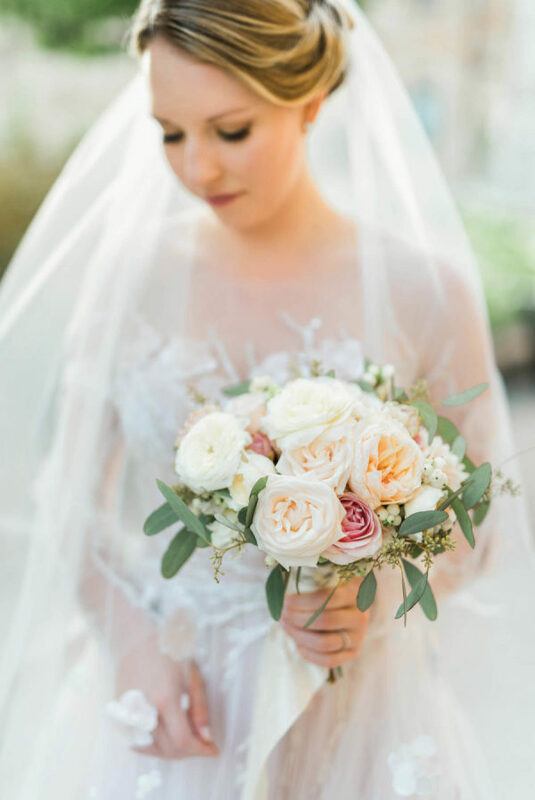 Oliver Fly Photography captured this magical day teeming with lush blooms by Figli Dei Fiori and intimate details planned to perfection by Le Mariage Made in Italy. Trust us folks, this is one for the storybooks. 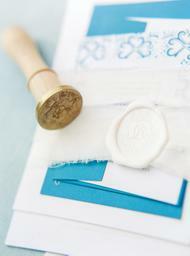 What did you envision your wedding being prior to planning? 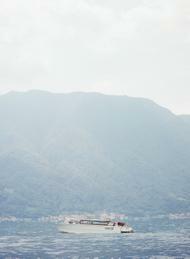 Why did you choose Lake Como? 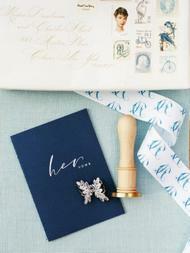 From the bride… Prior to planning, my fiancé and I discussed what we both envisioned our wedding to be. 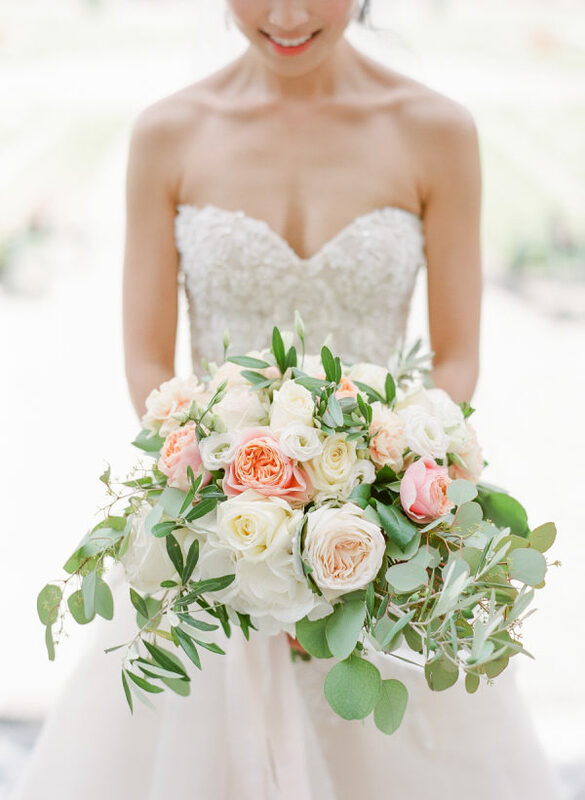 I wanted flowers with lots of natural light; George wanted great food and a live band to amp up our guests, and we both expressed that we wanted a body of water, whether it was a sea or a lake, to be in the background as we got married. 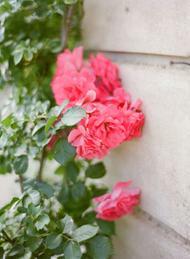 That helped us narrow down some choices as we were inquiring various venues. 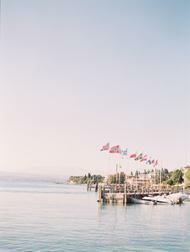 We wanted a location that would be easy for our guests to fly into and to enjoy the weekend as they celebrated with us. 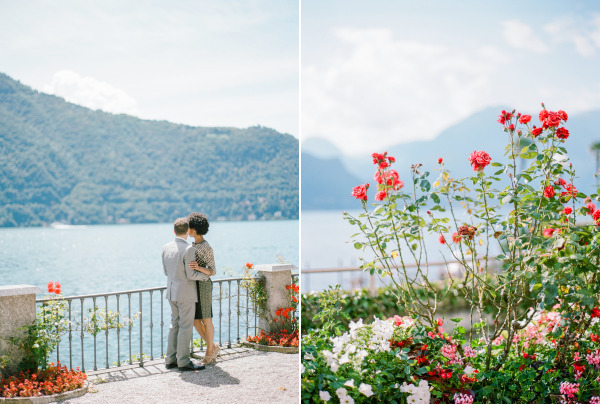 It was an easy choice for us to finalize our decision and choose Lake Como! 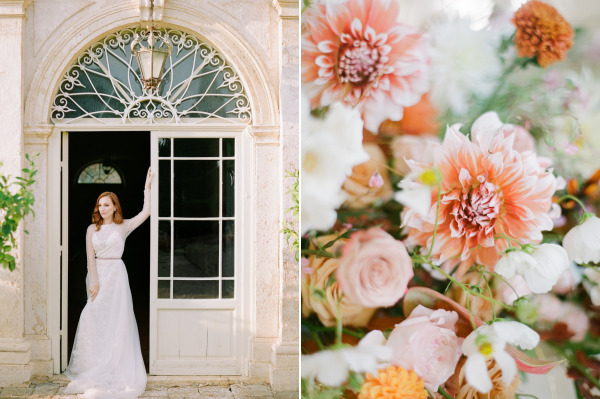 The flowers in the Villa’s garden and the decorative golden gates inspired me to incorporate blush, ivory, and gold into my color palette. 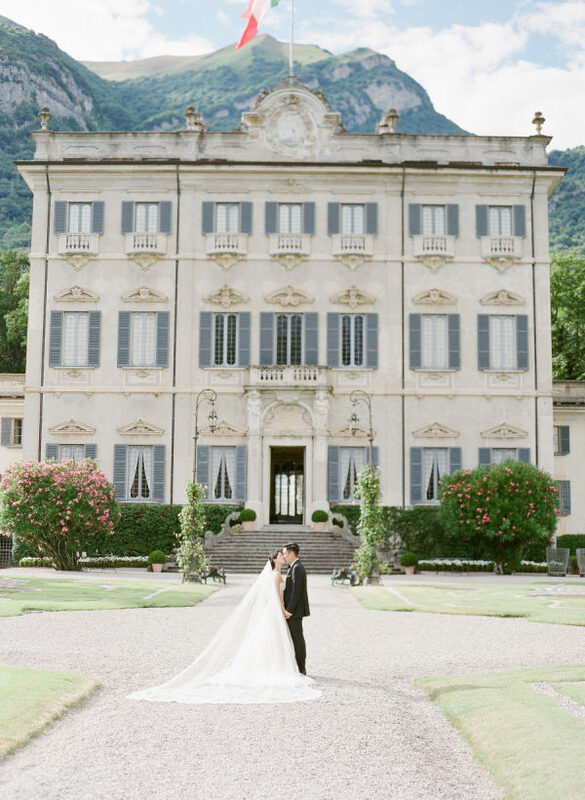 I envisioned a timeless and elegant wedding where I incorporated much of the natural splendor of the Villa and Lake Como. 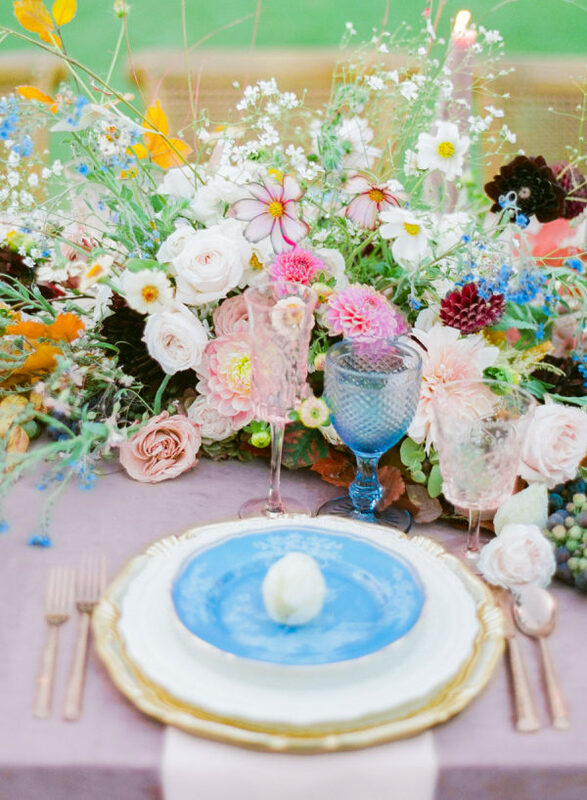 I was going for a classy and sophisticated, using as many local vendors as possible so that our guests who flew literally half way around the world from New York to Korea could have a taste of the local food and ambience. 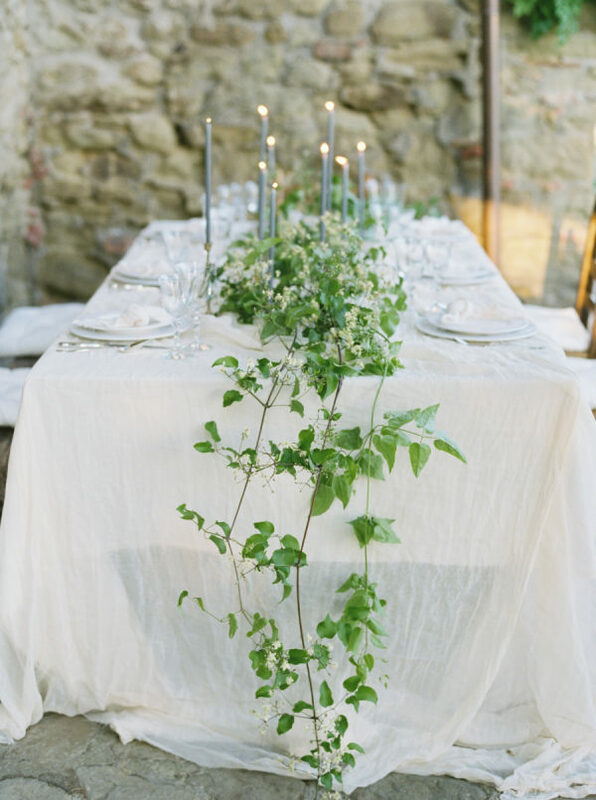 We used a local flower vendor, Figli dei Fiori, and incorporated many of the local flowers from the Como region and added classic touches like metallic candles on the tables and on the stairs to create a warm, glowing effect. 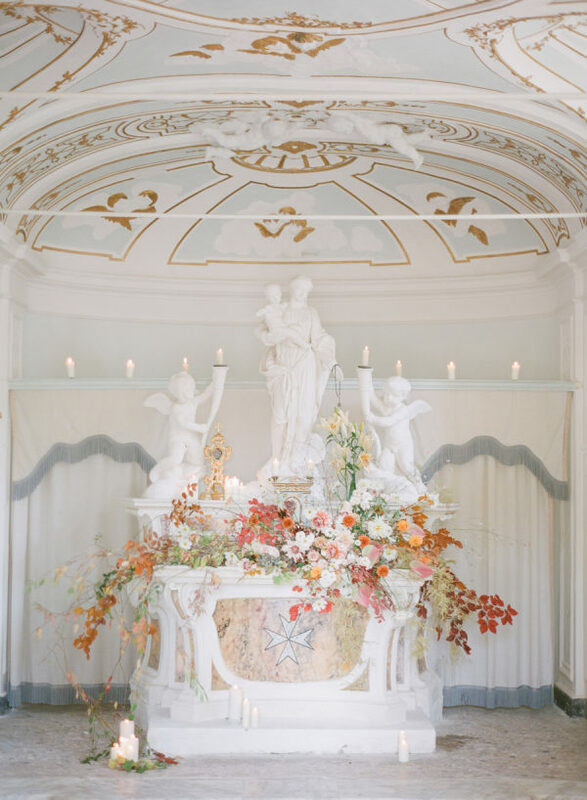 Additionally, the main parlor is ornately decorated with Italian frescos, beautiful antiques and furniture, so I felt like I did not have to add much to the décor. 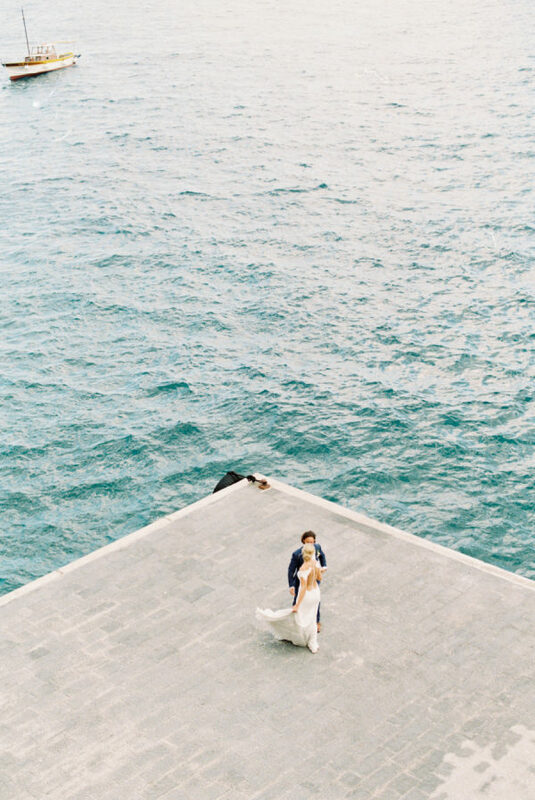 Why did you choose this wedding venue? 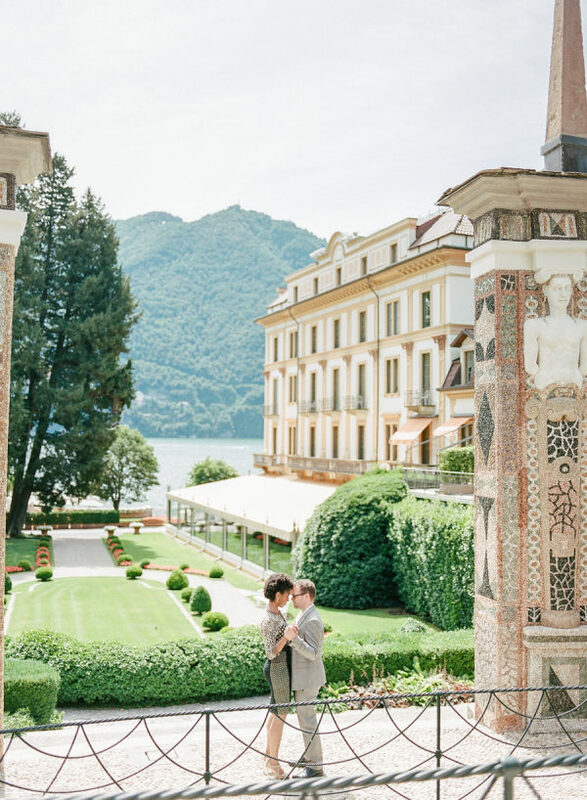 We decided to get married at Villa Sola Cabiati in Lake Como, Italy because it was exactly what we were looking for – timeless, elegant, and classy. 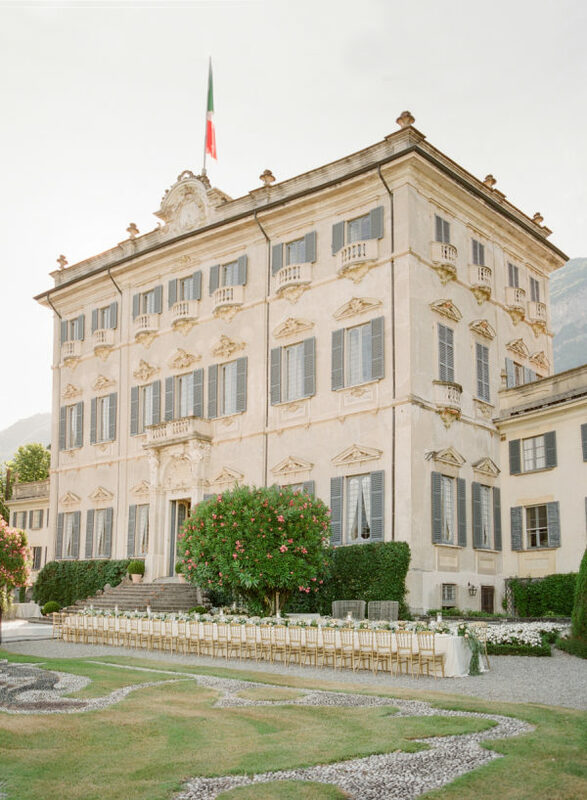 The Villa is like a walking museum: it was Charles II’s and the Duke of Serbelloni’s summerhouse and even houses Napoleon’s and Josephine’s beds and their personal items including Napoleon’s hat! 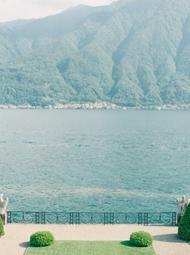 Through a recent partnership with Grand Hotel Tremezzo, it has been recently open to the public for private events, and we knew it would be perfect for our wedding venue since we would have exclusive use of the property and it would be an incredibly special weekend for our guests as they celebrated our wedding with us. 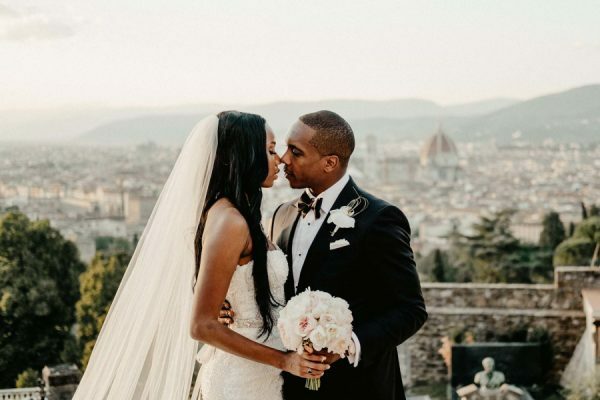 We had a three day wedding celebration: the first night was at Grand Hotel Tremezzo’s T-Beach, right on Lake Como, and the other two days were at the Villa. Since we had the Villa to ourselves for the whole weekend, it was amazing to be immersed in history and also to create our own history in the Villa! 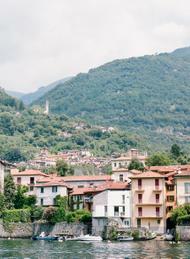 One thing my fiancé and I wanted was to have our guests enjoy their weekend at Lake Como. We decided to go with a live band, which was the best choice we made regarding music. The wedding singer was incredible and she knew exactly when to liven up the mood and was so heartfelt during the emotional times like our first dance. 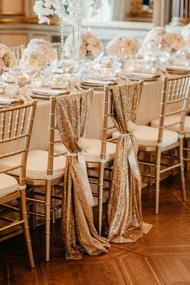 We still get comments from our friends about where we hired such an amazing wedding singer, so thank you Blunotte Events! 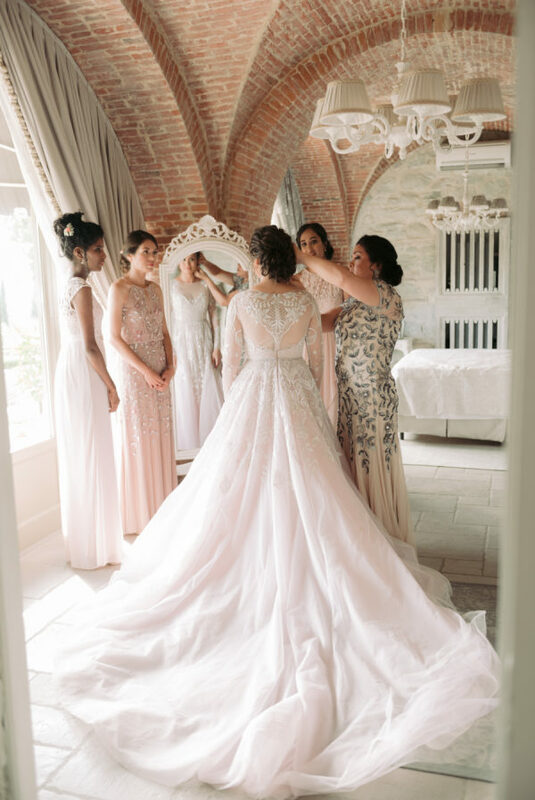 Additionally, my mother, who is the Creative Director of Nora Noh – our family business, made unique dresses for everyone in the wedding. 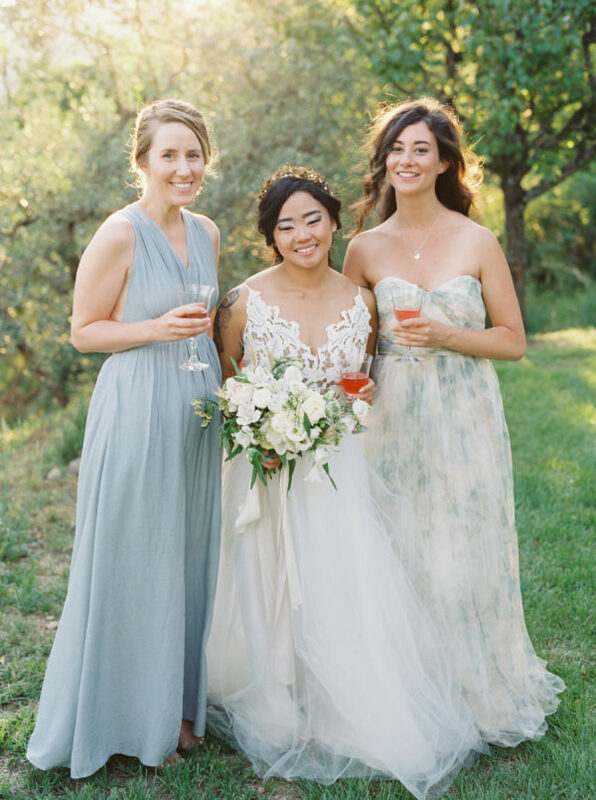 She designed and made my second dress, all 7 bridesmaid dresses, her dress, my mother-in-law’s dress, and my aunt’s dress. It was so special for me that she gifted me this timeless and precious dress, especially all while designing for her collection. 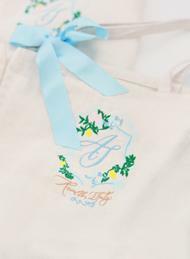 I am forever grateful for this unique gift she gave me for my wedding day! 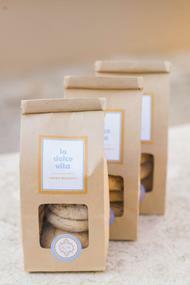 Since we were having a destination wedding and we love the Italian culture and food, we incorporated as many local vendors as possible. 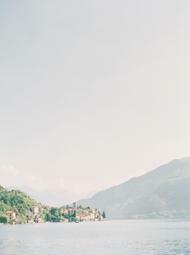 We got a recommendation from Grand Hotel Tremezzo for our caterer, a second-generation family run business. 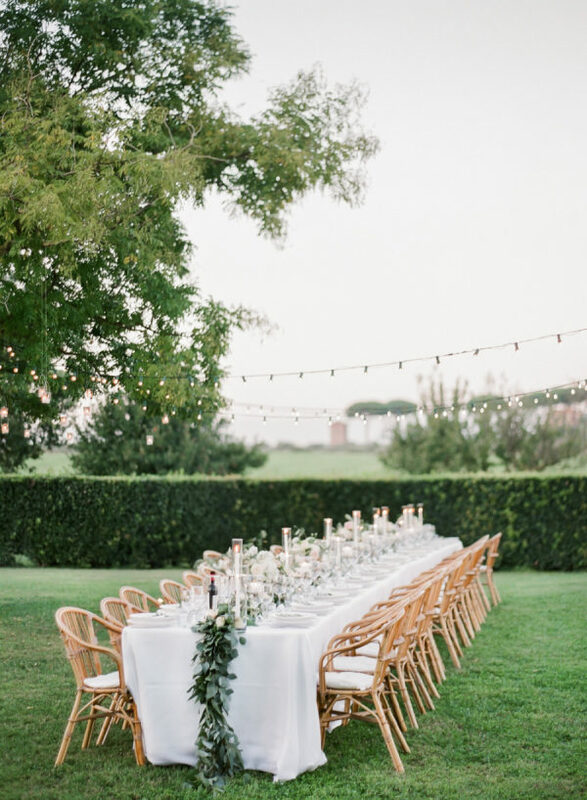 We incorporated many Italian dishes and included many of the wines from our caterer’s own vineyard! 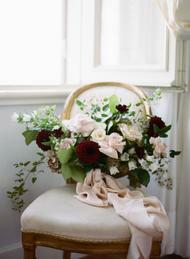 We also incorporated local and seasonal flowers like lisianthus and peonies. 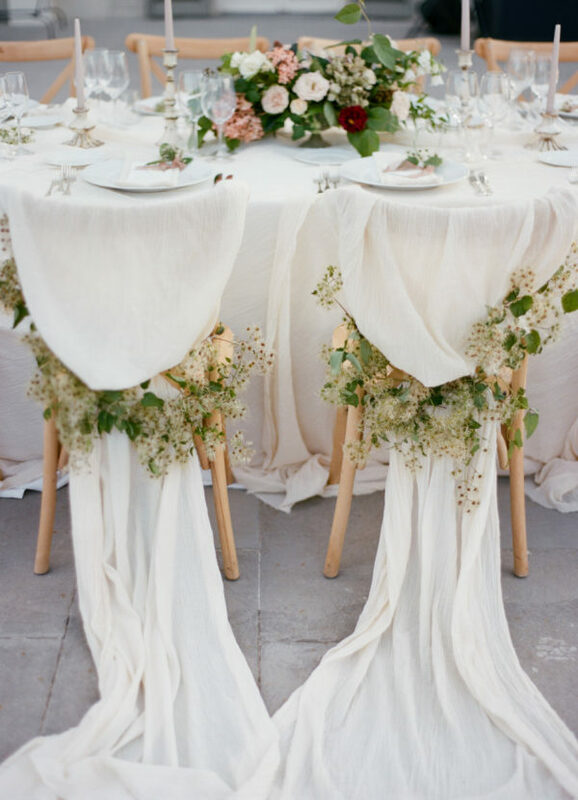 We had a flower arch and incorporated more greenery on our imperial tables. We also wanted our cake to be filled with Italian wild berries and cream, which is our favorite dessert. 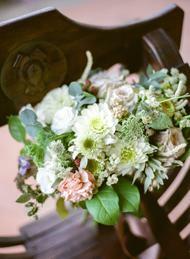 The cake was also adorned with the local flowers that we used in my wedding bouquet. 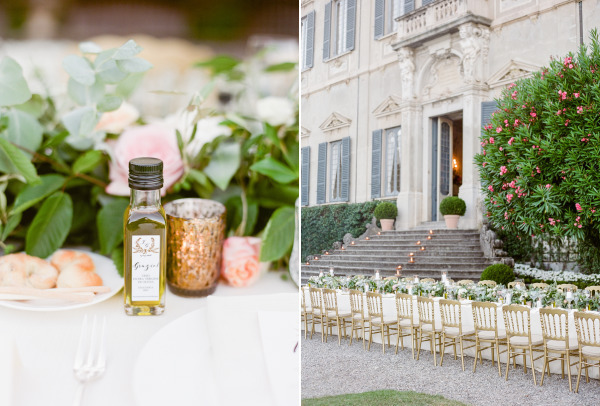 My wedding planner, Oana from Le Mariage Made In Italy, helped me source the olive oil favors from Tuscany directly from the olive oil. 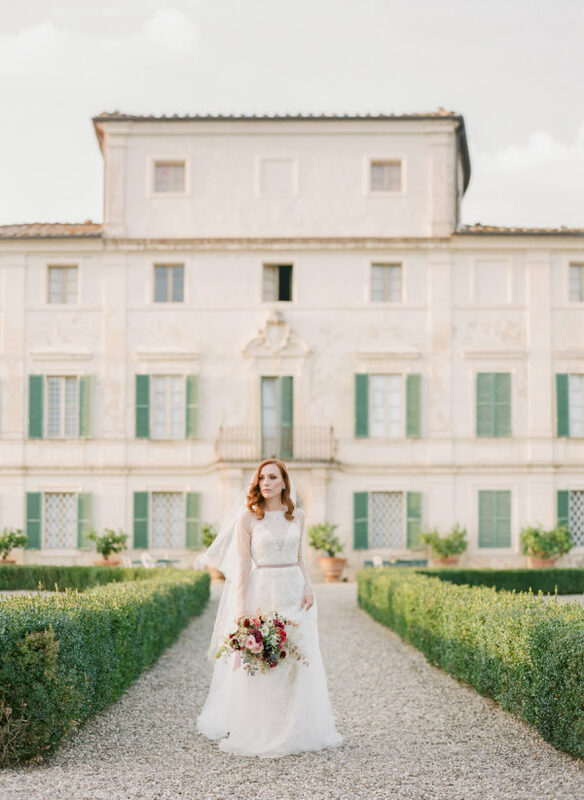 The flowers from the beautifully curated gardens of the Villa inspired my first dress. 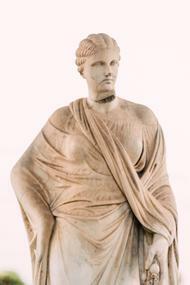 I wanted a dress that would make me feel elegant and classy yet showed a fitted bodice. 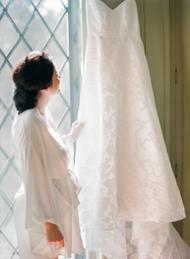 As for my second dress, my mother designed and created my dress to have a more slim-fitting silhouette. I changed my dress before my father-daughter dance since it meant a lot to me to wear my mother’s creation with my dad. 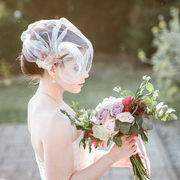 Some advice I received and would give to future brides will be to breathe and enjoy your wedding. 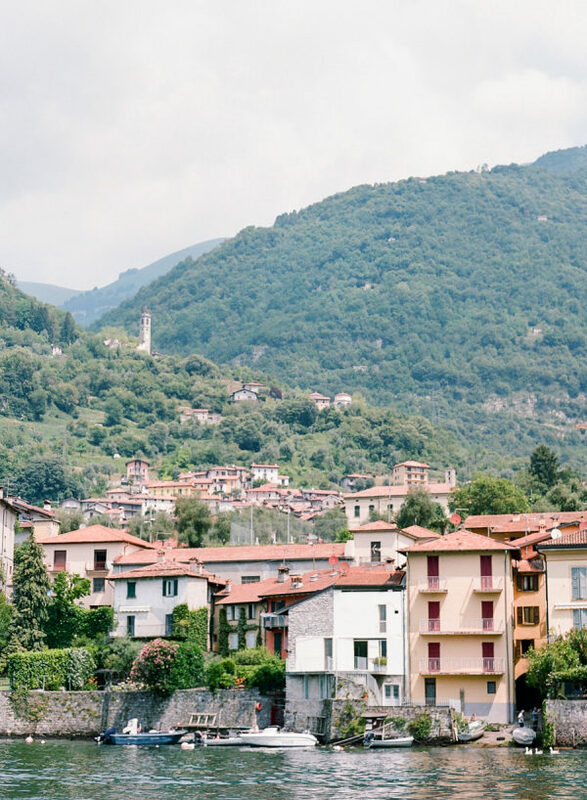 This is one of the greatest times in your life and there will be times when it does not go as planned (We had many logistical issues leading up to the wedding since there was a huge Dolce & Gabanna event all over Lake Como during the same weekend, which lead to a lot of chaos for us! ), but take a breath and remember that in the end, all of your family and loved ones are there to celebrate YOU. 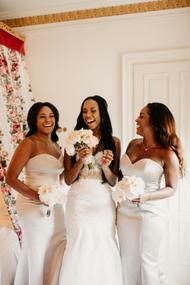 You are surrounded by those who have traveled so far to be with you on your special day. 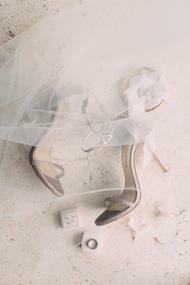 So, even if it does not go as planned, take a breath and enjoy your wedding! Also, make sure you eat throughout the day/weekend. 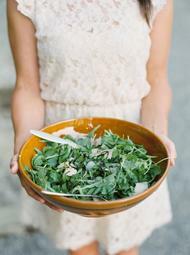 I was so nervous and anxious that I physically couldn’t keep my food down a day before my wedding festivities. I had pieces of bread and also had electrolyte chews that help replenish me ! 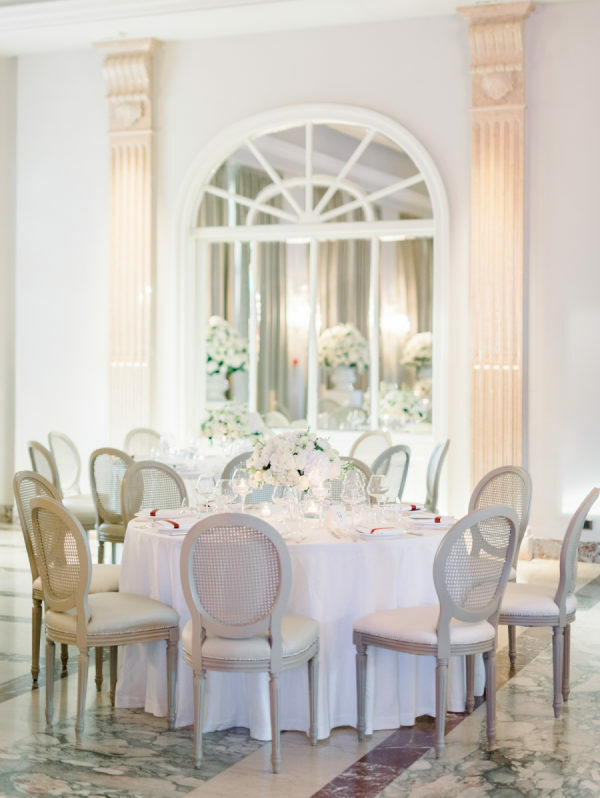 From the planner, Le Mariage Made in Italy… Jean and George’s wedding was created to represent them in every detail. 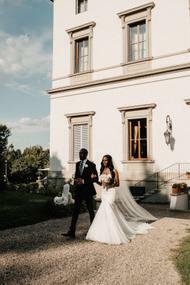 They chose Villa Sola Cabiati, one of the most romantic wedding venues on Lake Como and the mission was not to overdo it. Elegant table setting and organic flower arrangements with hues of pink and peach decorated the magnificent imperial table positioned at the Villa’s doorstep, overlooking the breathtaking lake and timeless garden. 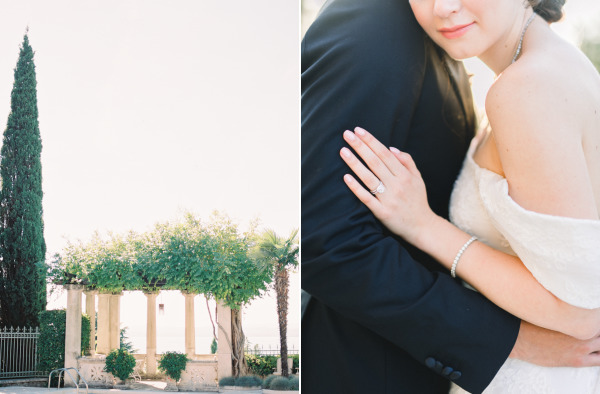 The entire planning process with them was a delight and D day felt like a dream – poetic, flawless and unforgettable. 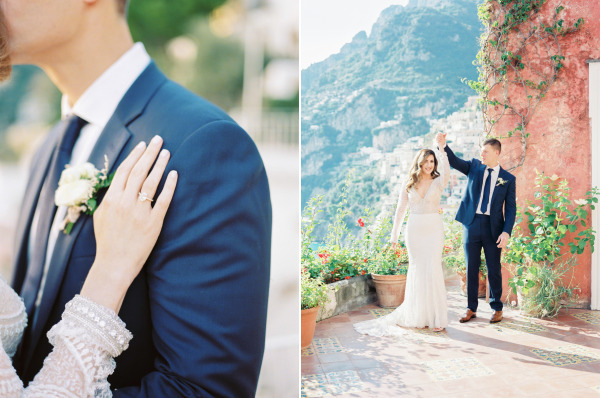 There’s nothing like a Positano wedding to warm the soul. 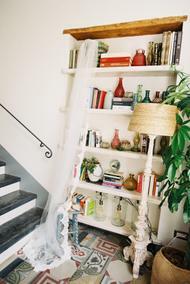 The scenery commands attention and makes way for minimal decor and a completely charming atmosphere. 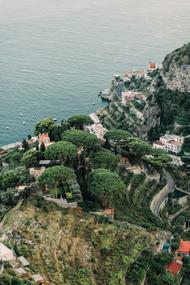 The view for today’s fete is perched from Marincanto Hotel and you guys, it is out. of. this. world. 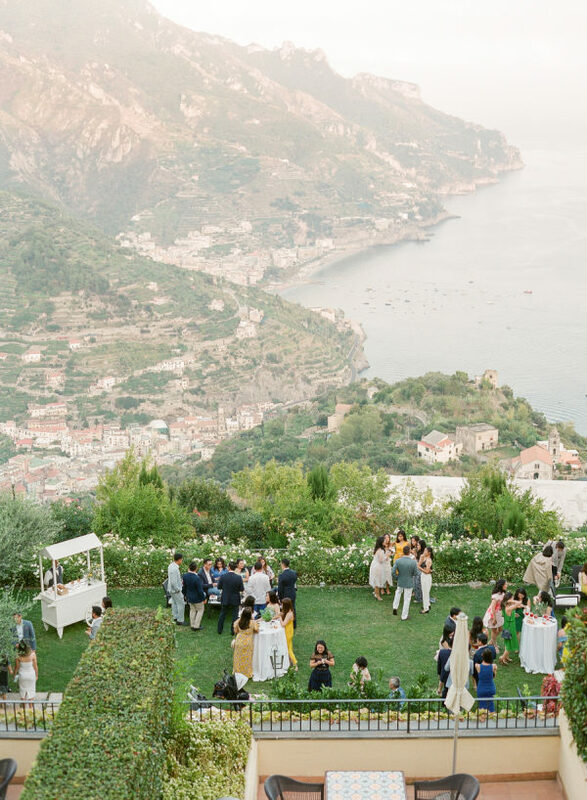 Emma Events wove in the necessary elements while letting the backdrop speak for itself and 2 Brides Photography made sure to do the Amalfi Coast justice with their beautiful imagery—have a look here. 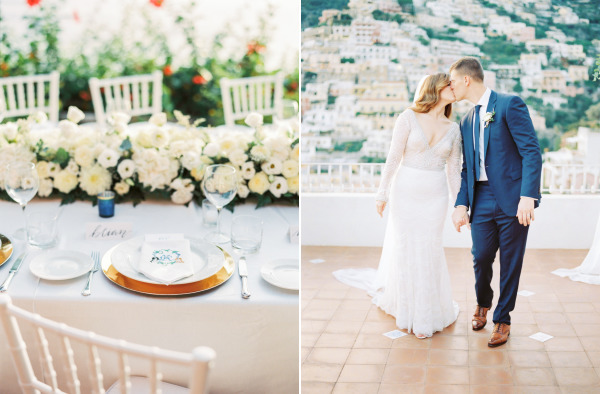 From 2 Brides Photography… Even a journey of a thousand miles begins with one step, and Megan & Charles took their first steps as husband & wife at the romantic Marincanto hotel in Positano. 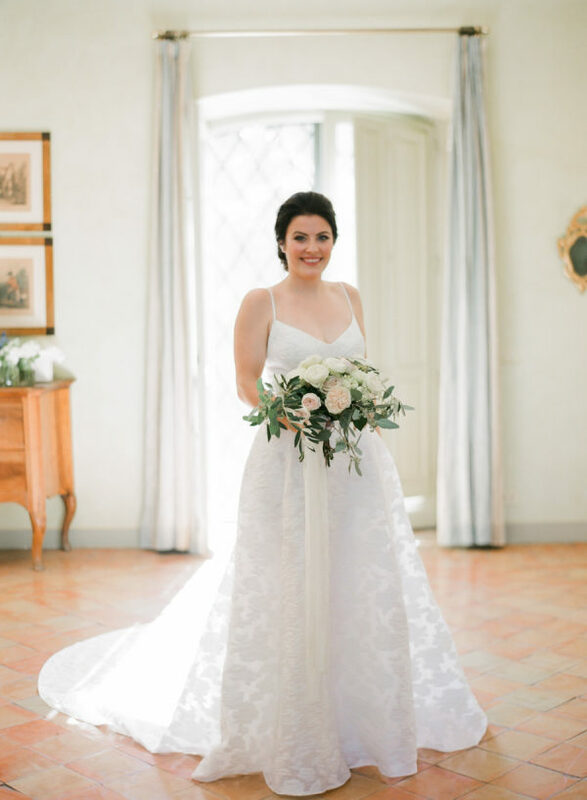 Megan, a fabulous boss lady who runs the successful Lola Saratoga, a luxury fashion accessories boutique in Saratoga Springs, got in touch with me about her destination wedding in Italy I was so thrilled. 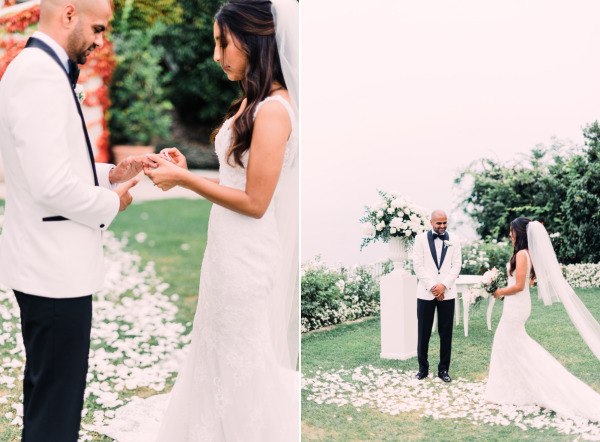 Megan & Charles had a beautiful and intimate celebration and ceremony at the terrace and with the ocean and the mountains as a backdrop. 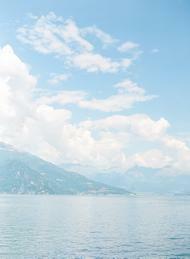 The couple also went for a boat ride before the nuptials, and the scenery from the sea was breathtaking. 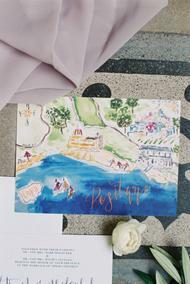 The calligraphy invites, and puppy featured napkins alongside exquisite view over Positano made the reception seriously stunning. 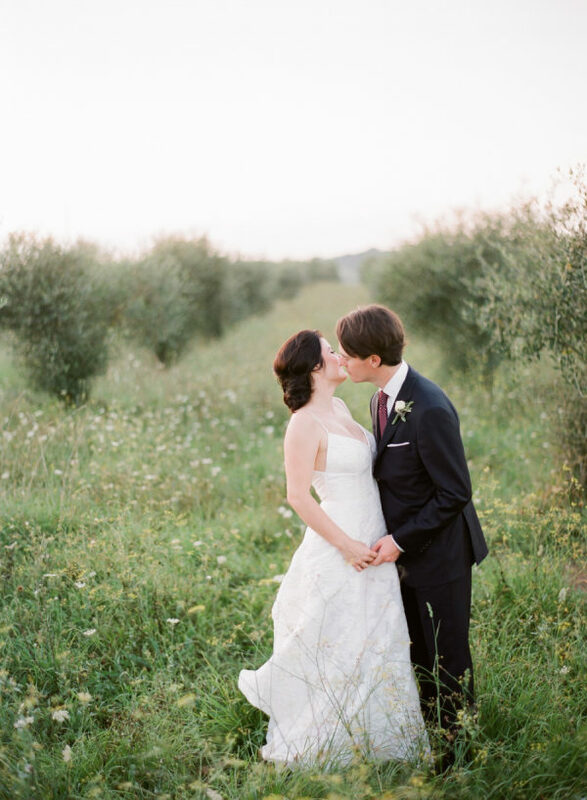 Hoping you’re going to love this intimate destination wedding in Italy! 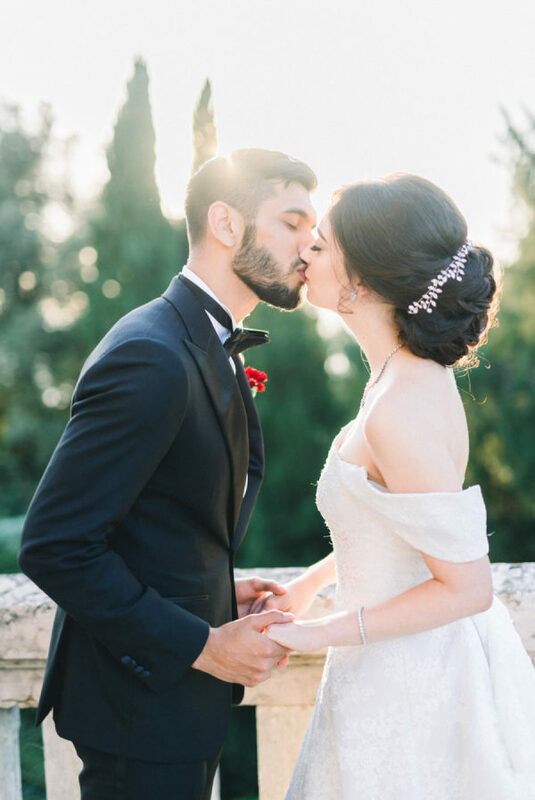 Today we’re sharing a breathtaking wedding in Italy, captured by Peter & Veronika, that combines Italian and Jewish cultures and elegant style with a bit of fun. 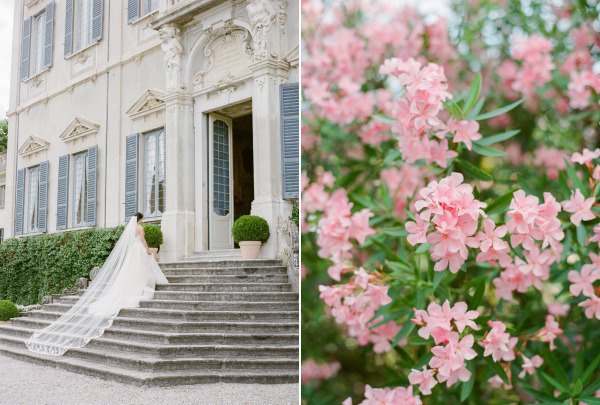 Their venue, Villa Arconati is the definition of a fairytale. 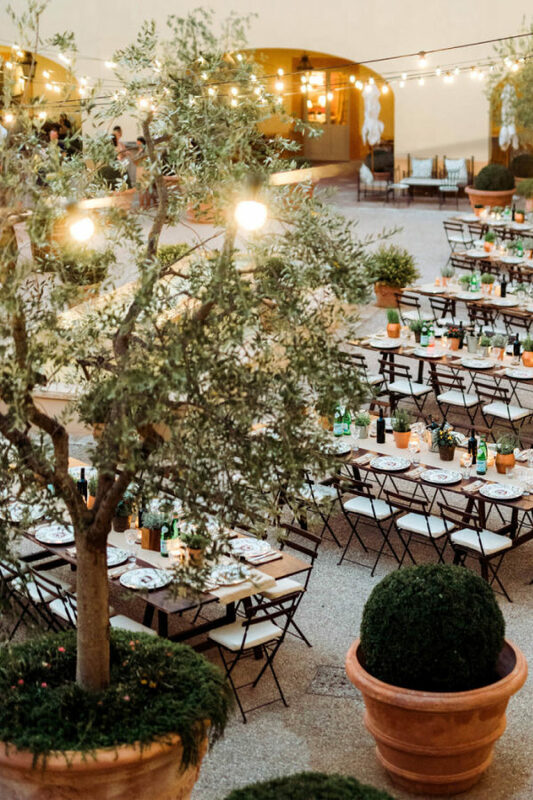 Guests dined al fresco under a canopy of string lights at round tables decorated with elegant centerpieces from Valerio Grassi. The bride looked flawless in her beaded Atelier Pronovias gown. 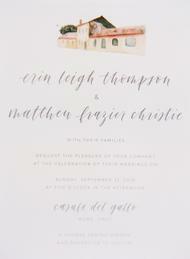 It’s safe to say White Emotion thought of absolutely everything when planning this dream of a wedding day! 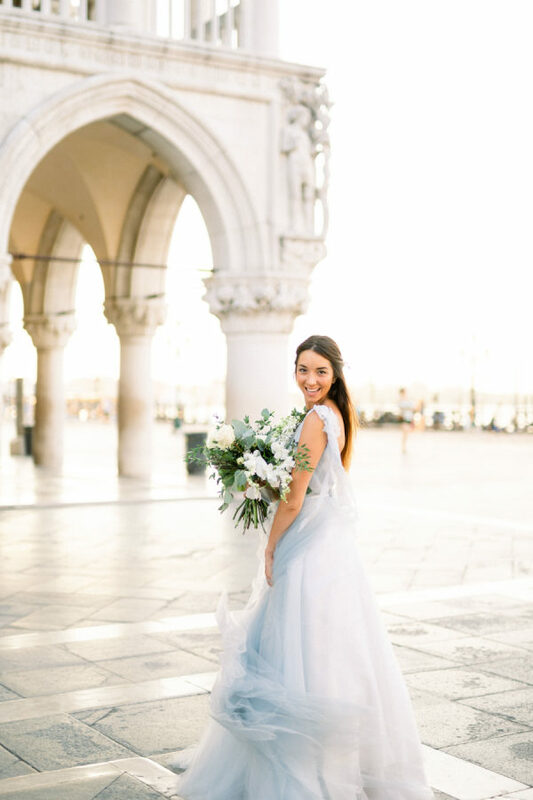 From The Bride… When we began to plan our wedding, we set out to create something fun and inclusive for everyone – my American family, his (Northern and Southern) Italian family and friends, as well as our many international friends from Milan and around the world. 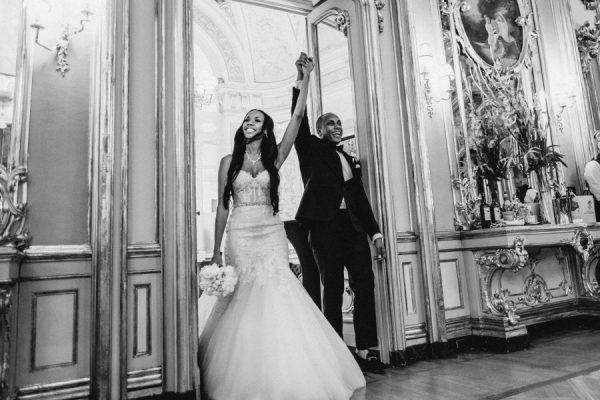 We considered this important moment an opportunity not just to celebrate our love, but also introduce the most important people in our lives to our cultures. Living in Milan for the past five years (and Alex since birth! 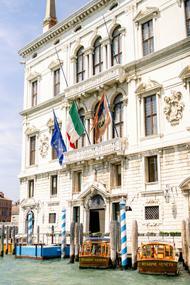 ), we wanted to share an authentic, yet magical, Milanese experience. 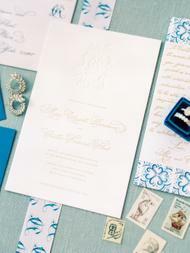 The style we hoped to reflect was elegant and refined with a bit of fun thrown in. 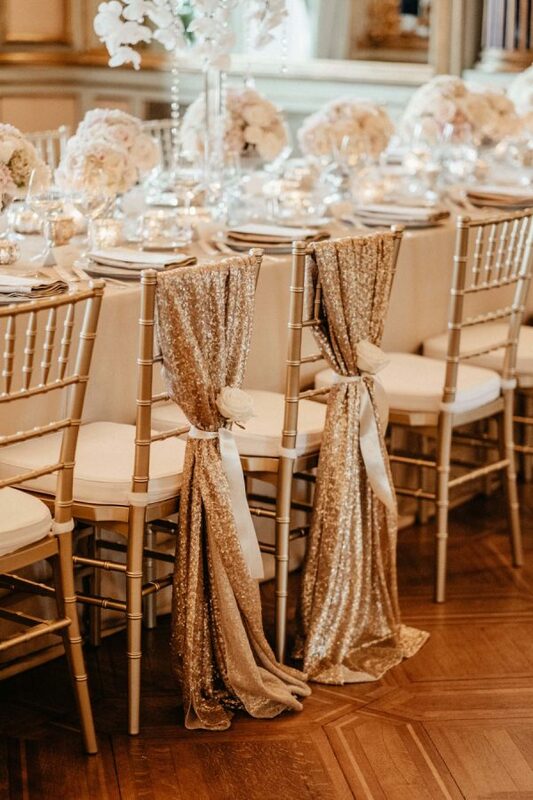 Our venue had all of this and so much more. Villa Arconati is a foundation and museum still under restoration. Part of its appeal is that it is not perfect, shiny, and new, but rather takes you back to a different era and is filled with history. 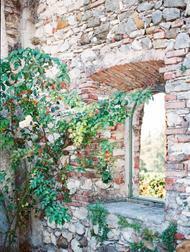 Its gardens are immense, and there are countless indoor and outdoor spaces. 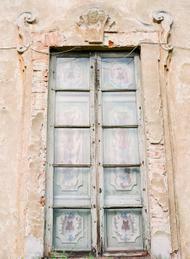 During our first site visit, I found myself taking photos non-stop of all the details and painted interiors. 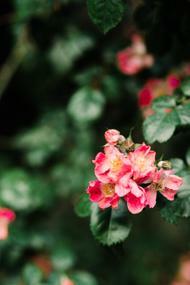 These photos (taken with my phone!) I later integrated into the printed materials that I designed, with Alex’s consulting and help, along with dictionary-style translations of titles for each piece. 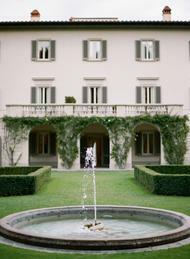 The museum provided English and Italian guided tours so our guests could discover the history behind this enchanting estate. 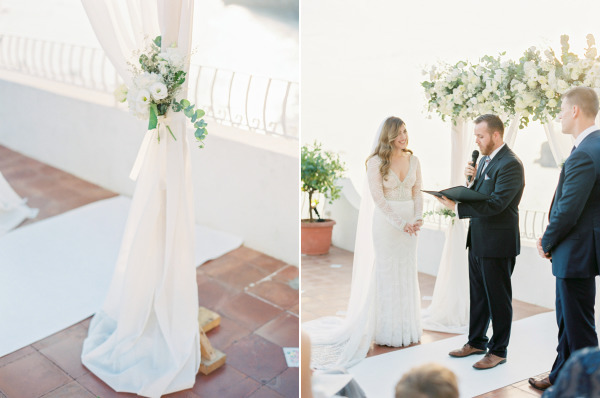 Our dear friend Davide was our officiant, along with help from the wonderful Cantor Evan Kent. Our friend’s participation in the wedding began as a joke over beers. 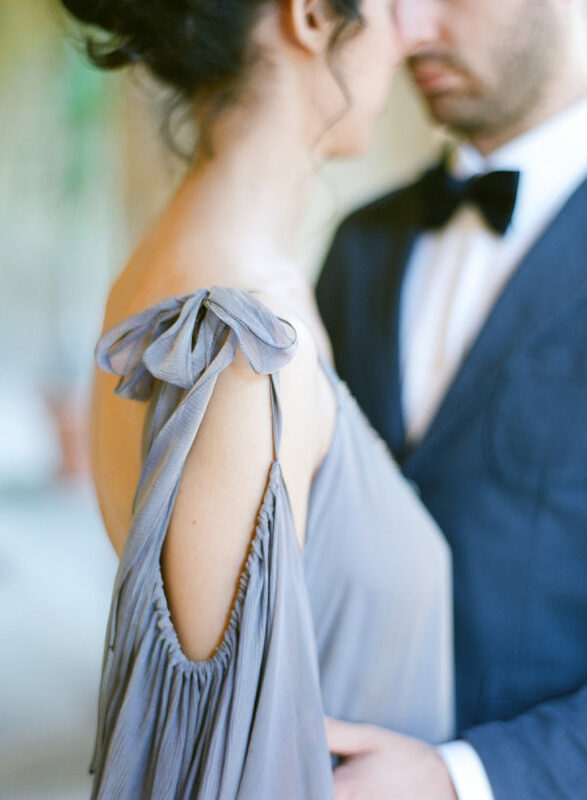 Soon after Alex and I got engaged, one night I told Davide he spoke English better than any other Italian I know, and he replied suggesting that he should marry us because he could speak to all our guests. 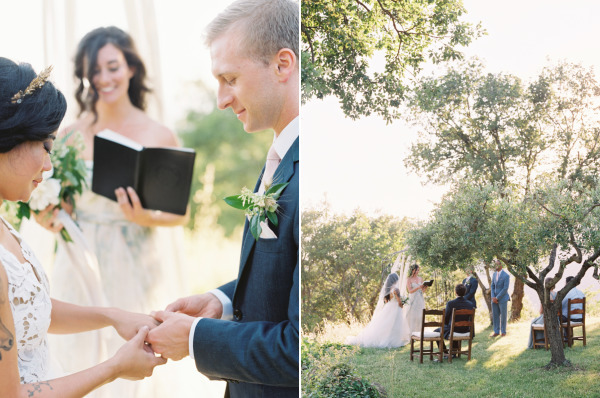 At the time we laughed it off, but later on we decided it was a wonderful way to have a multilingual ceremony. 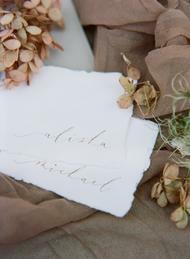 We used the details of the day to integrate our cultures, as well as remind us of our loved ones. 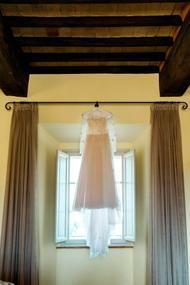 The chuppah was my grandfather’s tallit. 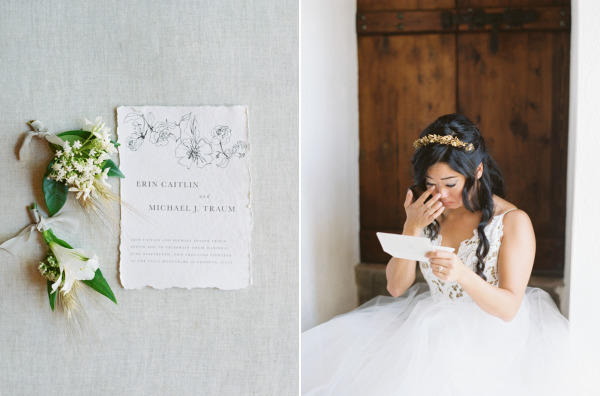 We read our vows in each other’s native language. During the dinner Alex’s groomsmen took part in the old Italian custom of cutting up his tie as souvenirs. 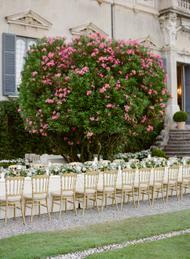 We then danced the Hora, or, as our Italian friends called it “il ballo con le sedie” (the chair dance). 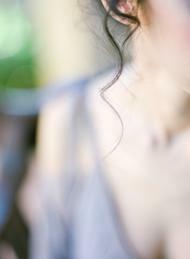 I borrowed my earrings from Pérola, the jewelry line of a close friend unable to travel to Italy. 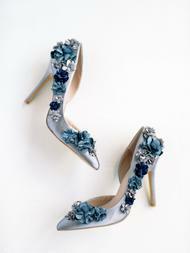 I got my dream shoes via a friend working on the shoe design team at Prada. 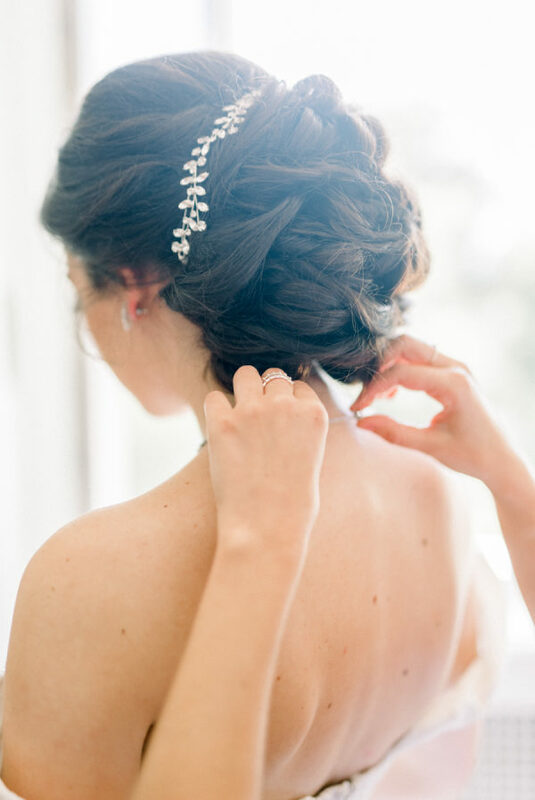 A week or so before the wedding I still hadn’t figured out my hair accessories, and a bridesmaid came to the rescue – the beautiful hair comb was custom made by Vera Wang for her wedding on the same day 6 years earlier. She actually never wore it, but it matched my look perfectly! 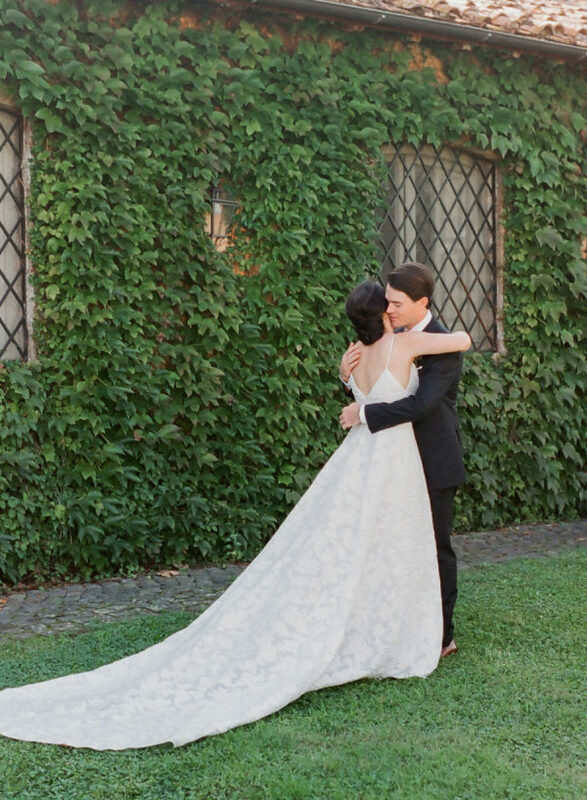 After visiting an embarrassing number of bridal salons in which I said I didn’t want tons of lace, clouds of tulle or beading, I finally went to the Milan flagship store of Pronovias and ended up with exactly that. The saleswoman insisted she had “my dress” and that it was not any of the dresses I showed to her at the beginning of the appointment. 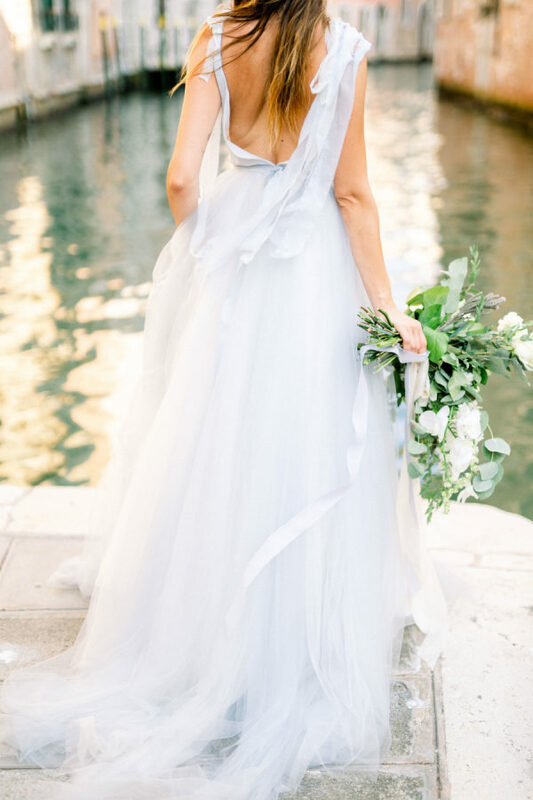 I never thought I would “just know” when I had “the dress,” but she knew it! 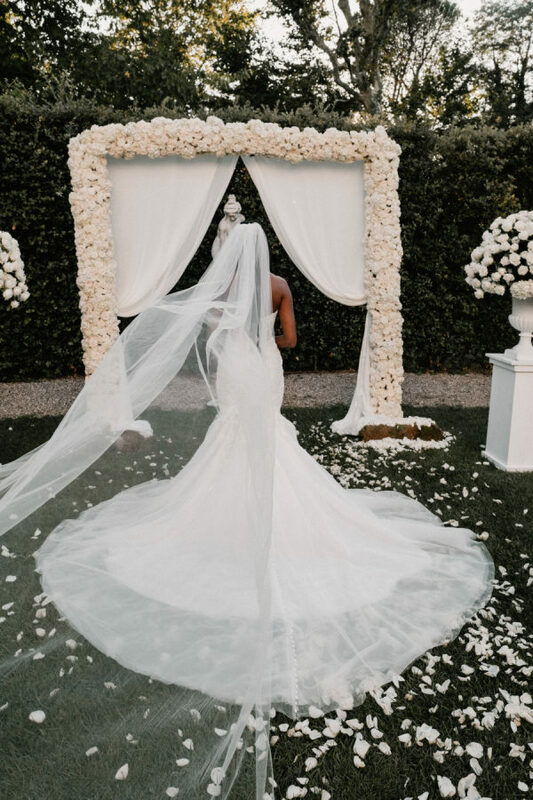 I fell in love with an unusual style from Atelier Pronovias that seemed to have a little bit of everything I had on my no list–a mermaid lace silhouette and a tulle, beaded overskirt and long tulle “wings” that provided just enough drama for our outdoor ceremony. 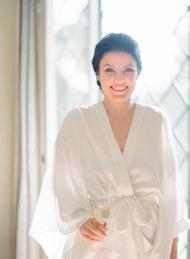 Our planner Alessia Santa from White Emotion is nothing less of a force of nature. 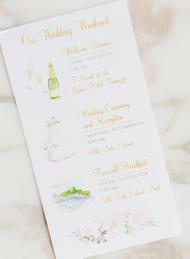 She pulled together a dream event in just 2 months after we unfortunately had to let go our initial planner. Alessia knew so much about how to make every minute of the event flow smoothly, as well as how to mix our multi-cultural backgrounds. This dress. 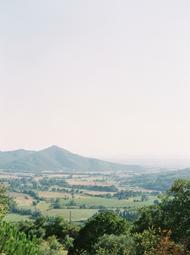 The view. A castle!… oh my. I’m really not sure where to begin with this beautiful celebration of love. It’s elegant, yet casual and intimate, yet collected. 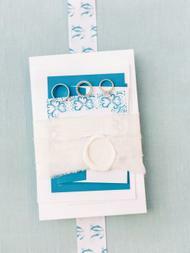 For this Bride & Groom (who happened to meet in an airport! ), that combination feels just about right. 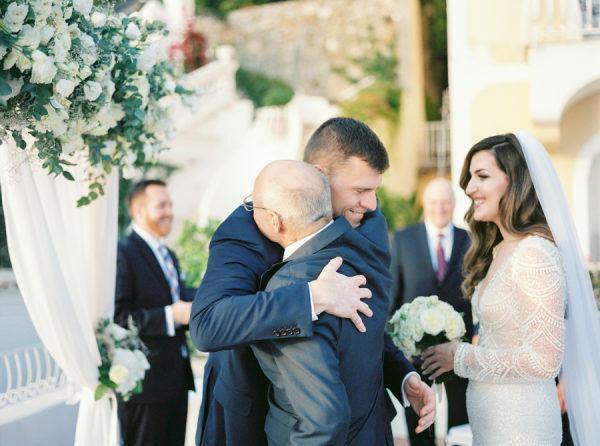 They decided on a gathering in Italy, where they could truly join their families and loved ones and with the help of Brenda Babcock Celebrations, the result was just that and so much more. 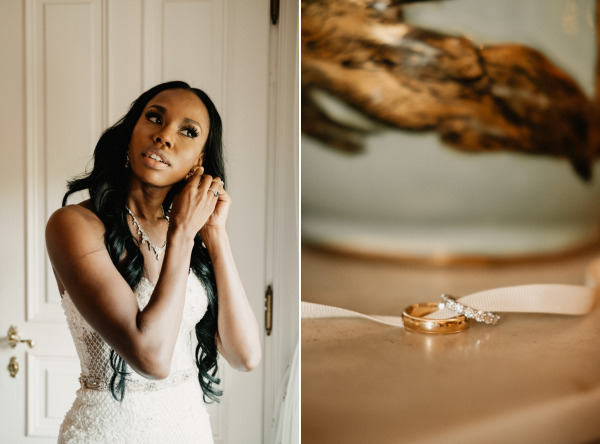 Emm and Clau were in attendance to document every moment, which I have no doubt will spark inspiration for your own Big Day. 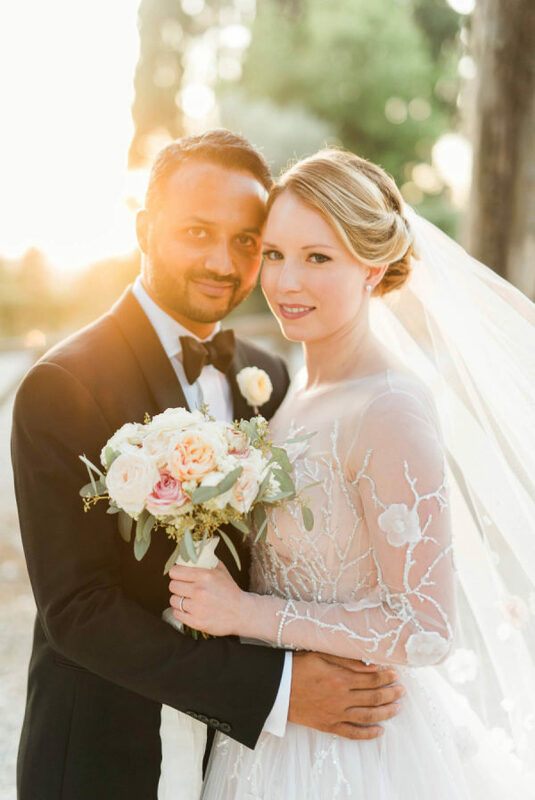 From the bride… We met when Saumil was visiting Vancouver for business, and on his way home he was waiting for his flight at a bar in the Vancouver airport. I happened to be seated next to him and we struck up a conversation. 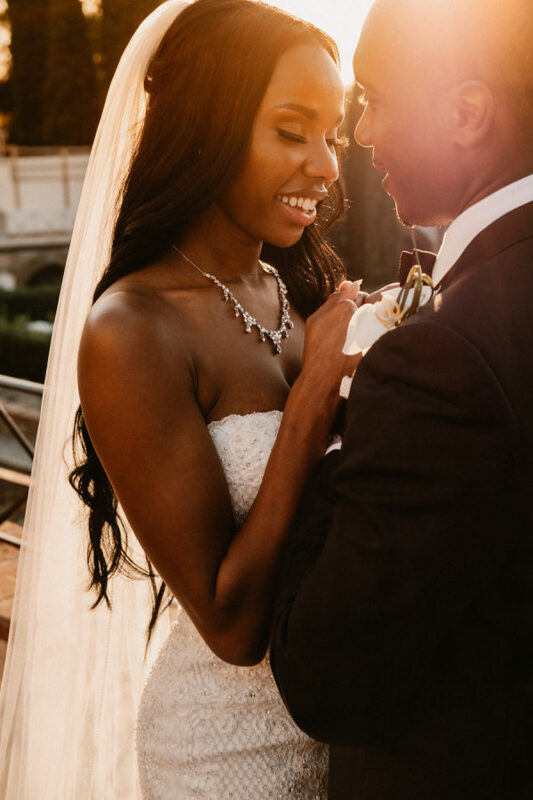 Even though we exchanged phone numbers before going our separate ways, I didn’t think anything would come of it knowing that we lived in different countries. We kept in touch, and months later I happened to be visiting Palm Springs, California on a holiday. Knowing that Saumil lived only a couple hours’ drive from there, I told Saumil I was going to be visiting, and Saumil drove to Palm Springs to take me on our first date. We hit it off right away, and Saumil ended up taking me on our second date the very next day! 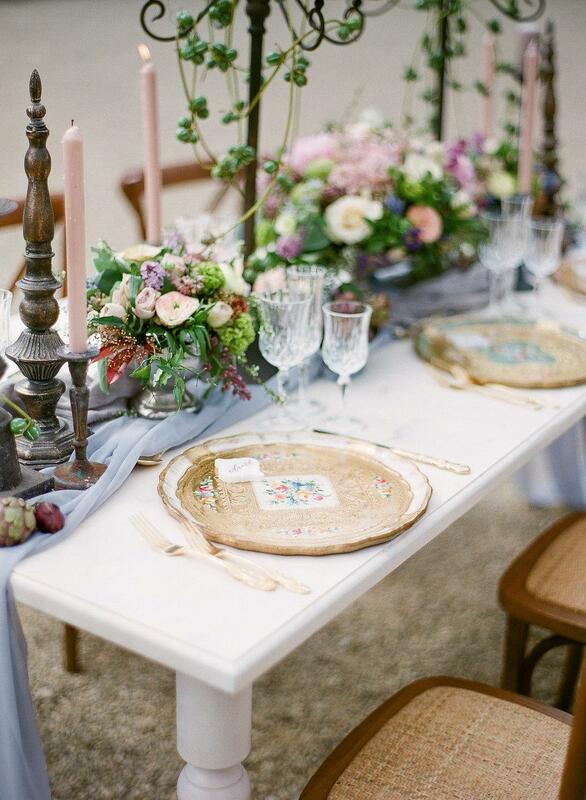 We wanted our wedding celebration to be an intimate gathering of our families and closest friends. Our guests would be traveling from Canada (my home), the U.S. (Saumil’s current home), and India (where Saumil grew up). 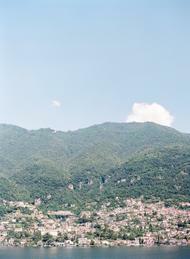 Italy, being centrally located between all those places was a big plus. I also happen to be half-Italian. 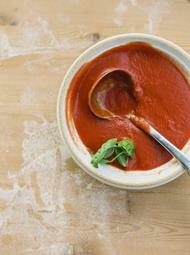 My mother’s parents were both born in Italy and Italian traditions have played a big part in my life. 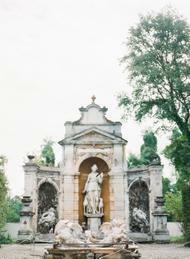 Saumil also felt that Italy’s family-oriented traditions were very similar to those he grew up with in India. 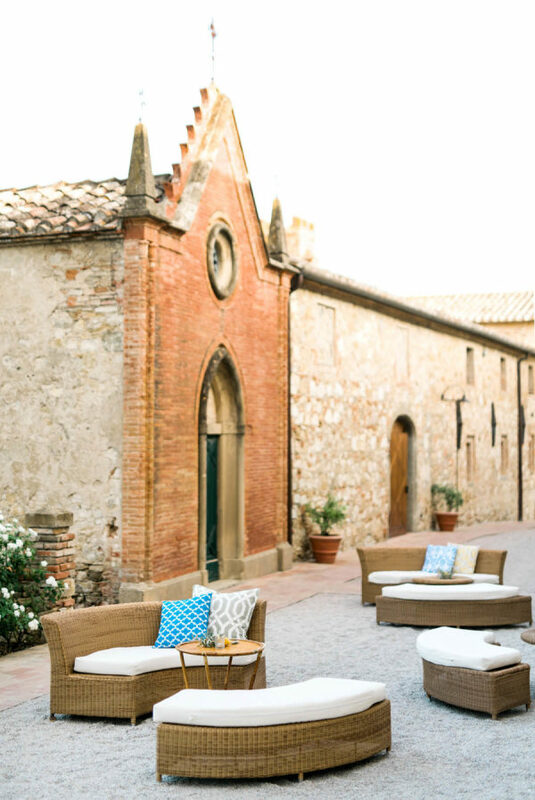 Knowing Italy’s reputation for hospitality and gastronomy, we thought it we would be the perfect place for our wedding celebration. 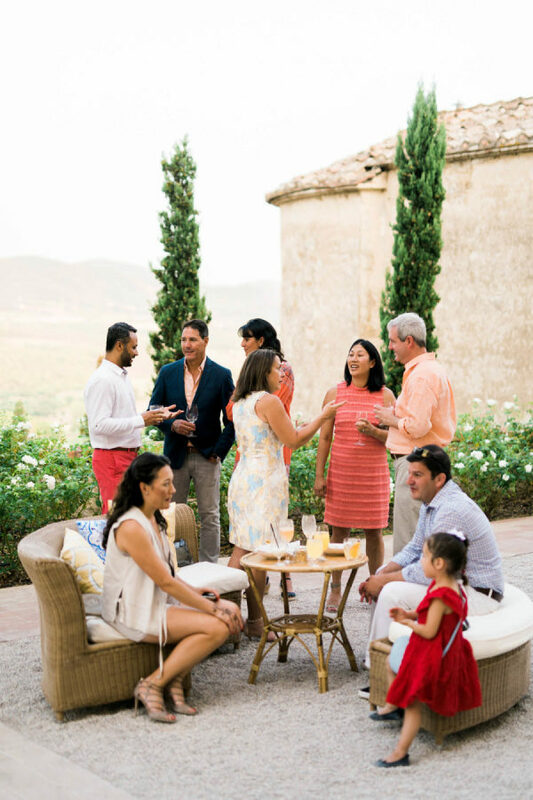 Since Saumil and I had grown up and lived in different countries for most of our lives, our families and friends did not know each other very well and so the idea of an intimate gathering was most important to us. 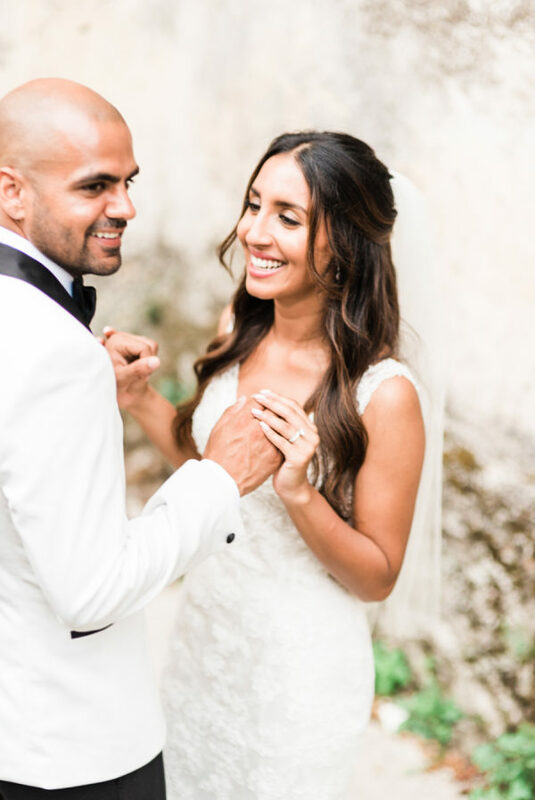 We felt that a traditional one day celebration would not allow our our guests enough time to get to know each other, and so we decided to have our wedding celebration over three days with everyone staying on location together. 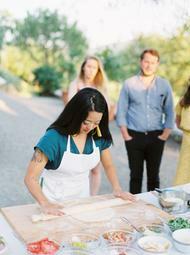 Finally, we wanted Italian traditions and activities to be a big part of our celebration. 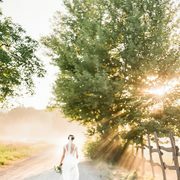 Once we picked our location, we communicated our broad ideas and desires to Brenda Babcock, our wedding planner, and gave her a lot of freedom to work on all the details. Both Saumil and I felt that we would enjoy our wedding more if we knew less about every single detail. 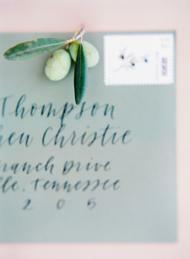 We wanted our celebration to be as much of a surprise to us as it would be to our guests. We were extremely lucky to find someone like Brenda and her team who really embraced this idea and executed it flawlessly. Brenda really took all the stress away from us, and she made sure she understood our likes and dislikes during the planning process. 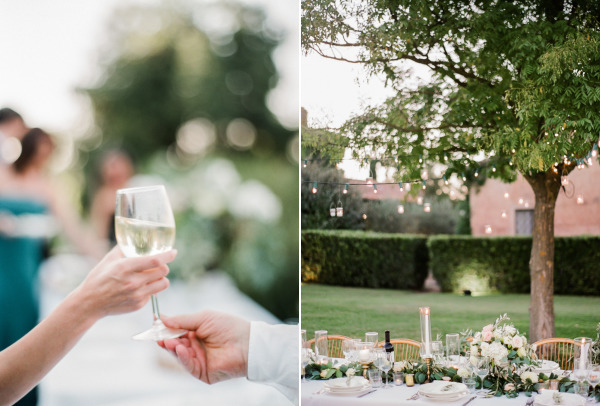 Brenda was able to transform our broad ideas and desires into a celebration planned to the smallest detail, which included three very different yet very Italian dinners; a day full of Italian activities, such as a bocce tournament, pasta making class, and wine tasting; and finally a romantic yet modern wedding. 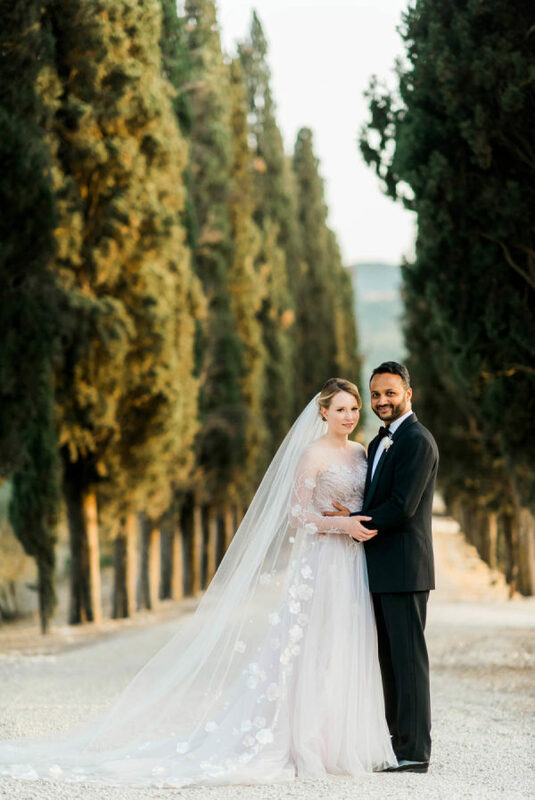 At the end, Saumil and I really felt like guests at our own wedding, totally relaxed and excited by all the surprises Brenda had planned for us. 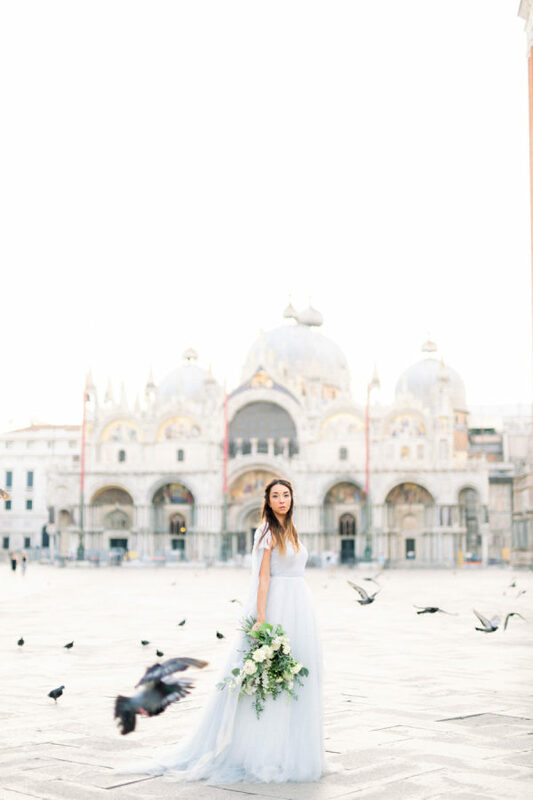 If there were to be a top five list of places to elope, Venice would be a must. 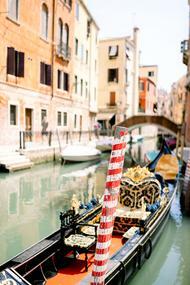 Tell me, what is more romantic than intimate I dos followed by a gondola ride and a dinner date overlooking the canals? 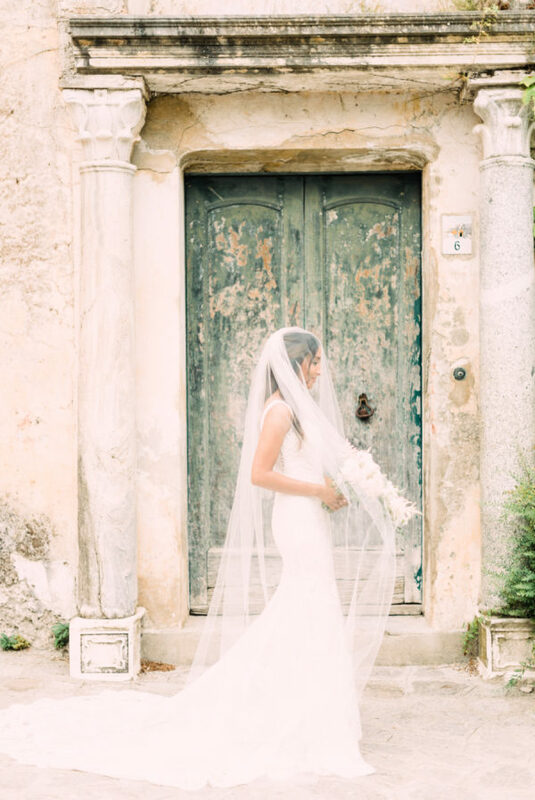 And when you throw a Silvia Valli wedding dress into the mix, said elopement becomes next level. 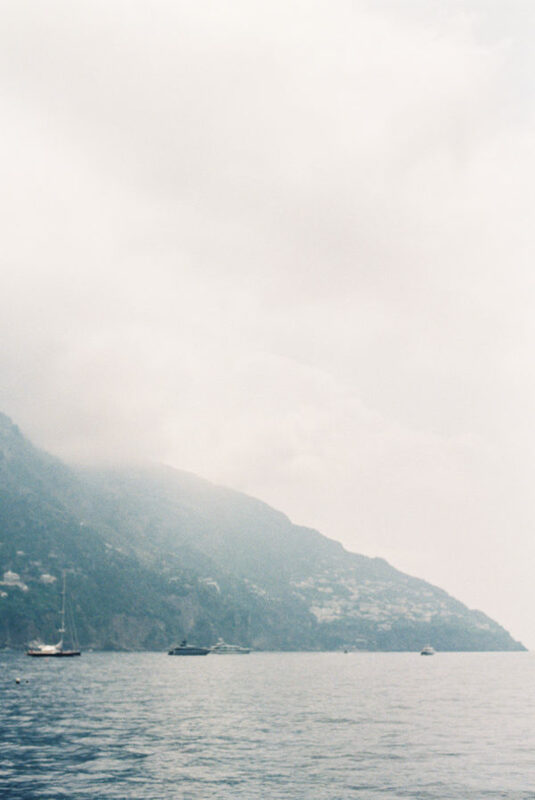 Hunter Ryan tells the intimate, inspiration story with the dreamy images below. From Hunter Ryan Photo… Venice. 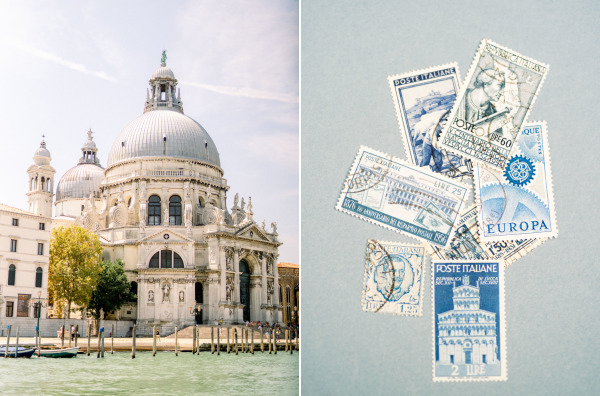 Known for it’s regal grandeur & in rich jewel tones—Italian-American planner Ema Giangreco wanted to showcase a softer side of Venice. 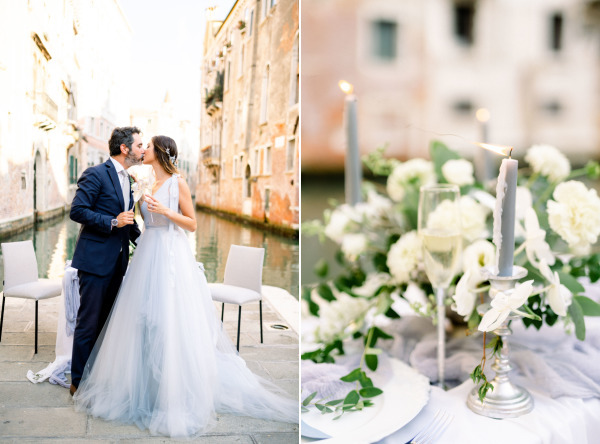 Living and planning weddings in Venice for years, she’s seen many deep reds, golds, emeralds and blues in Venetian wedding design, so we opted for a completely different vibe for our couple. 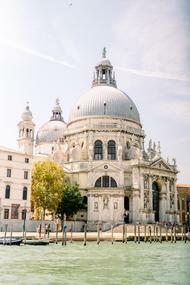 The color palette was derived from the famous Saint Marks Basilica in San Marco Piazza. 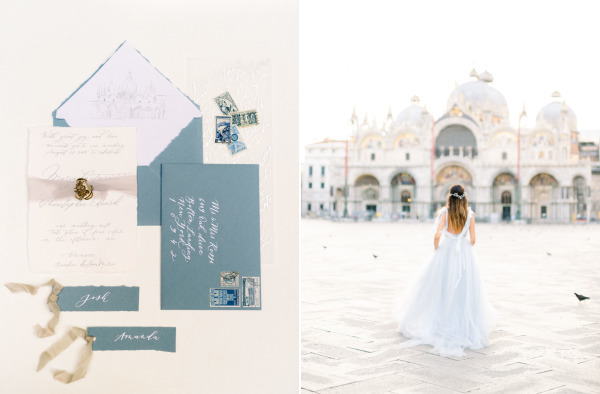 The domes of soft blue hues with gold gilding, the building walls—soft greys and creams. 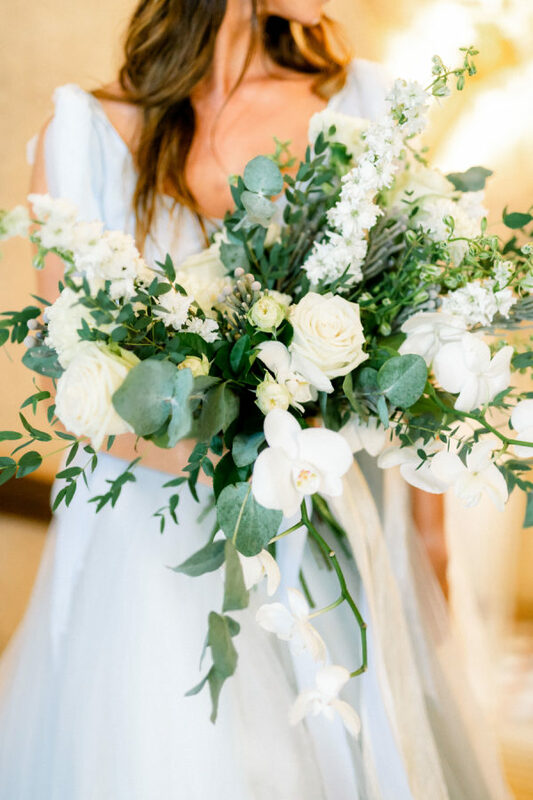 The florals were clean and simple whites and greenery, with an unexpected modern touch of white orchids. 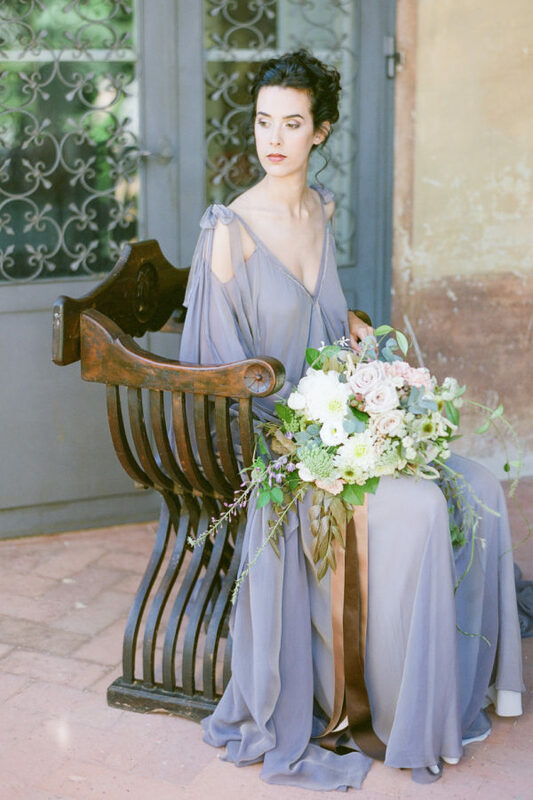 Custom gown designer Silvia Valli created a one of a kind gown for the bride with hints of dove grey and muted blue tones in a soft ethereal vibe. 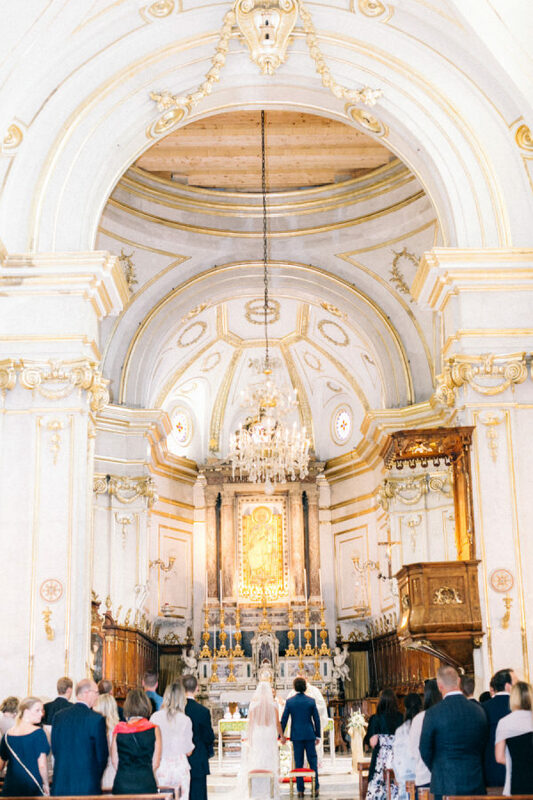 A perfect juxtaposition of the grand church where the heavily candle-laden ceremony took place. 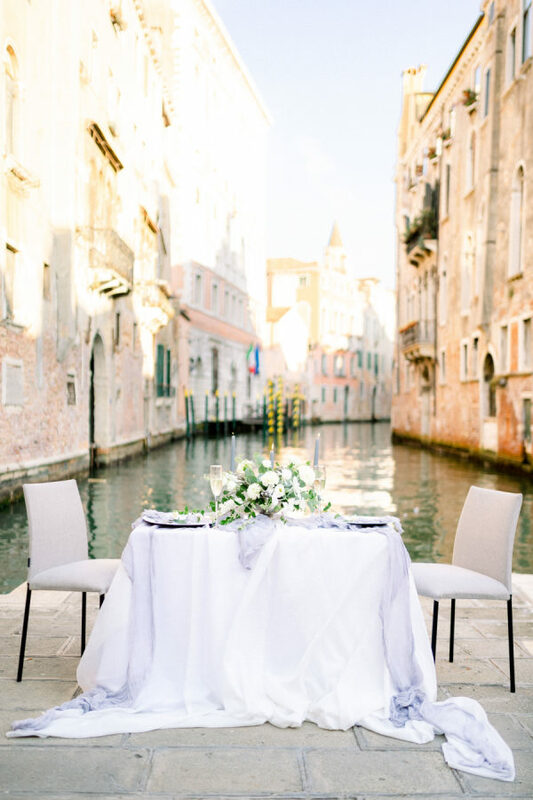 Just a short distance from the church the couple walked the back canals of Venice to their reception location, an intimate space set for two at the Palazzo Morosini, canal front. 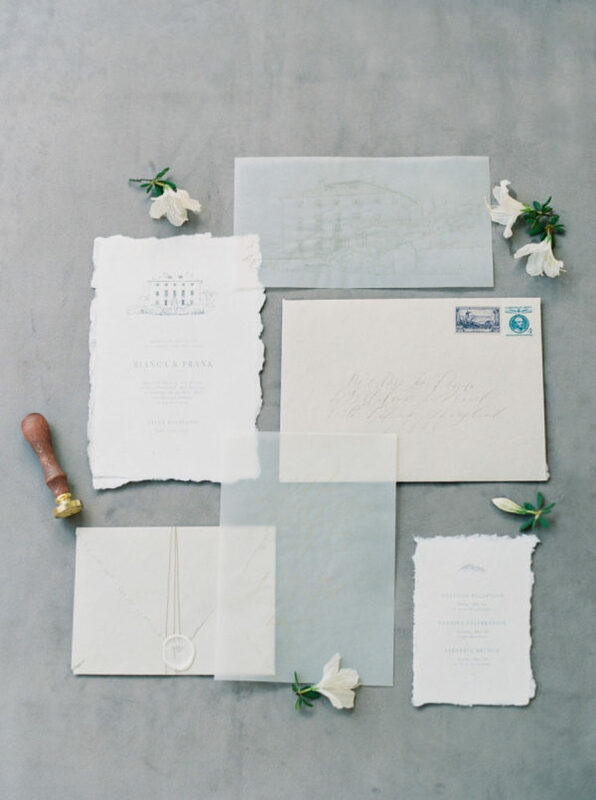 The soft design carried through to the table—again boasting soft greys and blues—punctuated with simple white florals and greenery. 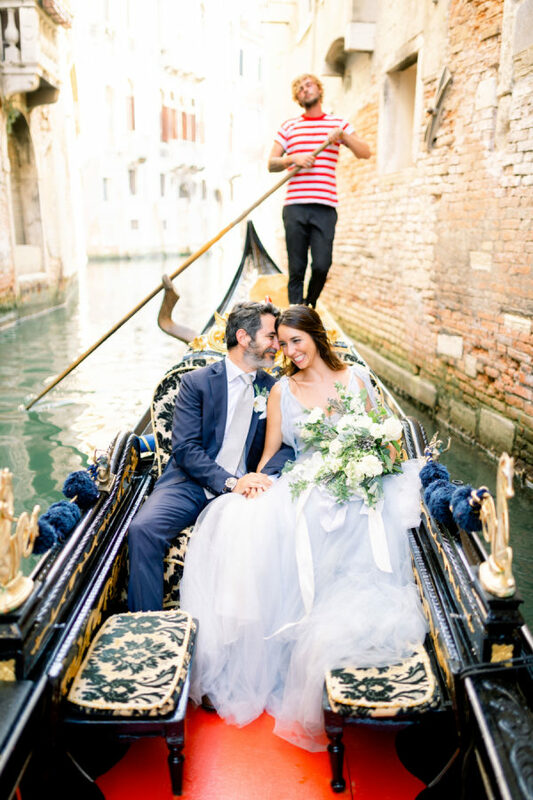 The couple departed their reception in a quintessential Venetian gondola for two. I’m officially convinced. 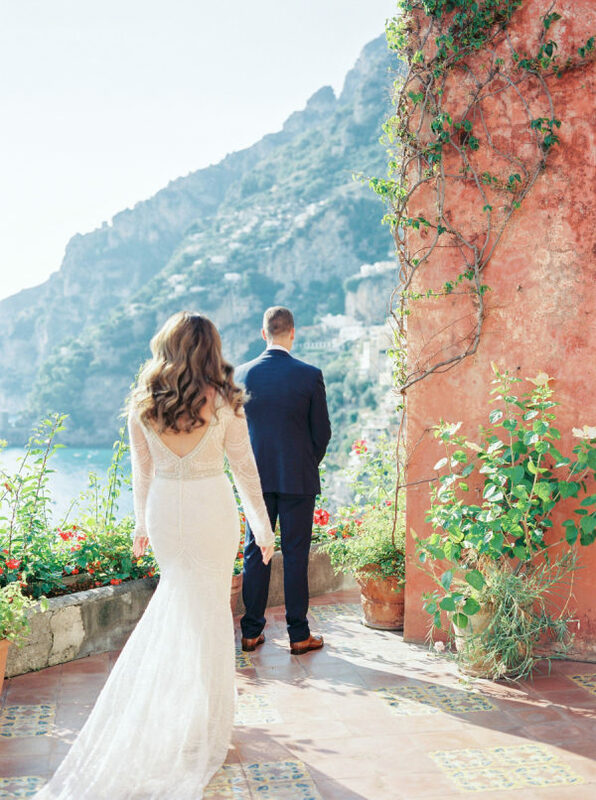 The Amalfi Coast is the dreamiest place ever to say I do—and Belmond Hotel Caruso is hands down one of the most charming backdrops to do it. No, this isn’t #sponsored my friends… this is just me having a straight up major venue crush moment. 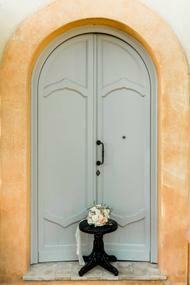 To make it all the more romantic, today’s gorgeous couple decided to elope here before their traditional Indian wedding at home. 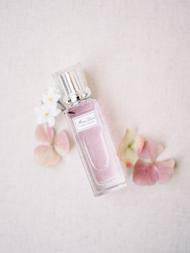 Lace & Luce joined to capture every step of the way and I have a feeling you’ll be spending a little extra time with this one. 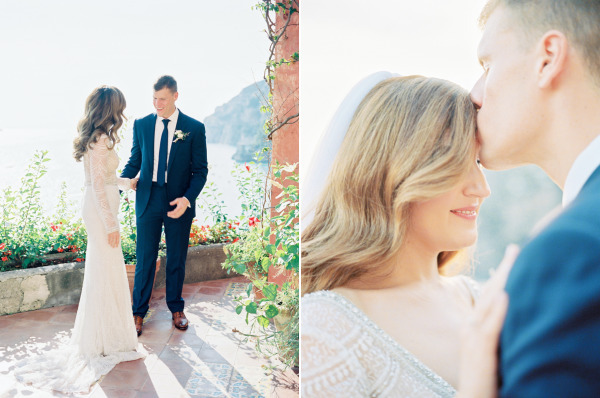 From Lace & Luce… Being based on the Amalfi Coast I absolutely love photographing elopements, there is something so romantic to me about having something special, that is just for the two of you. 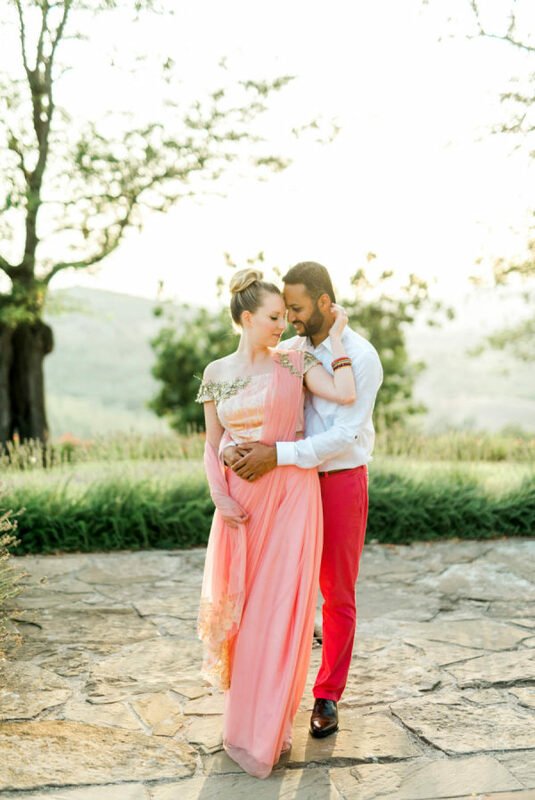 It is even more exciting when the couple doesn’t tell anyone they are eloping and wait to surprise everyone with photos from their Italian elopement at their traditional Indian wedding when they return home. 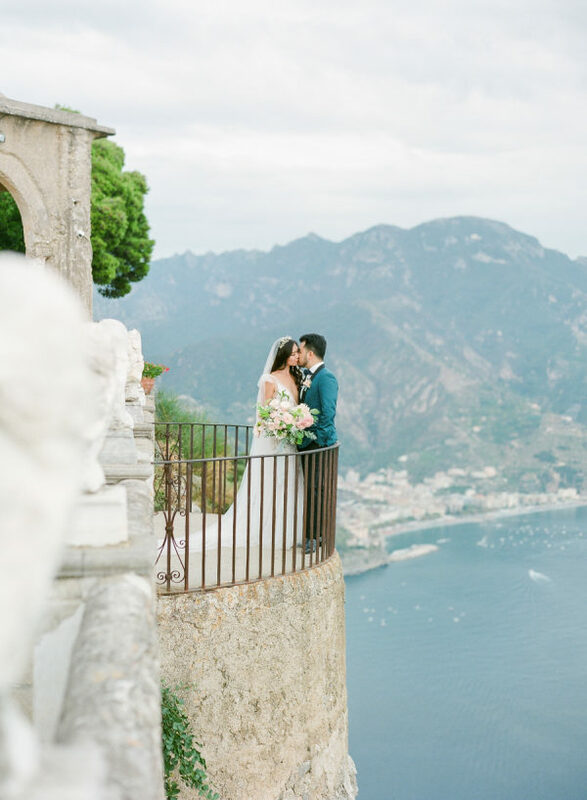 My favourite location for elopements is definitely Ravello, being there, up in the clouds feels surreal, a literal dream. 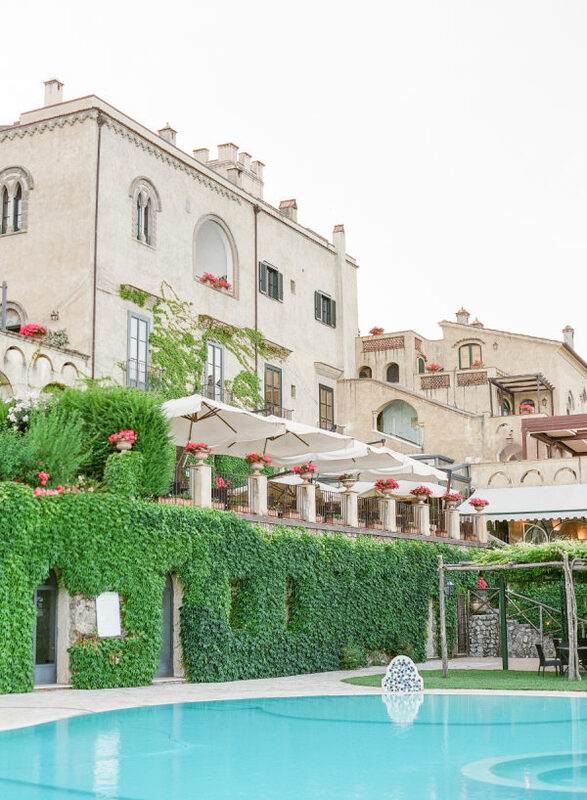 This couple had their entire day at the Belmond Caruso, from getting ready in their upgraded suite (Thanks to the hotel), to their private dinner on the terrace. 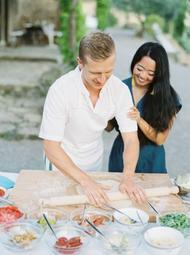 They were the first couple to have the “Chef’s table” for their elopement, it is a tiny little terrace with the most beautiful view. 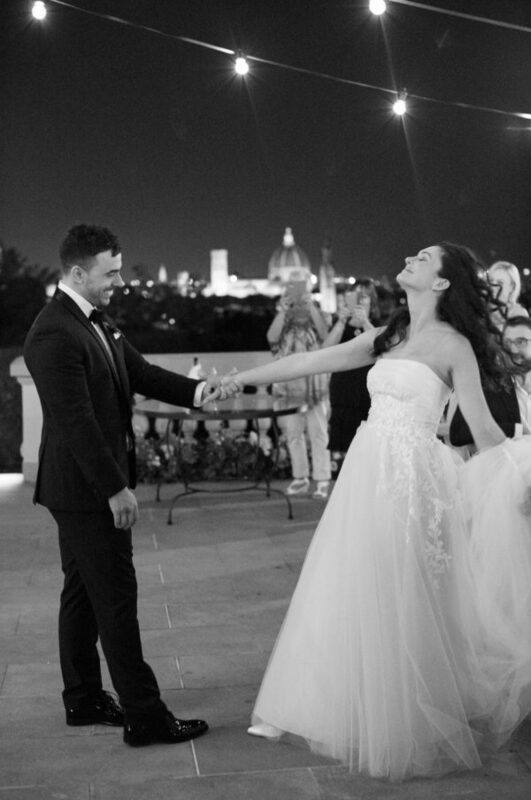 The perfect end to their fairytale day. 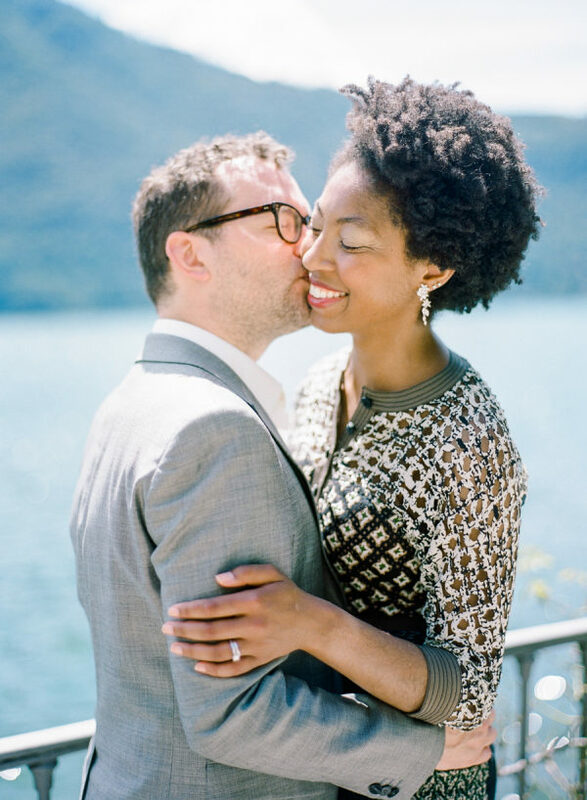 When Ishra contacted me about eloping we managed to organize her dream elopement quickly in about a month. 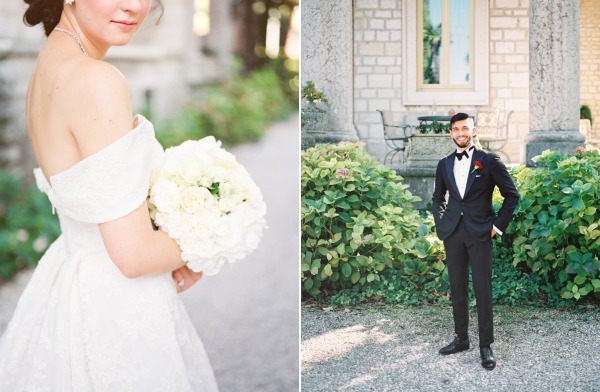 They wanted something special, for just the two of them before have their big traditional Indian wedding back at home in Vancouver. 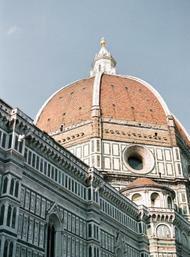 Renaissance … it is not just a person, place or period in time. It IS a feeling from deep down inside that inspires passion and timeless emotion. 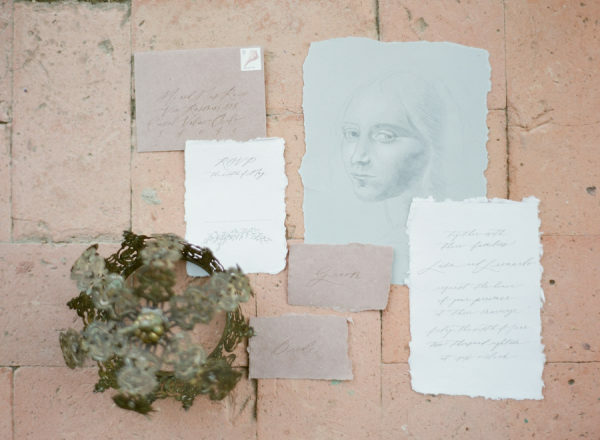 And this styled shoot IS a true testament to that period in time, to Italy and to the Master of artistic expression, Leonardo da Vinci. 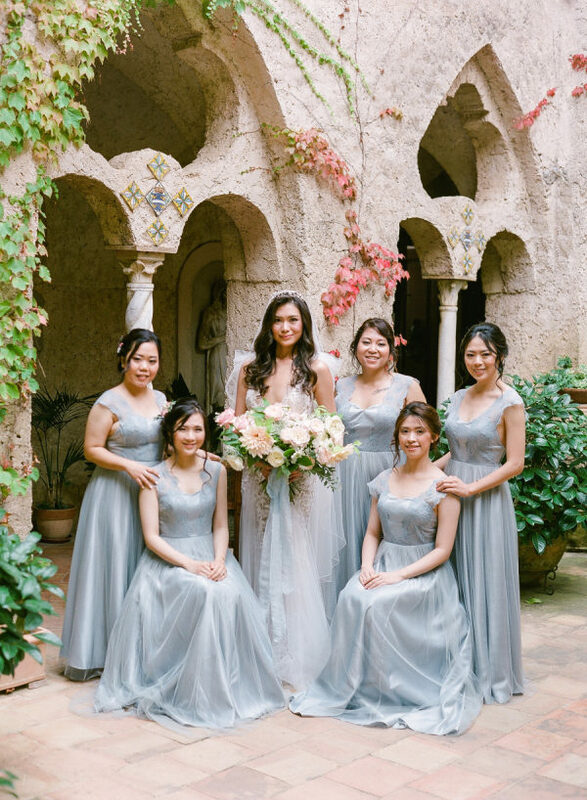 The Italian wedding dream team who came together to inspire (chiara, anna, the ladies of jardin divers, giulia, carol and esther) built on the artistic essence of the Renaissance aesthetic… romance, art, symmetry, perspective and space to inspire in a classic, yet innovative manner. 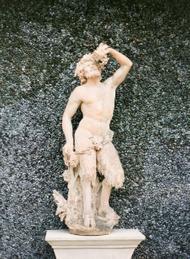 All who are in search of the rebirth of romance ~ read on! 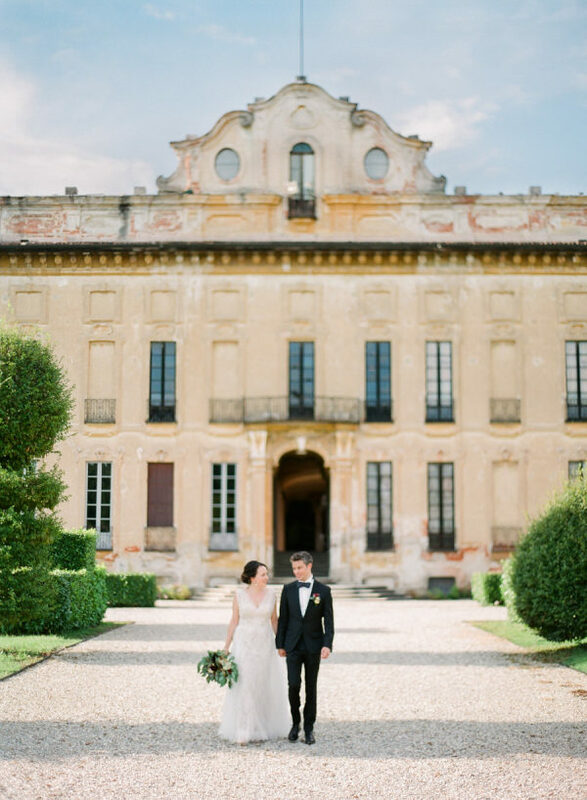 An elegant Renaissance Italian villa, Villa di Striano, set in the heart of Tuscany is a breathtaking location for a wedding. 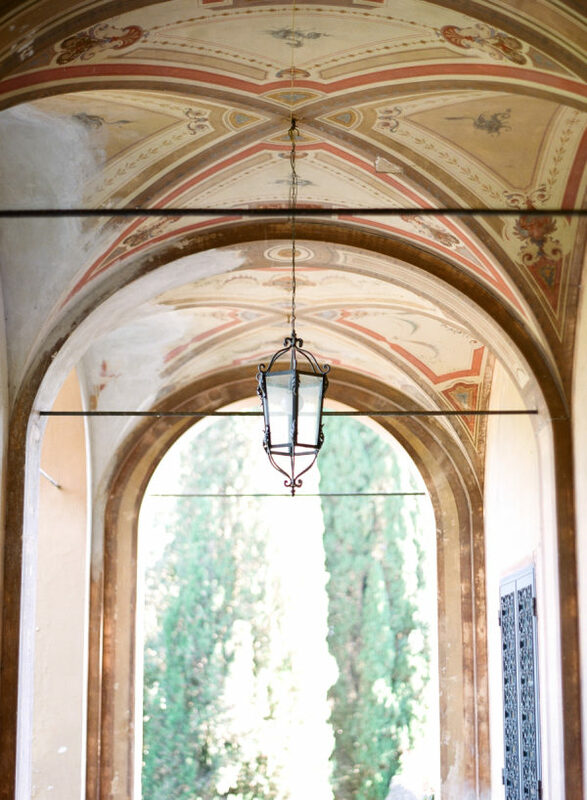 It is a perfect venue for our Leonardo da Vinci-themed wedding photo shoot. 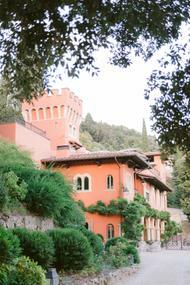 Its majestic ochre walls stand out against the beautiful woods and hills of Mugello area. 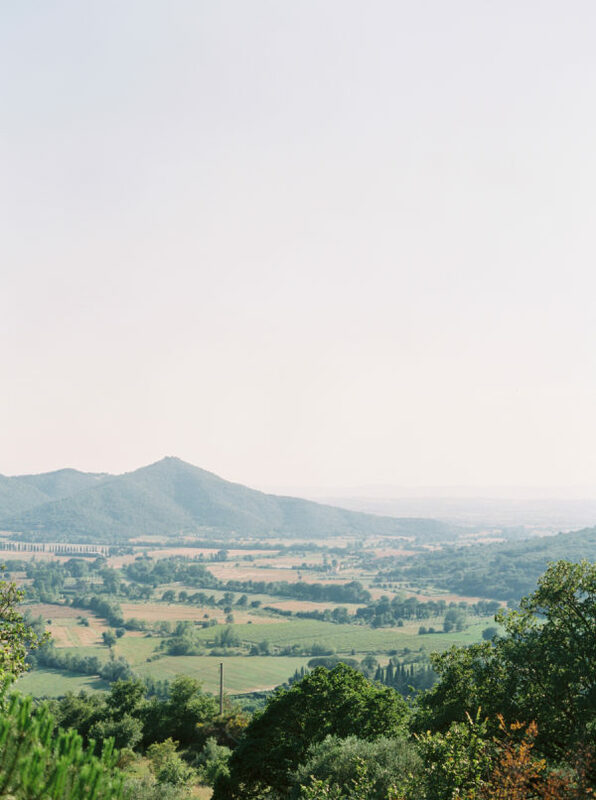 Throughout centuries many famous artists, doctors and writers have visited Striano to embrace and enjoy it’s quietness and peace among the lush Tuscan hills. 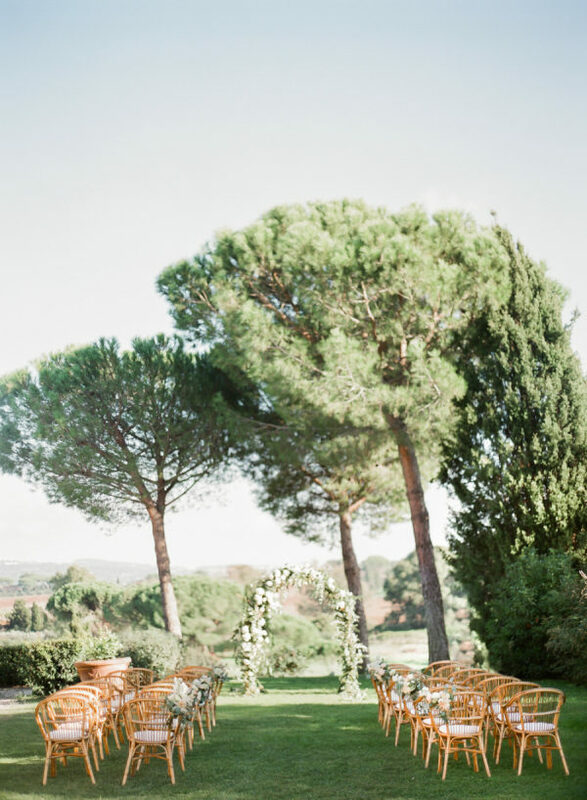 Its gorgeous fresco ceilings, balconies, and elegant landscaping and gardens around the property brings a true authentic Tuscan wedding experience. 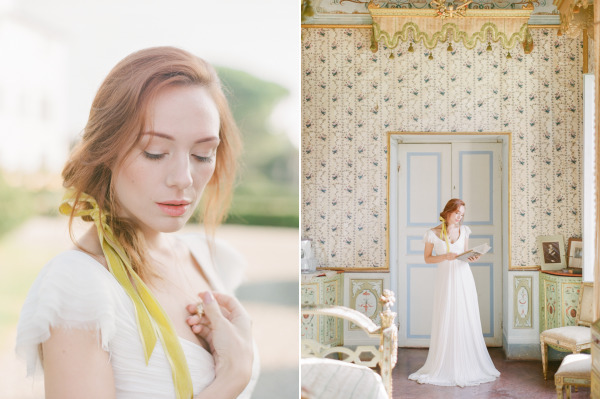 This ancient villa is full of charm and mystery, which inspired us to design the photo shoot with a challenging main theme of Leonardo da Vinci. 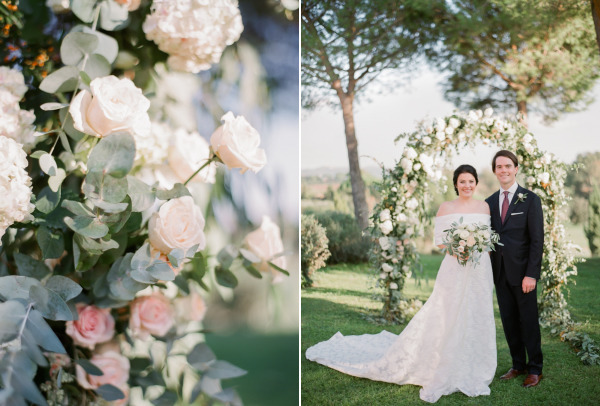 The wedding inspiration was beautifully put together by a Fine Art stylist, Chiara, of Weddings in Tuscany, and her team. 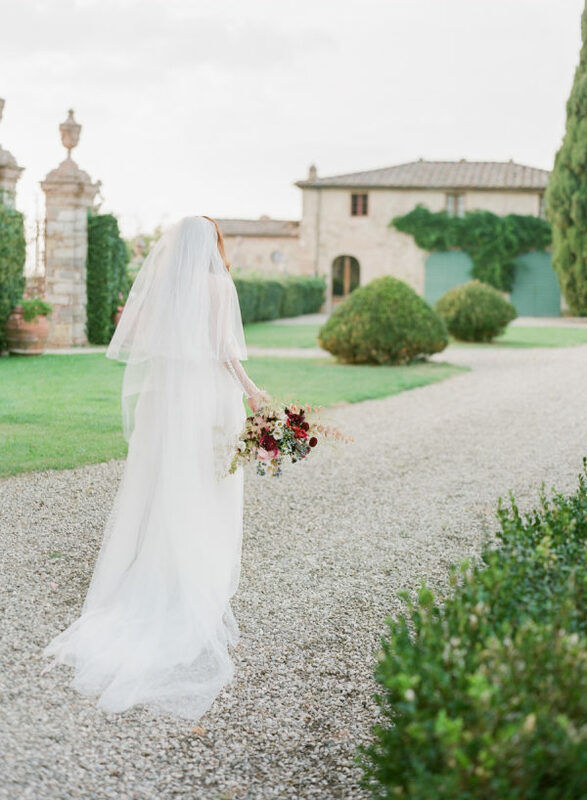 Being born and raised in the gorgeous Tuscan region, which is also native to Leonardo da Vinci, Chiara drew the inspiration from the culture so dear to her. 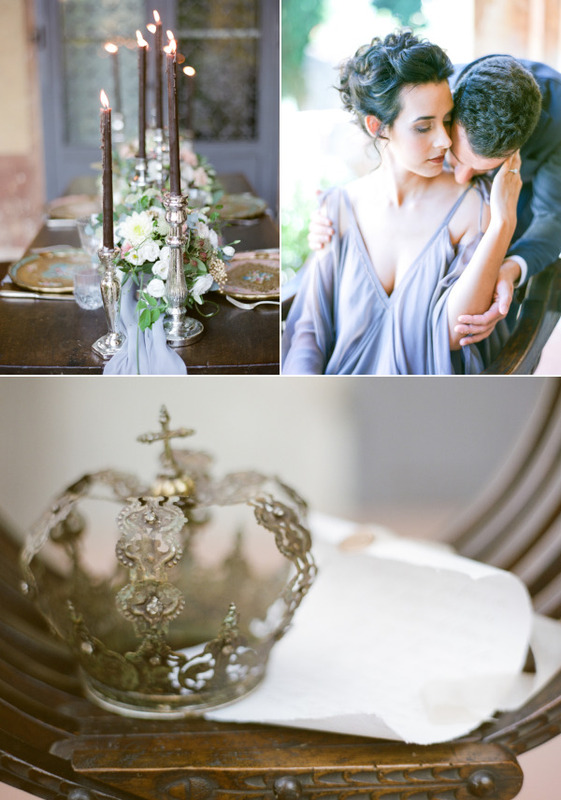 Chiara chose to incorporate beautiful Florentine decor to portray the real authentic Italian Renaissance experience. 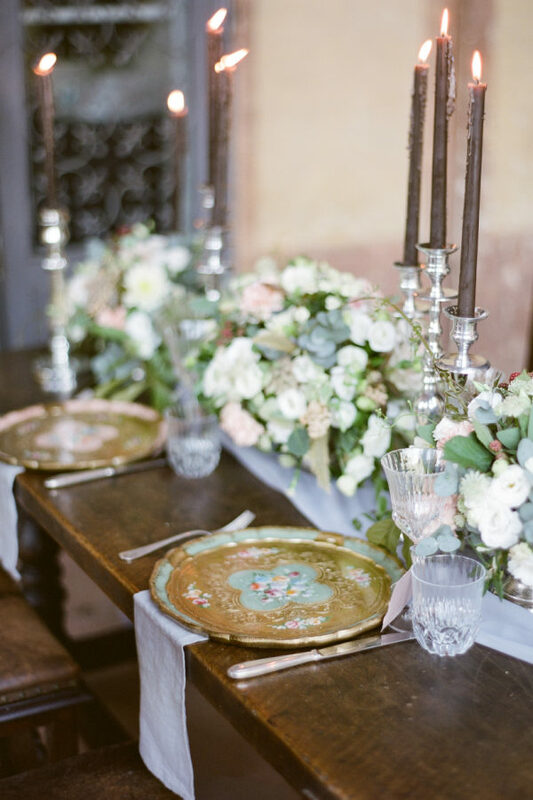 Stunning wooden Florentine trays with golden details adorned the reception table set up. 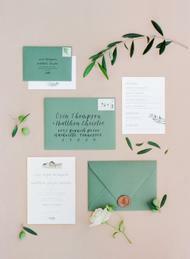 Chiara paid attention to the smallest details while planning the design of the photo shoot. 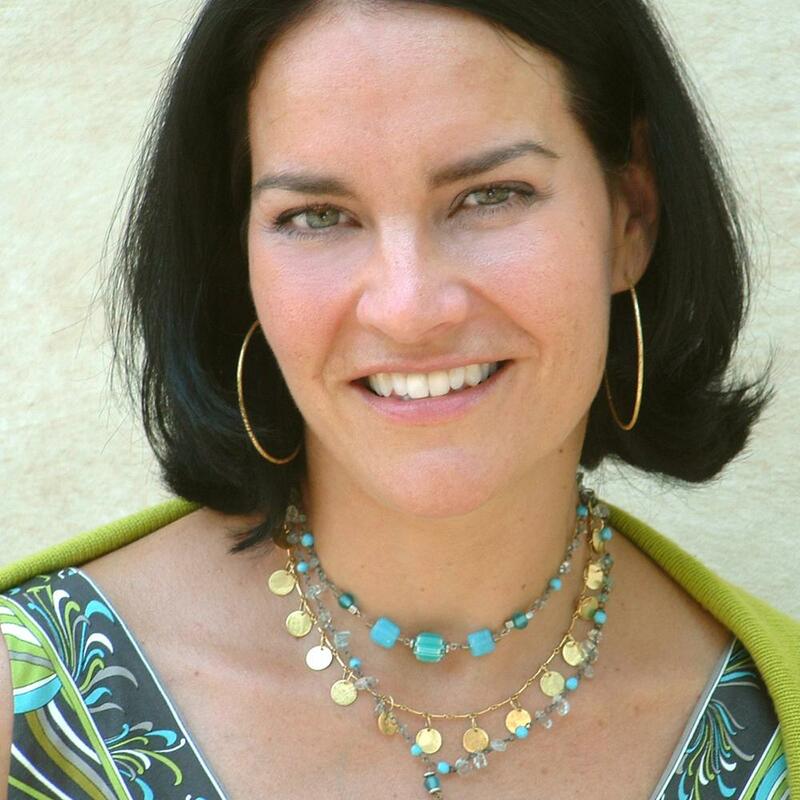 Her creative and elegant work is done with excellency and professionalism at the highest level. 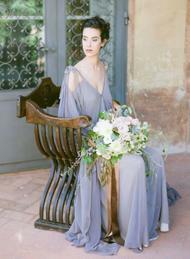 The incredible wedding gown in a soft purple tone evokes a dramatic and deepest emotion. 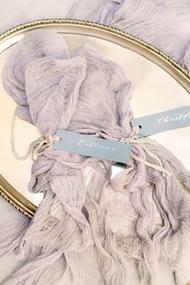 Its light texture and cascading design with loose ribbons tied at the shoulders is magnificent. 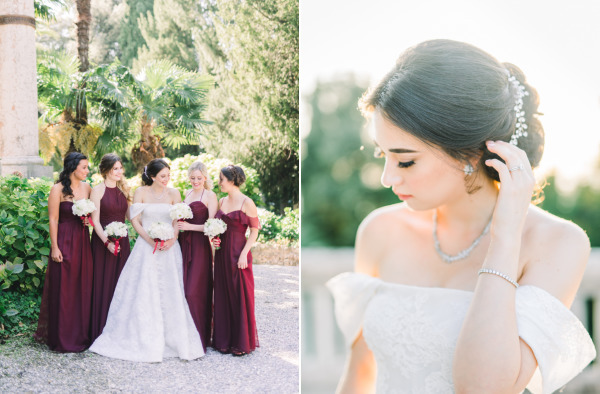 Giulia Cecchrini gave our bride Sara a slightly darker color on her lips and cheeks to complement Sara’s beautiful Italian dark hair and skin complexion. 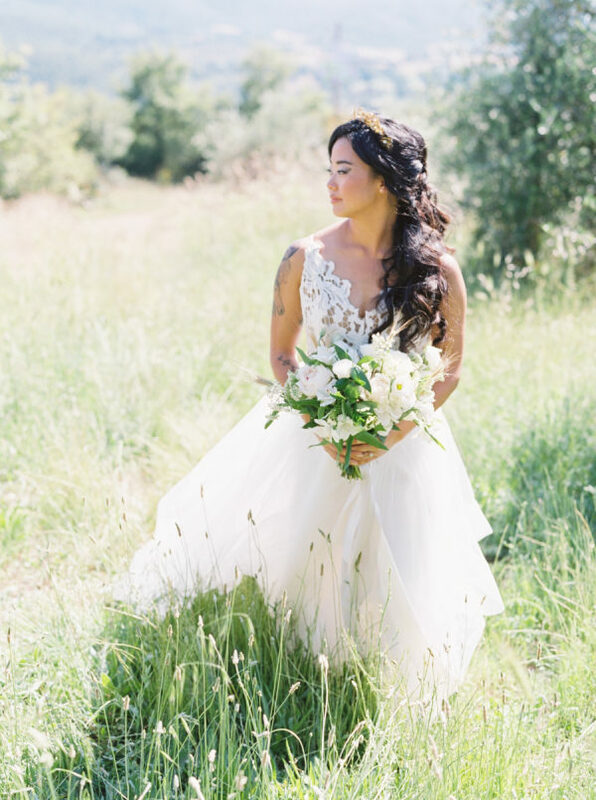 Sara’s loose up-do has romantic curls coming down to suggest the Renaissance style and to showcase the iridescent silk chiffon flowing Myrina wedding gown by Carol Hannah. 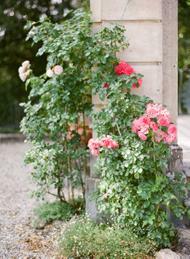 Romantic, loose and fragrant flowers by Jardin Divers harmoniously complement the Renaissance theme. 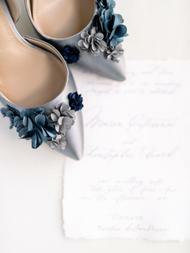 Jardin incorporated a variety of combinations of shapes and colors in her florals. 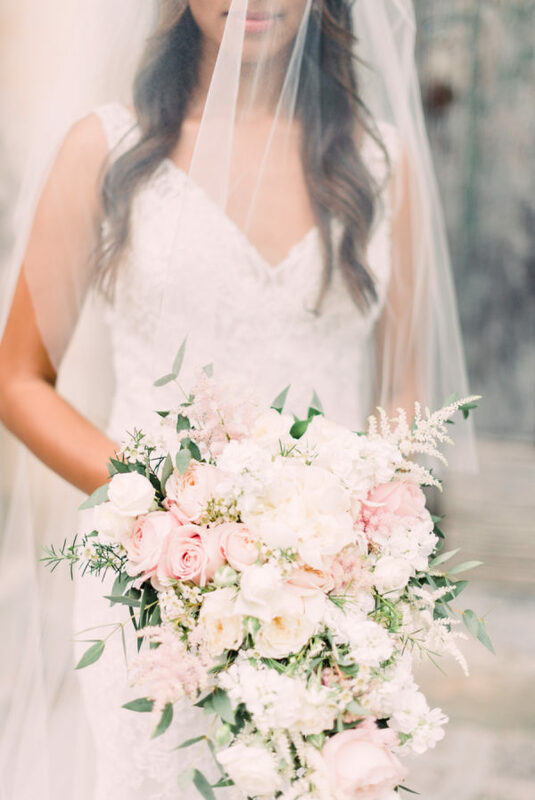 White and blush wild flowers, gorgeous roses, raspberries, all adorned with a the simplicity of a jasmine vine is a wonderful representation of an Italian elegance. 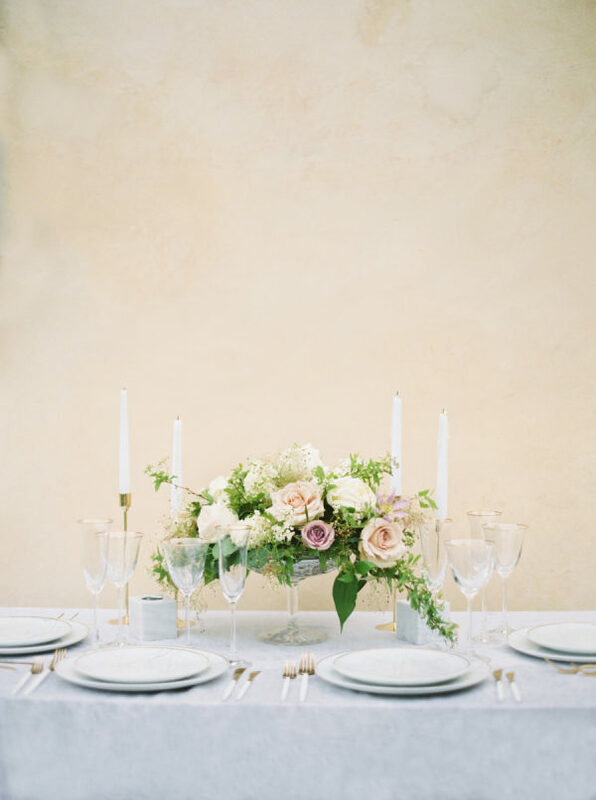 The contrast between the artful gold Florentine setting and simple and romantic florals creates the perfect balance for an elegant look. 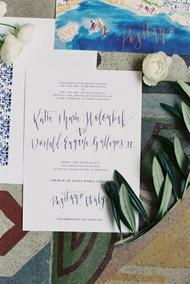 A unique paper suite by Esther Clark at Esther Clark Illustration & Calligraphy was inspired by the old-world Renaissance period. 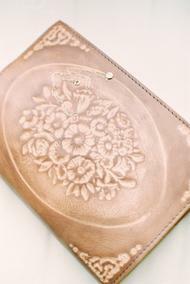 Esther uses delicate handmade paper with deckled-edges. 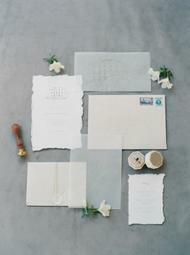 Love letter rolled up in a scroll is sealed with a gold jasmine flower detail. 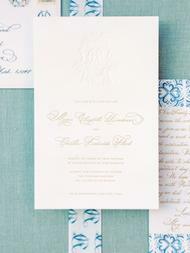 Lovely cursive font was incorporated into this elegant Leonardo da Vinci inspired invitation suite. Esther’s hand drawn sketch inspired by Leonardo da Vinci’s drawings is a stunning addition to the theme. 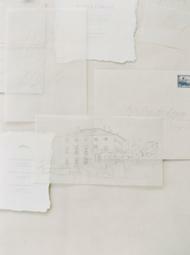 Esther’s Fine Art approach and talent is easily noticed. 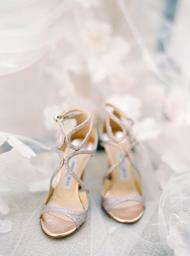 Fine Art wedding photographer, Anna, with Anna Grinets Photography, captured the elegant looks in a light and romantic style. 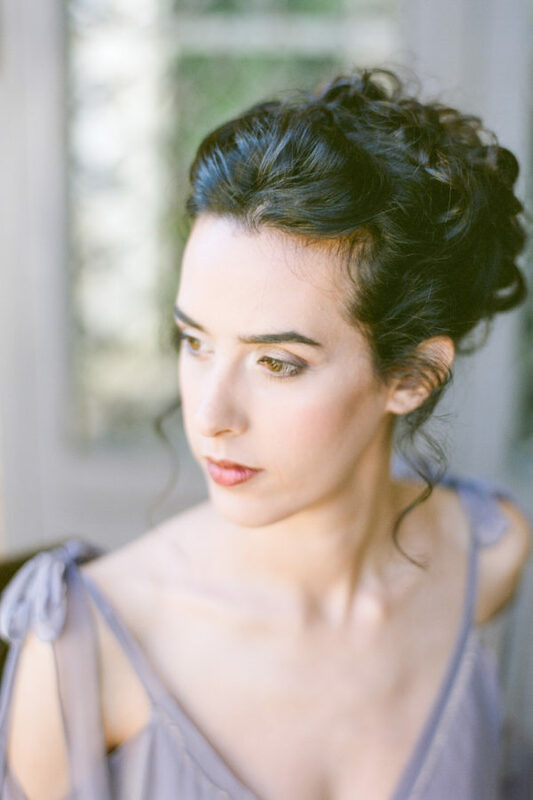 Anna achieves this look by using a medium format film camera, which makes her work stand out and gives photos a beautiful softness. 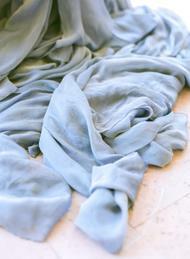 Her photography focuses on documenting emotions and creating stylish imagery in the highest quality. 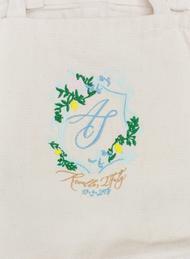 Anna’s work has been featured in publications and magazines in the United States and in Europe. 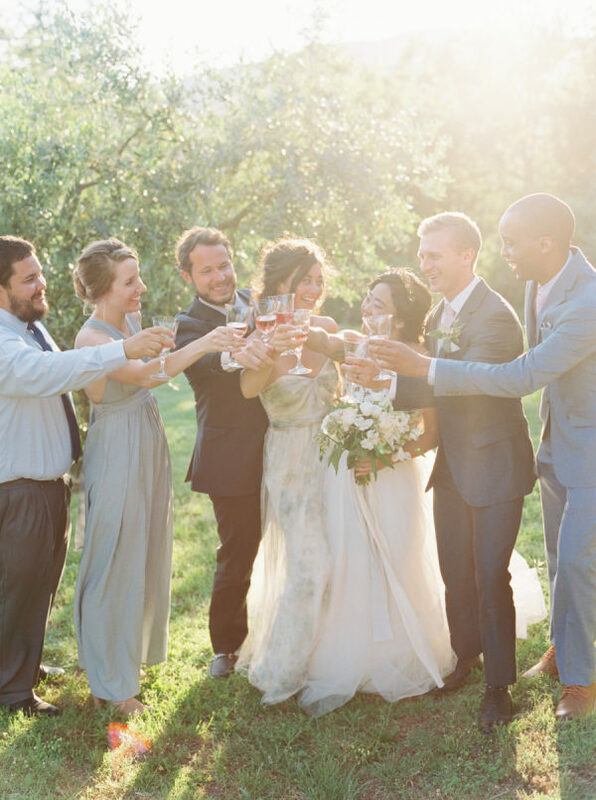 Each and every one of these artists would love to assist you in making your wedding dreams come true…. 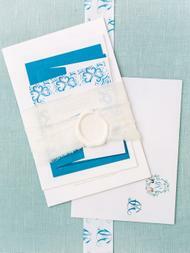 Look ’em up (and tell them we sent you)! 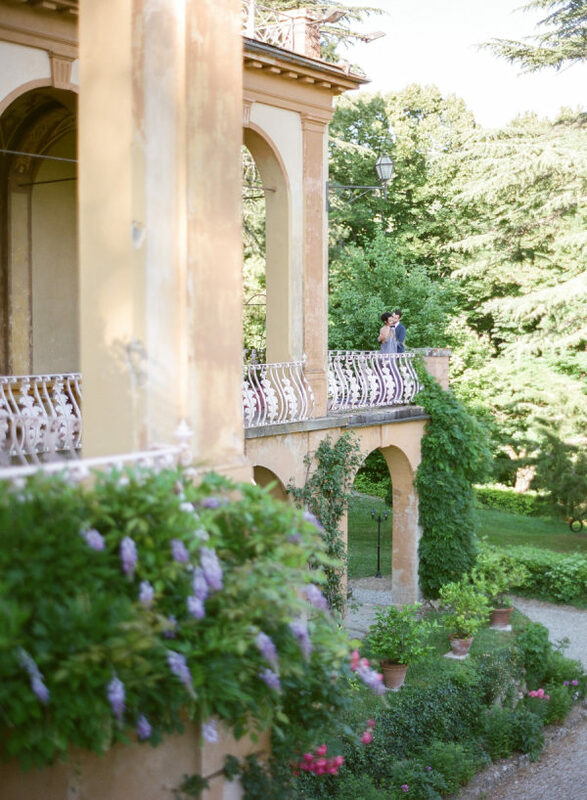 From Event Stylist Weddings by Silke… Come and join us to the intimate elopement of Erin and Michael which said “yes” in June at the magical Villa Montanare in Tuscany. 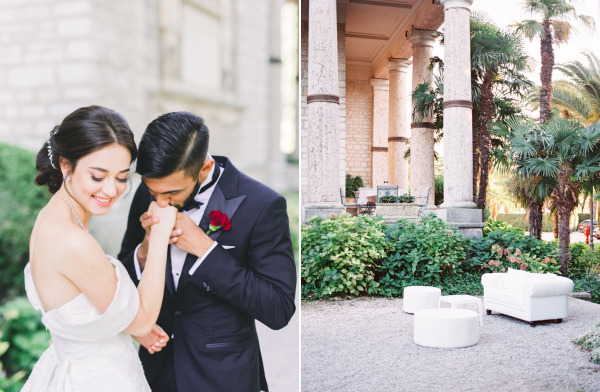 This sweet couple decided to make their dream come true just with a small number of guests in a laid back and beautiful atmosphere without any conventions. 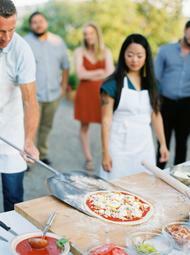 They started with a Pizza Party as rehearsal dinner and they loved the idea that each guest create a pizza by themselves and all guests share their own pizza creation. This was the best icebreaker and they had a really funny evening with the most delicious pizza and Italian salads. 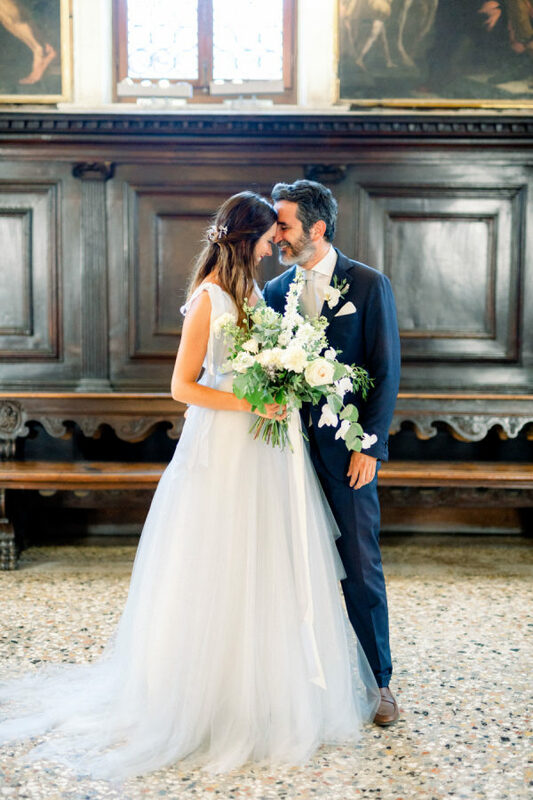 On their wedding day they started in the afternoon with the getting ready in the amazing lower floor of the Villa Montanare with the original floors of 1640. 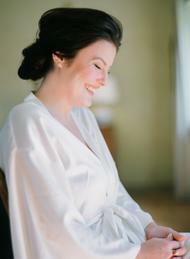 We loved to see how much fun Erin had with her beautiful styling and we felt in love with her amazing robe of Catherine D’Lish. 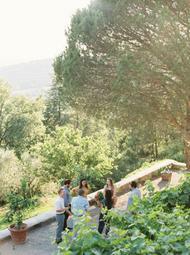 The intimate ceremony take place on the highest point of the olive gardens with an breathtaking view over the valley. 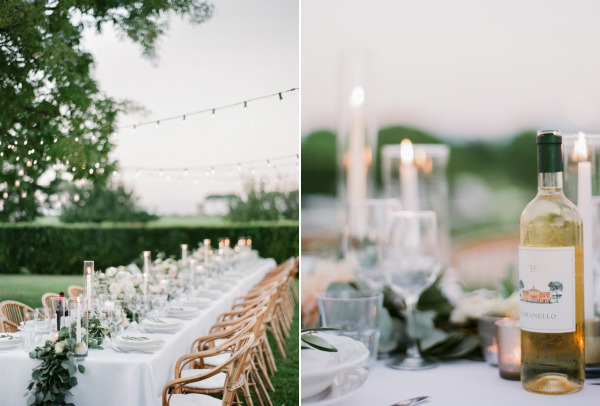 For the dinner they decided for the spot under the pergola with a stunning sunset. 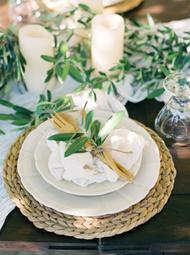 They liked to have everything in a very simple and organic style and we are overwhelmed about the prettiness of this dreamy tablesetting. 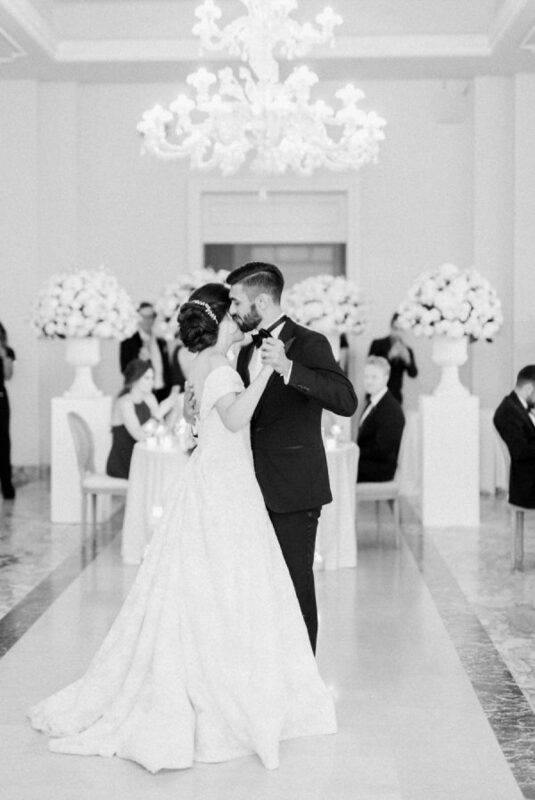 Do you ever find yourself swooning over complete strangers’ wedding films? Confession: we do this all the time. 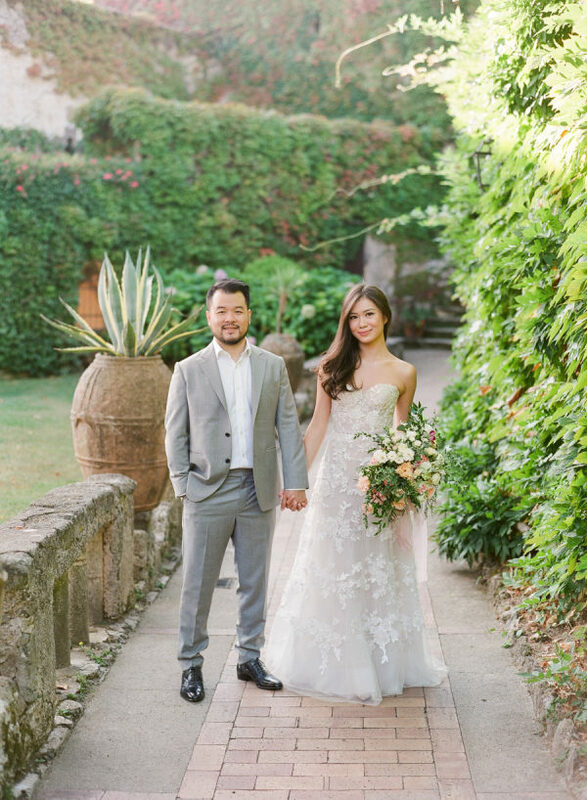 The thing about wedding films is that they bring a unique life to a set of wedding images and they are oh-so-romantic, just like today’s lovely cinematic treat by videographers Happy Together Films! 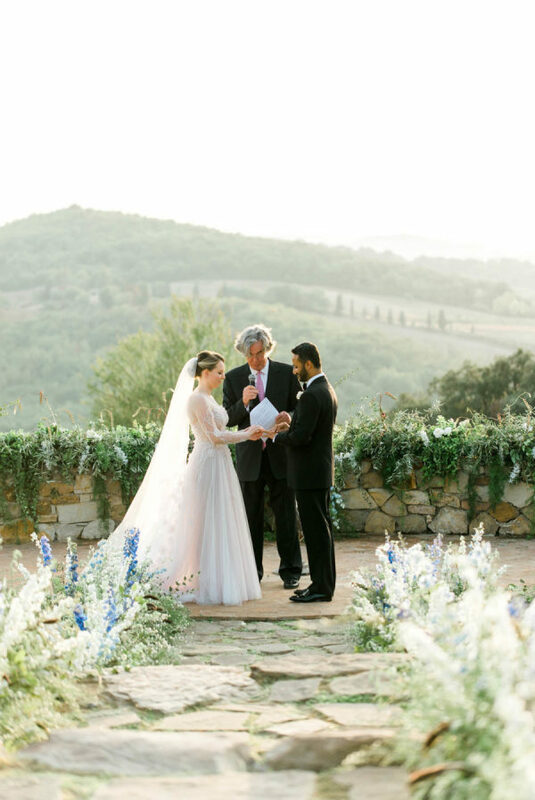 In an intimate setting, planned to perfection by Italian wedding planner Weddings in Tuscany, Natalie and Shane exchanged vows with the rolling hills and vineyards of Chianti as their witness…. From Happy Together Films… Natalie and Shane had this dilemma. 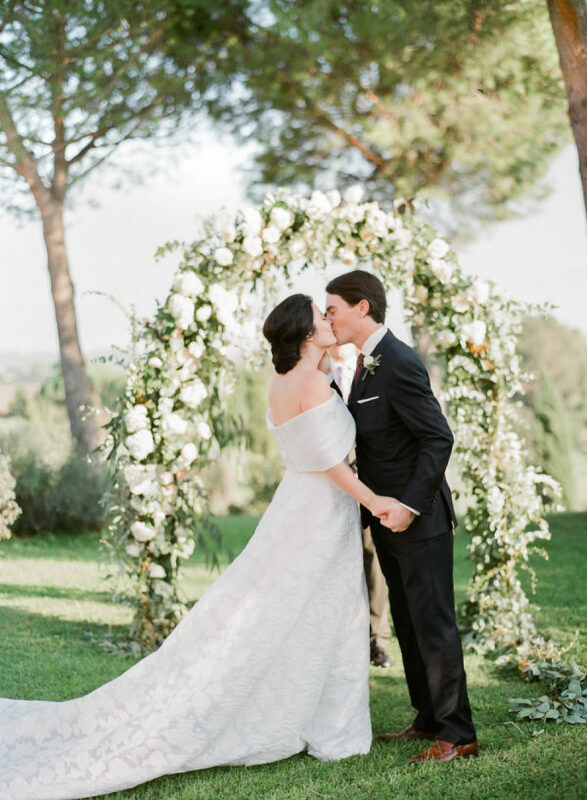 They opted for a really small destination wedding in Tuscany with their nearest and dearest loved ones. 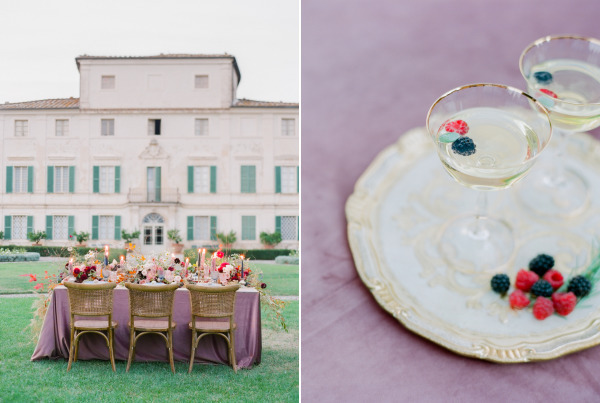 With a small guest list of only twelve, they were able to celebrate in style. 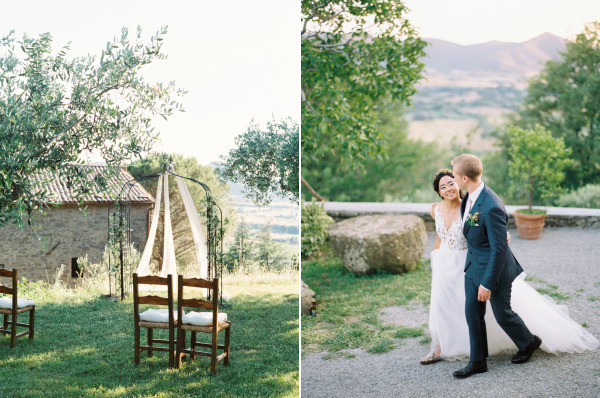 The place they found for the cerebration was in fact a very alternative venue, a countryside house in the middle of the hills and vineyards in Tuscany. 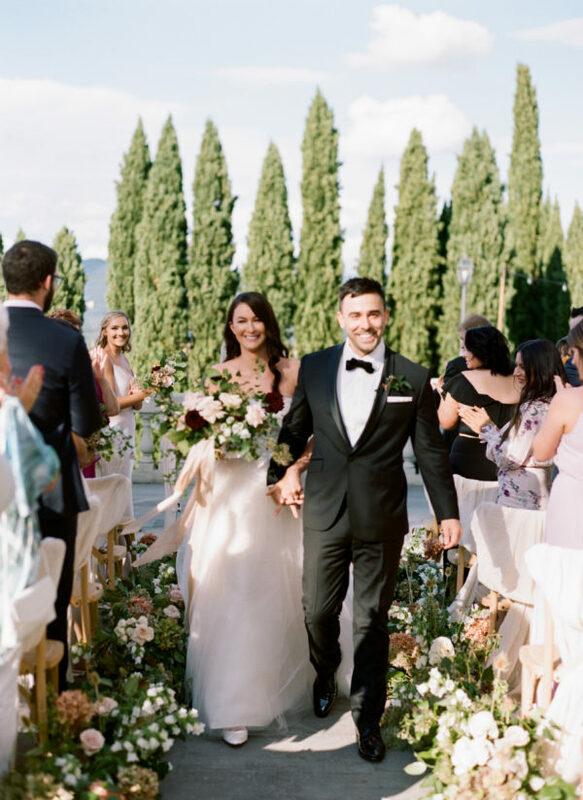 Since Natalie and Shane’s group was a small number of family and friends, they booked a local restaurant with an amazing Italian menu. Ohh, we remember it so well, the food was so so delicious. And the wine… no words. 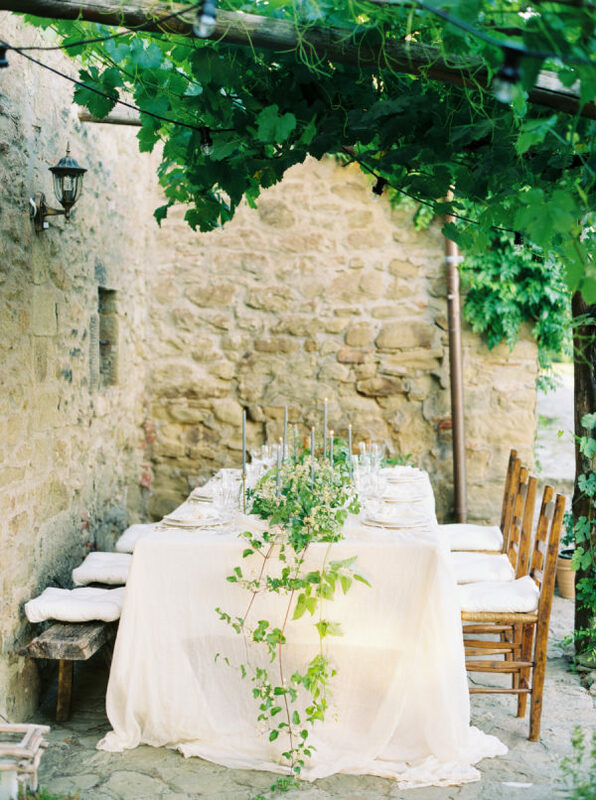 The perfect menu for small destination wedding in Tuscany. 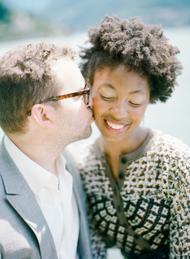 Natalie and Shane were very sure about going small and intimate. 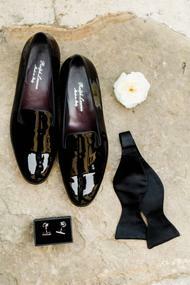 To help them achieve that, they hired a local wedding planner team to deal with all the logistics of the day. 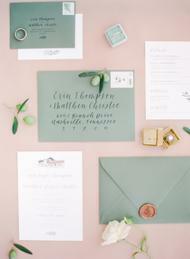 As they are from Australia, it was crucial to be able to trust a local wedding planner to help them plan from afar! Skip what is not important for you, don’t waste your energy in traditional wedding steps if you don’t want them at your wedding. 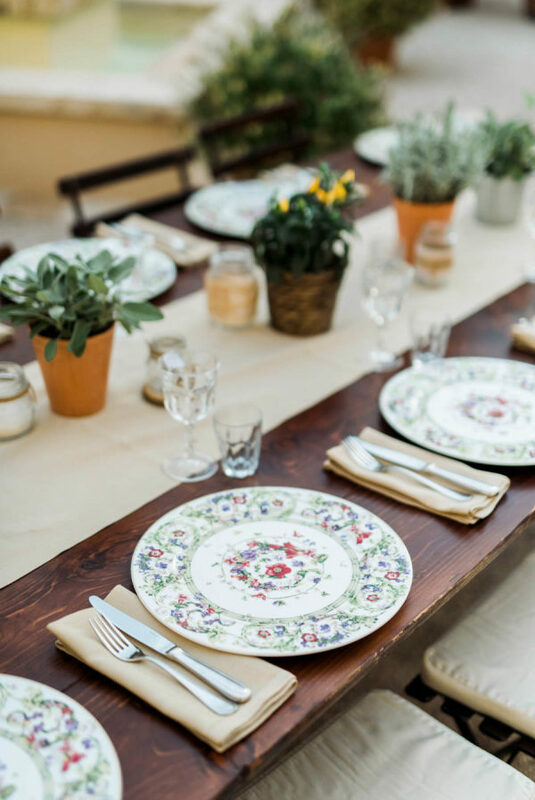 If you only have 10 or 20 guests, you probably don’t need formal invitations, it might be lovely to personally call each one to invite your guest. 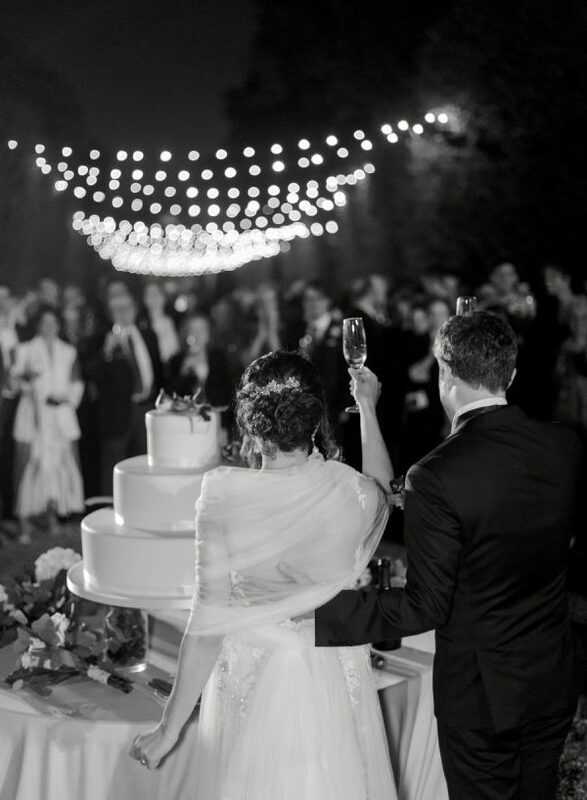 If you won’t have a big band playing, big set of party lights and a big cake, you may extend your wedding for one more day with your small group and experience more quality time with them. 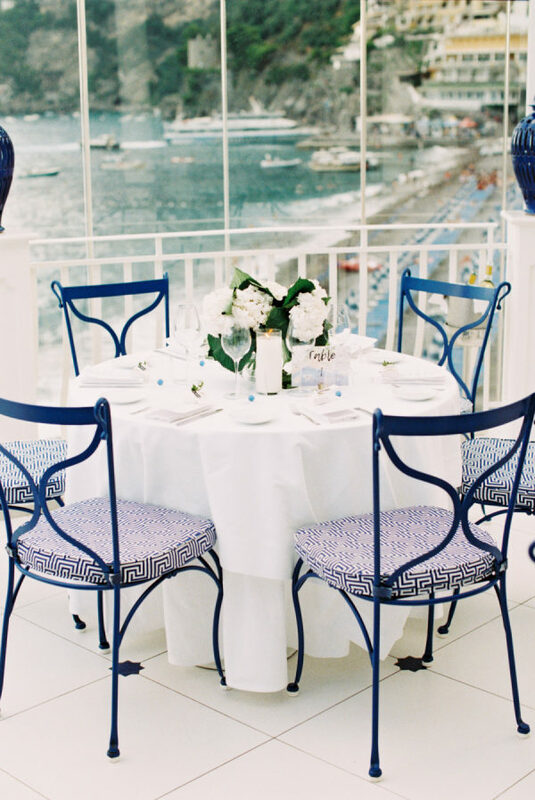 Wisely spend your budget to enhance what’s more important to you and creating an unforgettable experience for you and your guest is what every couples wishes. 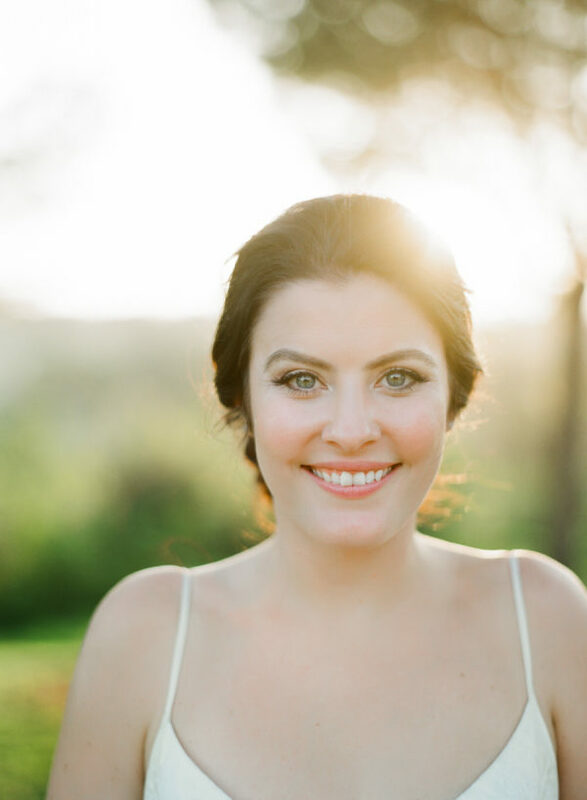 We are so thankful to Natalie and Shane for inviting us to be part of such a small and intimate group of people and be their destination wedding cinematographer. 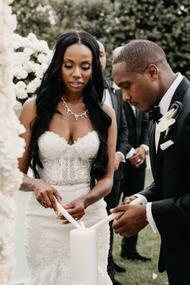 It was a pleasure being there and witnessing your super sweet wedding vows. 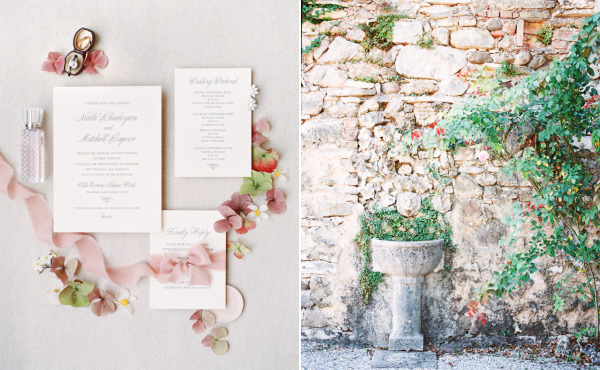 Next to tiny weddings and sheer wedding dresses, destination celebrations are by far the most popular trend on SMP. And guess what? 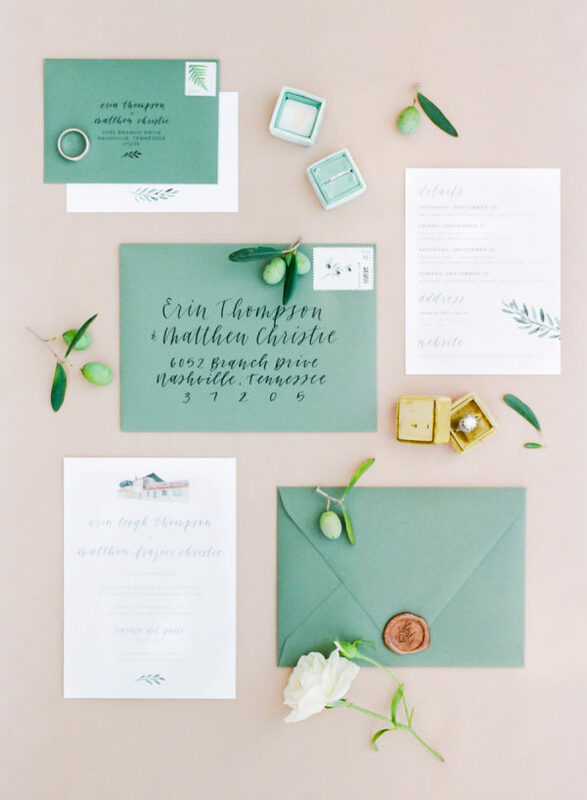 This gorgeous affair features all three of those very trends and does so in a way that will easily turn said trends into timeless must-haves. 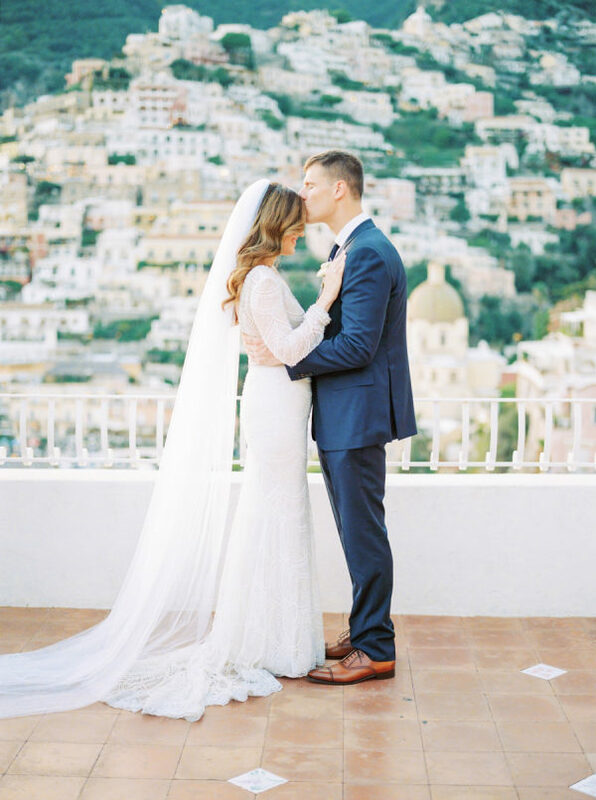 Set against the backdrop of Positano, Italy with a gown fit for a princess and a groom who is so clearly in love, this wedding was built by friends and family and a tiny but mighty group of destination vendors – like Carmen Santorelli behind the camera and The Amalfi Experience helping with coordination. 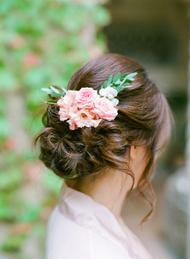 And the result is the kind of loveliness that we crave all. day. long. 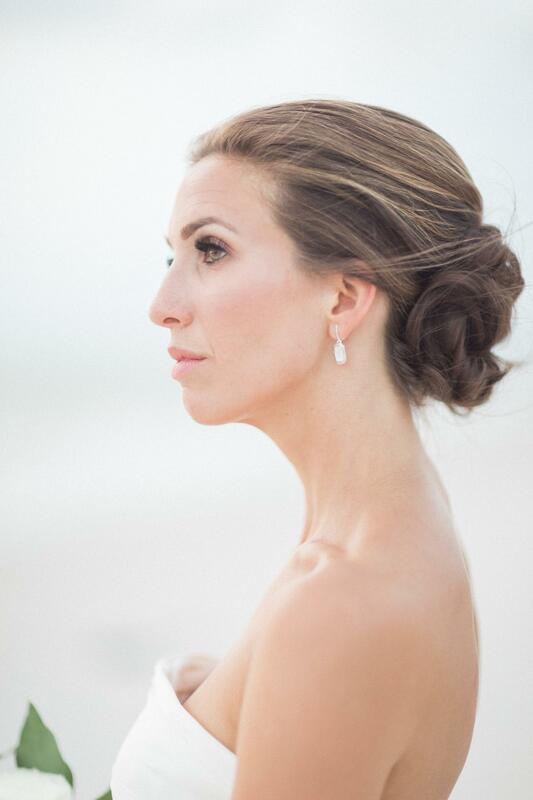 From the Bride…I feel so fortunate to tell people that we wouldn’t have changed a single thing when looking back at our wedding day. Donny and I have always been up for an adventure. After reloading halfway across the country, we knew that neither of our home towns were fitting for our wedding. 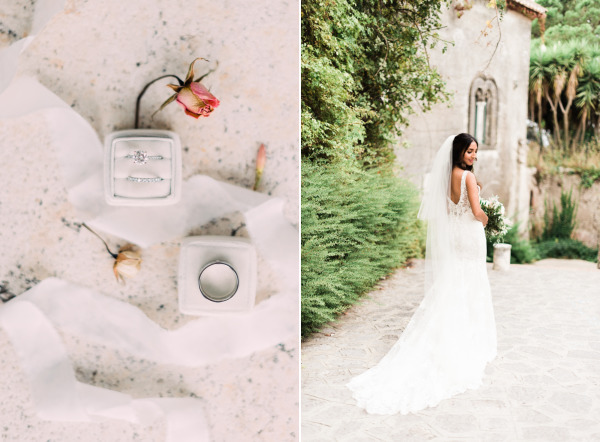 We always knew we wanted to do something a little bit out of the ordinary, and little did he know, before he proposed, I already had my heart set on a European destination wedding. Really for us there were only a few things that were a MUST: A Catholic Church, close to the beach, intimate, and anything but a standard “check the box wedding” for our guests. 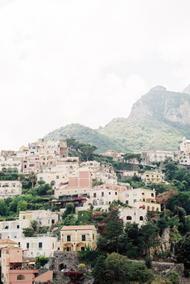 When I started scrolling the internet for a location, Positano couldn’t have been more fitting. 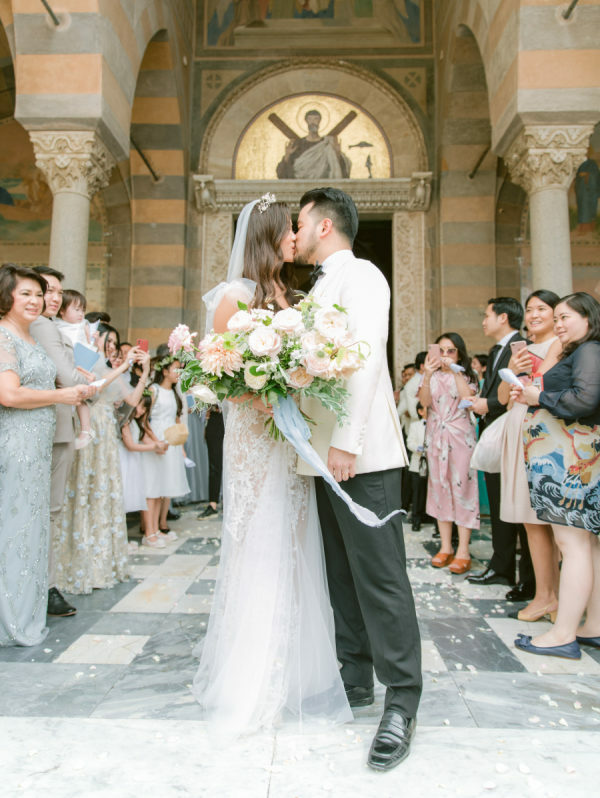 The Church of Santa Maria Assunta was located steps from the beach, Rada Restaurant overlooked the ocean, and there was a discoteca located on the lower level of the restaurant. Perfection. 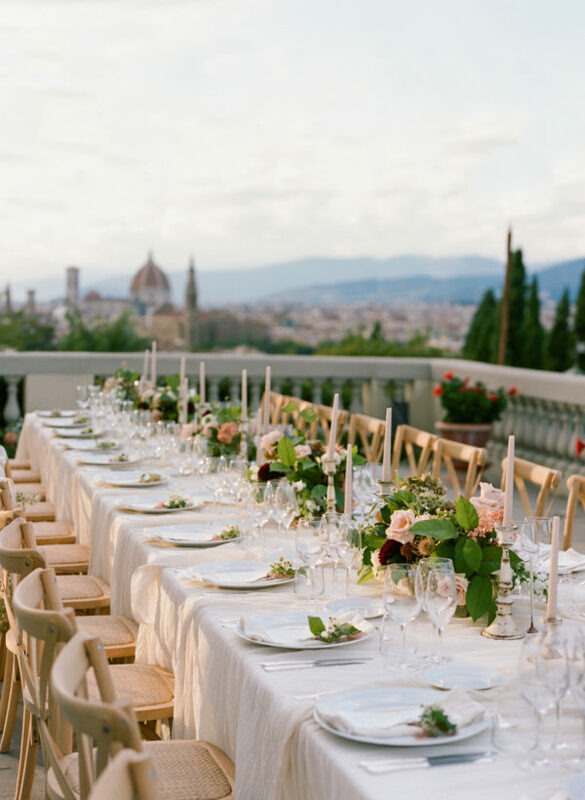 Don’t get me wrong, planning a wedding across the world wasn’t always easy, but we stuck to a timeless romantic theme and took advantage of the beautiful Italian elements. 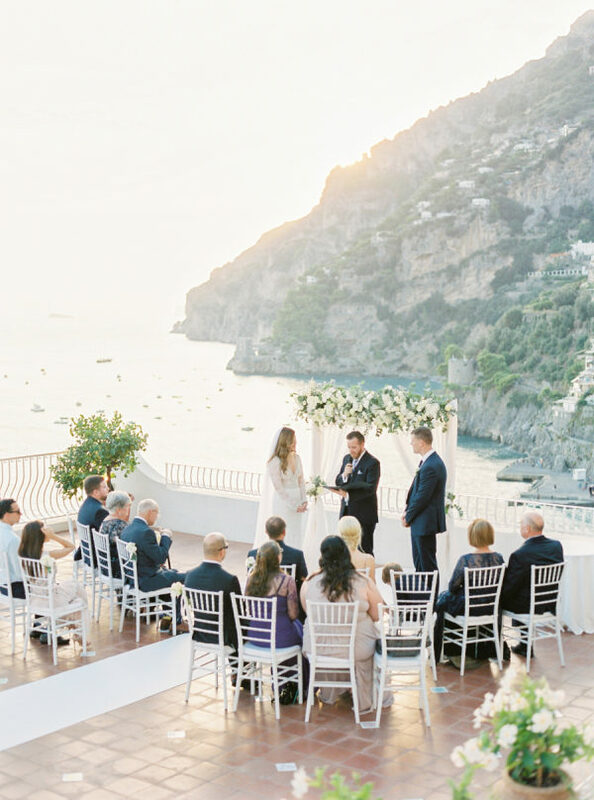 After deciding on the church and location for dinner, I hired The Amalfi Experience to help with reservations and day of coordination. 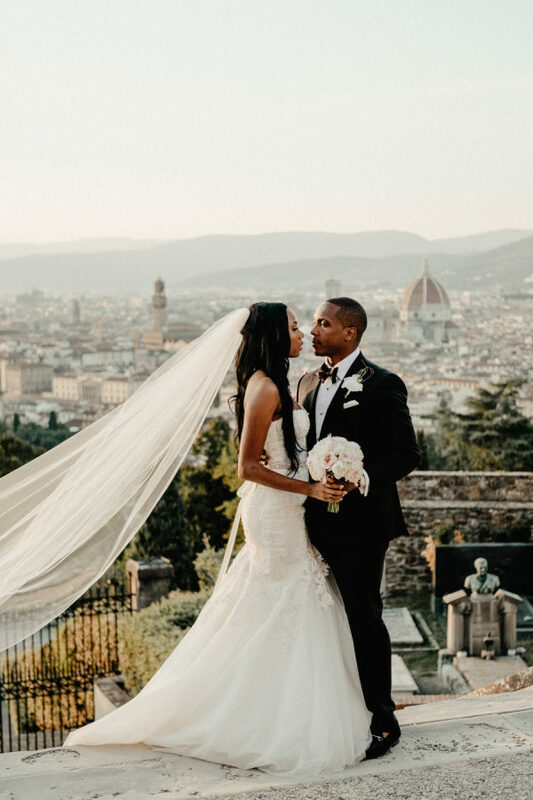 I knew I wanted to let the Italian backdrop speak for itself, therefore, we kept things simple and did most everything on our own. 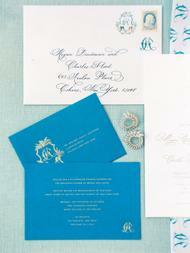 Our invitation suite was created by one of my college girlfriends Libby from “Libby Rae Studio”. 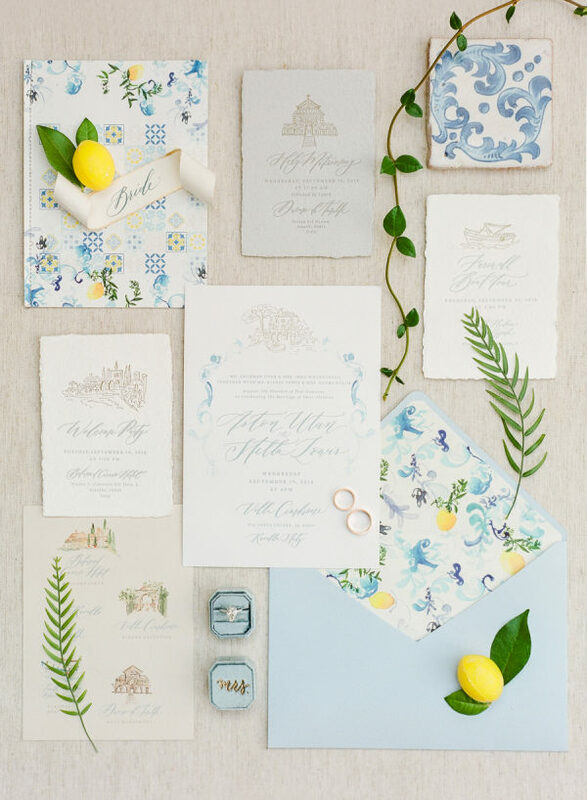 She brought my vision of Italian tiles and lemons to life in our crest and watercolor details page. 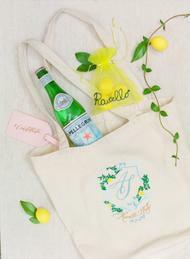 I ended up using her designs throughout the entire event including welcome gifts and day of stationary. 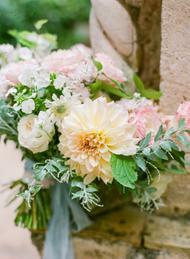 Looking back, one of the funniest and most chaotic parts of the entire day was regarding flowers. 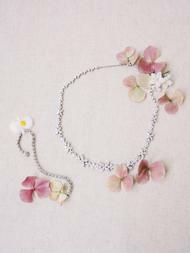 My mom has prior floral experience, and we thought it would be fun to design and decorate ourselves. 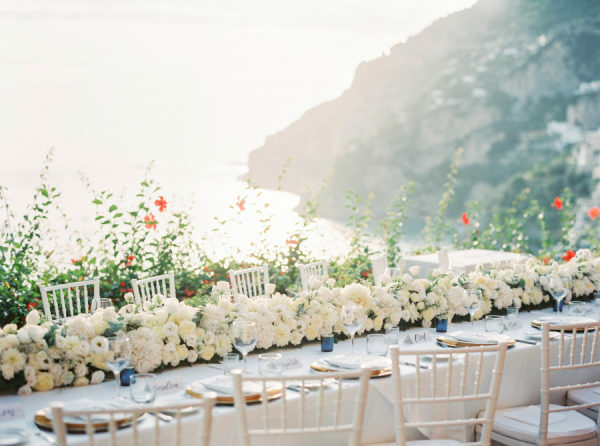 We put in a large loose flower order and the morning of the wedding my dad hiked up the streets of Positano to grab our order, which of course, was at the very top! I have to thank my sister-in-law and best friend for helping decorate the restaurant. 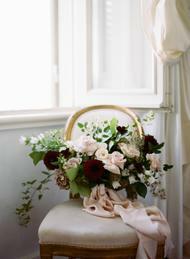 And then the two of them, plus my mom, for creating my beautiful bouquet minutes before our first look. 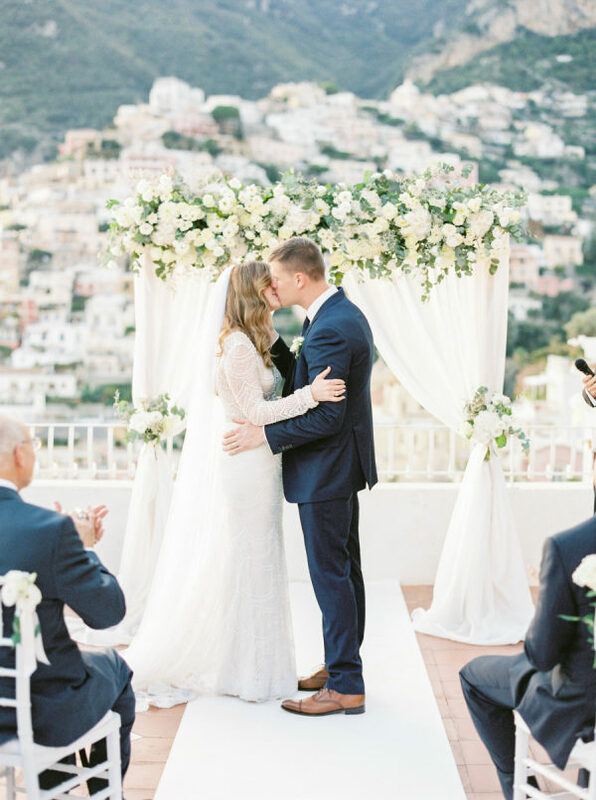 Yes, we got married in Positano, Italy, but for us it was much more than that. We accomplished our goal of creating a unique experience for those that mean the most to us. All of the right people were there and the trip was exactly what we wanted. 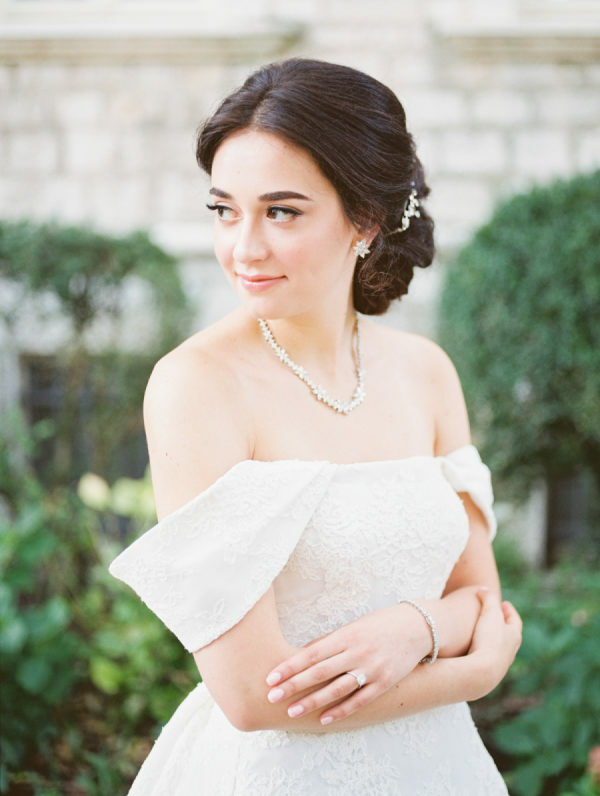 I am so thankful we chose Carmen to capture every single moment in the most genuine fashion. 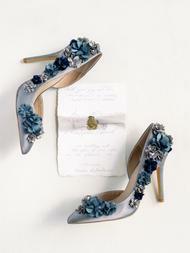 Do you remember this wedding? 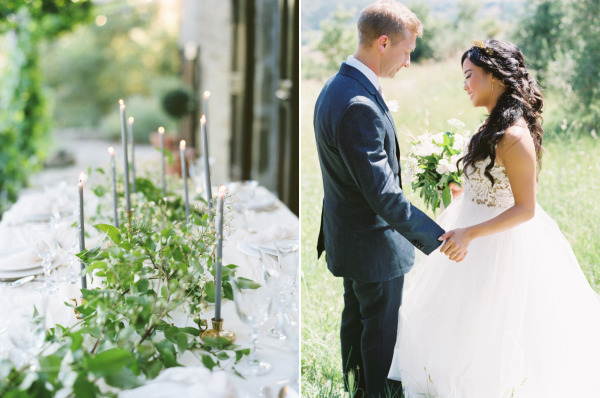 A California affair infused with personality, culture and the sweetest Bride and Groom. 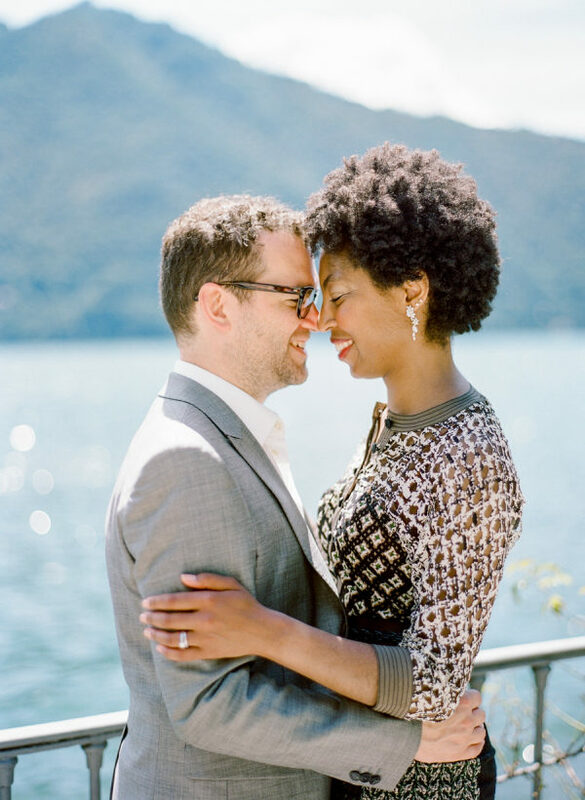 Fast forward three years and this crazy cute duo is celebrating their wedding anniversary in style with a trip to the shores of Lake Como and the talented Rebecca Yale in tow. 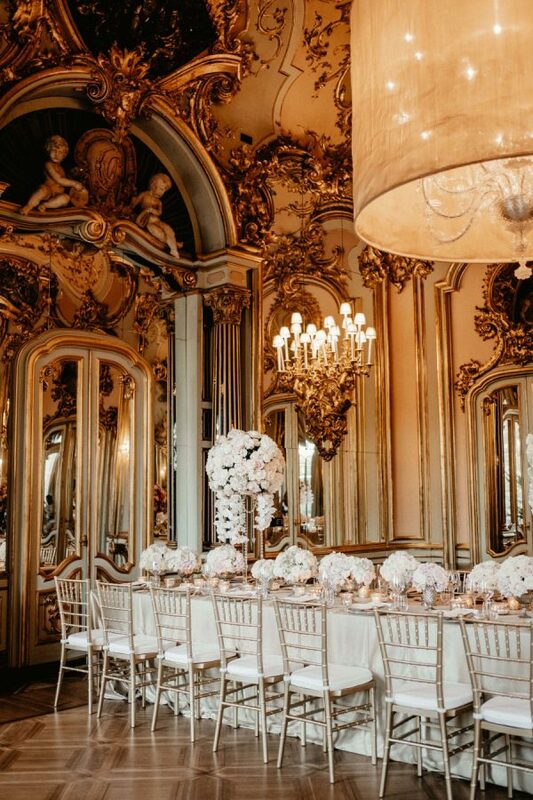 I mean, how stunning is this gallery? 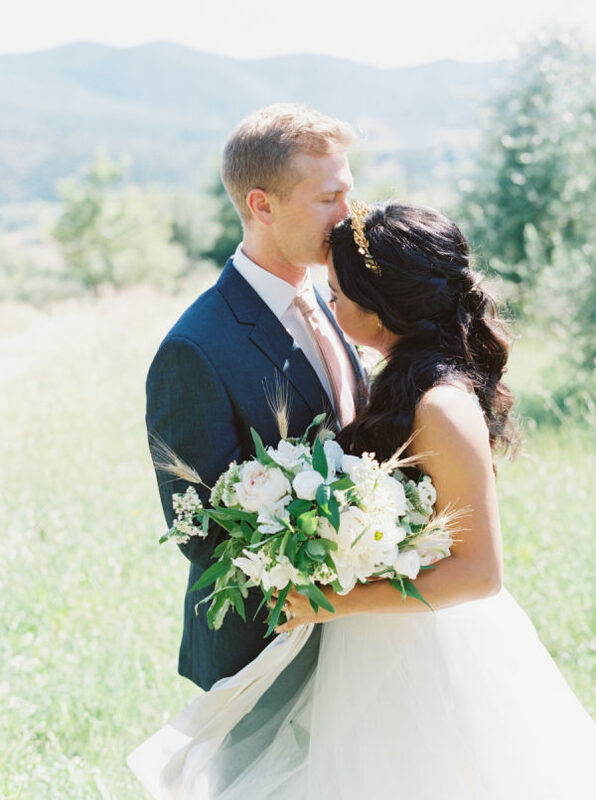 From Rebecca Yale Photography… I had the pleasure of photographing Alex and Bridgette’s engagement session three years ago at the beautiful Italian inspired Sunstone Vineyard in Santa Ynez (which was featured here on SMP) so it was only natural that we headed to Italy to photograph their anniversary session! 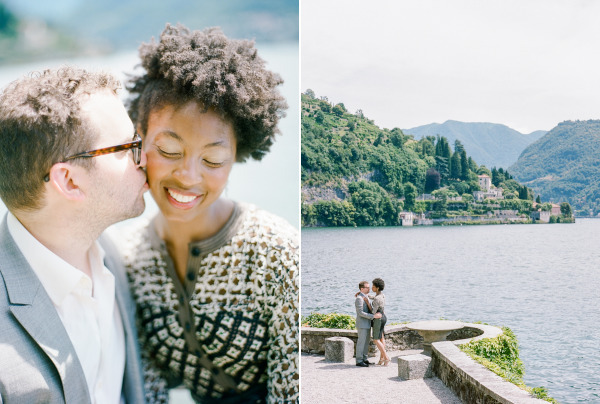 We spent the week exploring Como with friends taking an afternoon at the gorgeous Villa D’Este to capture some portraits in honor of their two year anniversary. 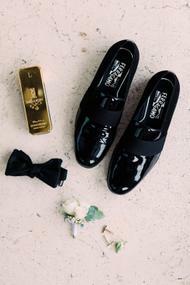 The bride and groom made the occasion a little more special by wearing a darker version of the same dress she wore at her engagement session as well as her wedding shoes, while the groom brought along the same suit he wore at Sunstone.